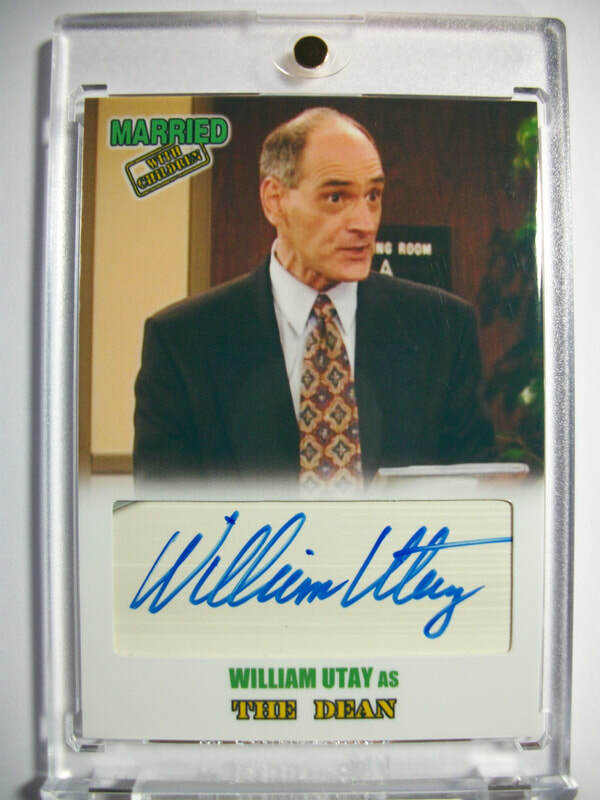 Chronicled below are my most recent autograph signings and TTM requests that I have sent to some of my favorite characters from the show. 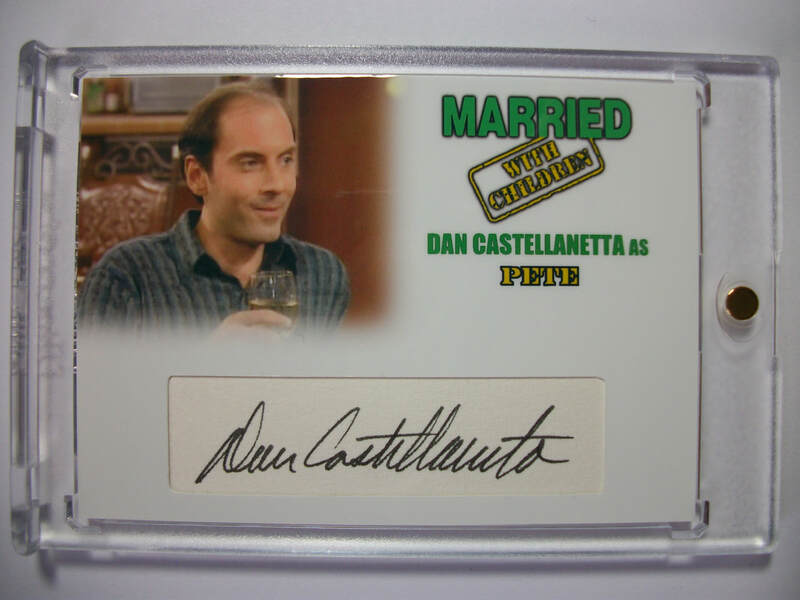 I truly enjoy making these cards and taking time to write each person. 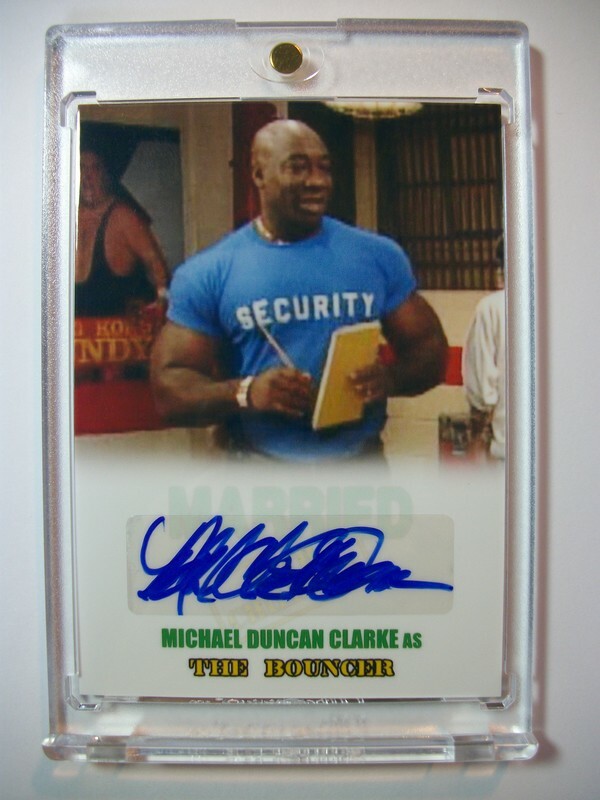 I would like to give a huge THANKS to ALL of the celebrities and professionals that have taken the time to sign and return my cards. My collection would not be the same without you! Another awesome surprise arrived a few weeks ago. 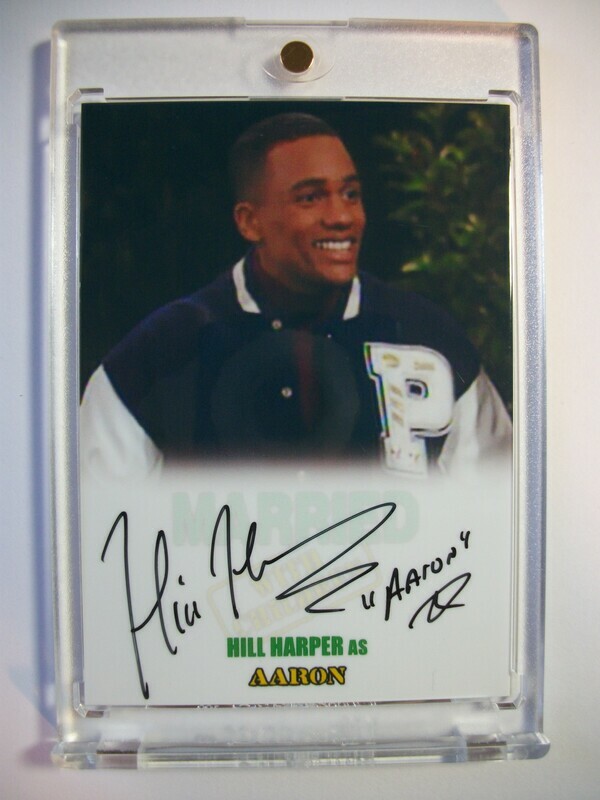 A super big thanks to Hill Harper for signing my custom cards. 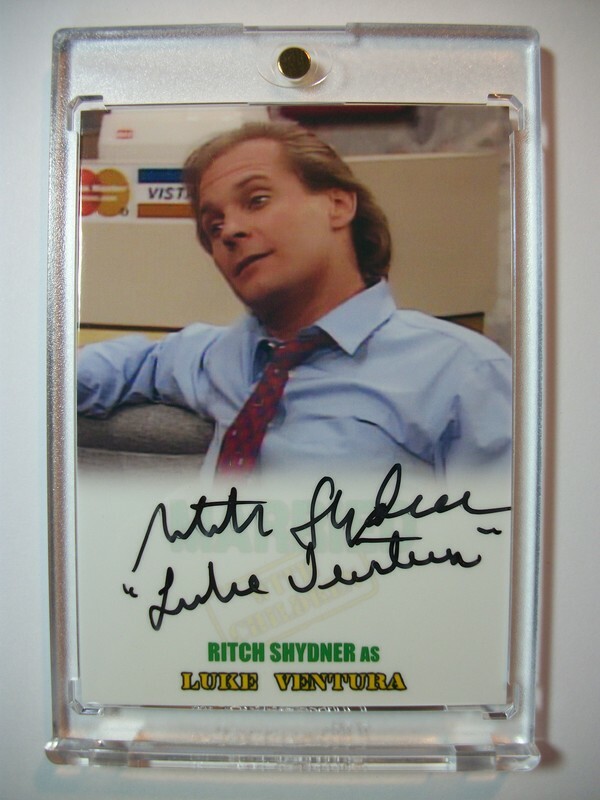 I jumped the gun and created one already with a certified autograph I purchased. I'll be honest the ones he signed for me are soooo... much nicer. 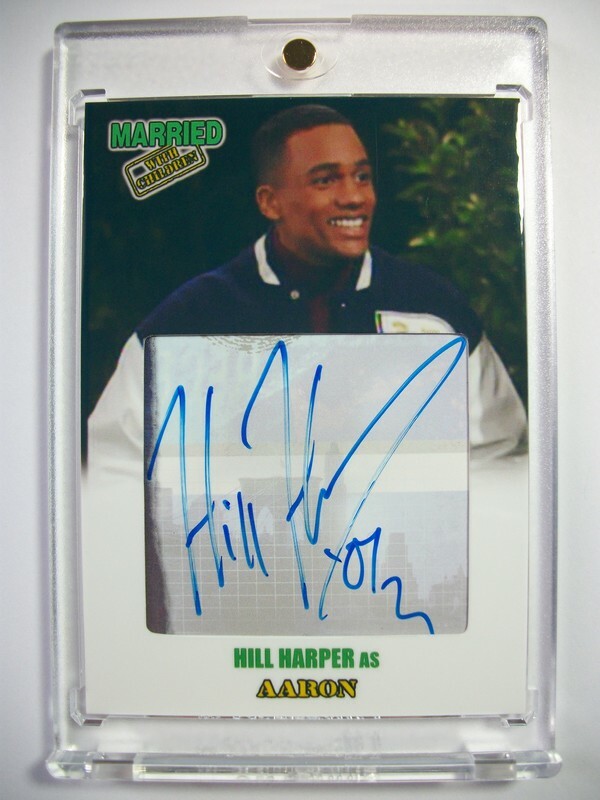 It was actually sent to Mr. Harper about a year ago. 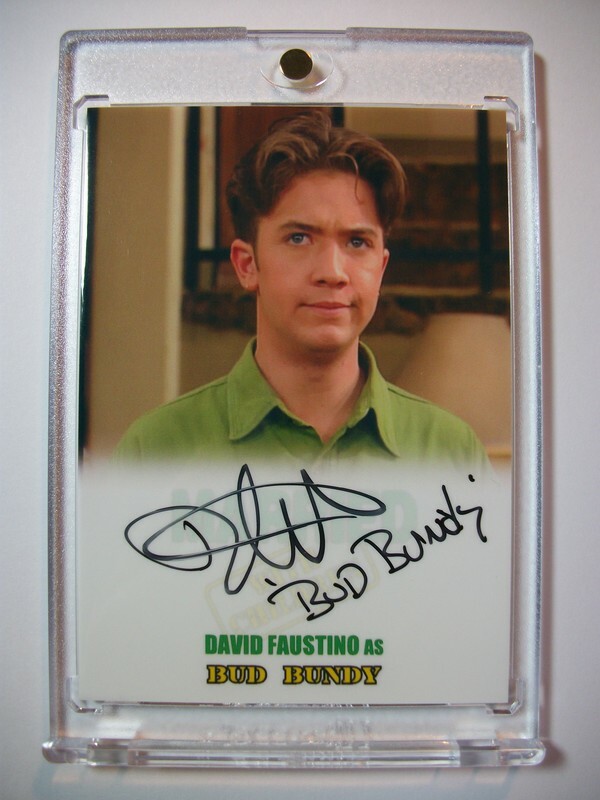 He was kind enough to pay the difference I was short due to the postage rate going up within that time. 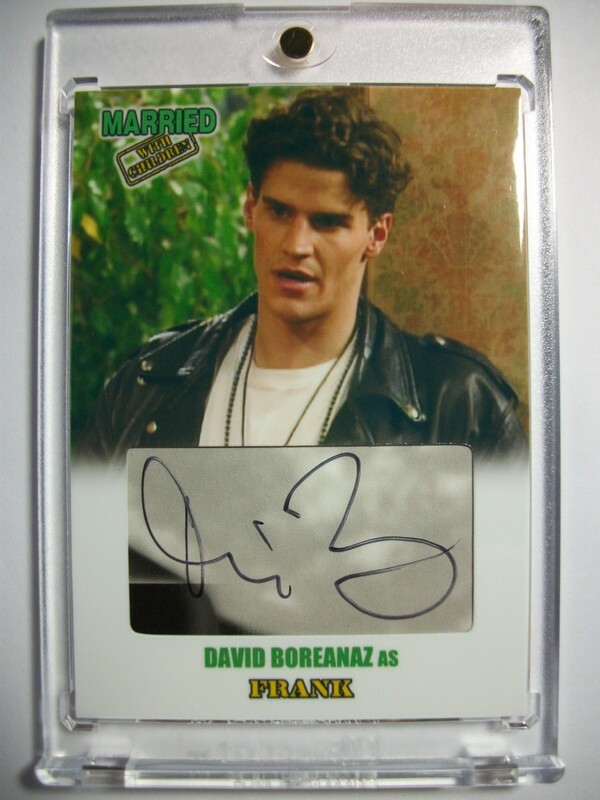 ​A beat up self addressed bubble mailer showed up in my mailbox today. I have a few unanswered requests out there, so I had no idea who it was until I opened it. 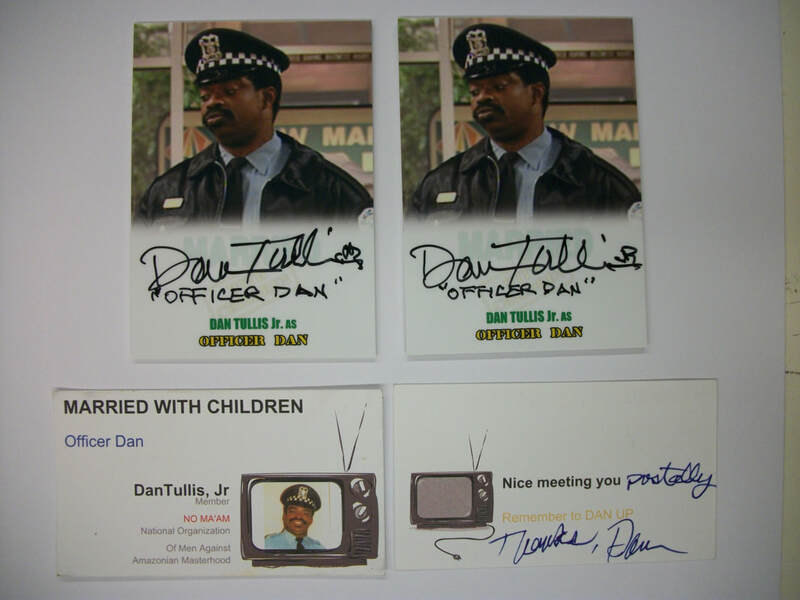 I sent a few cards out to Mr. Dan Tullis this same time last year. 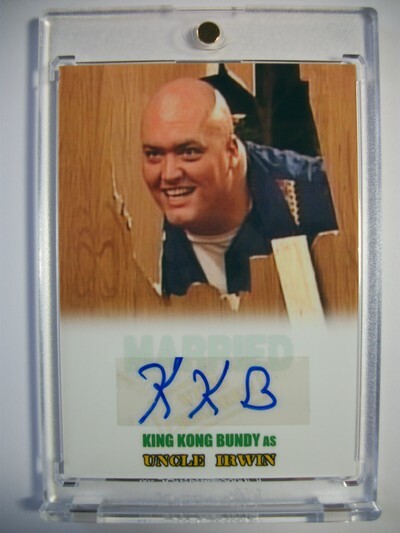 My first package was kicked back to me as unknown address. 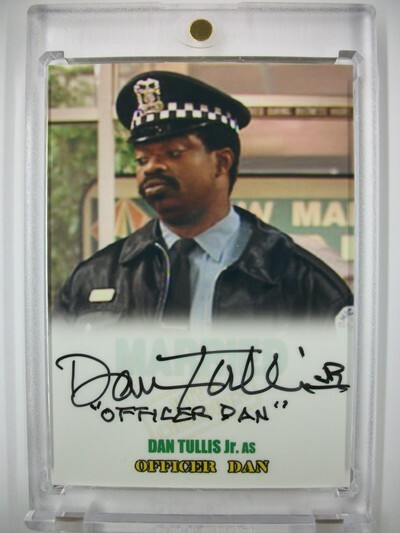 I dug a little deeper and came up with another possible address for Mr. Tullis. This was one the first rounds I sent out in hopes of a response almost a year ago. 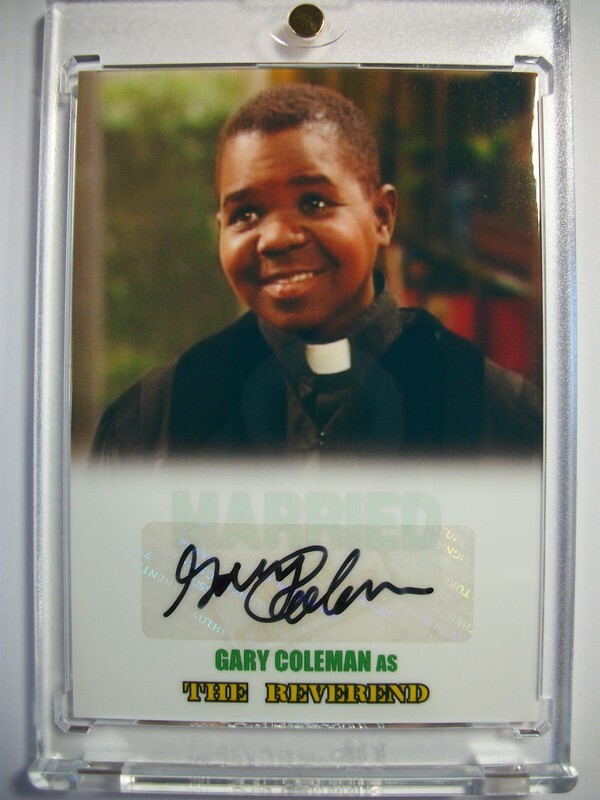 I figured maybe it was lost or he just didn't want to sign it...who knows? I'm not absent minded to the possibility that some celebrities refuse to embrace certain characters or roles they once portrayed for whatever reason. I don't think this was the case though as two business style cards were included. 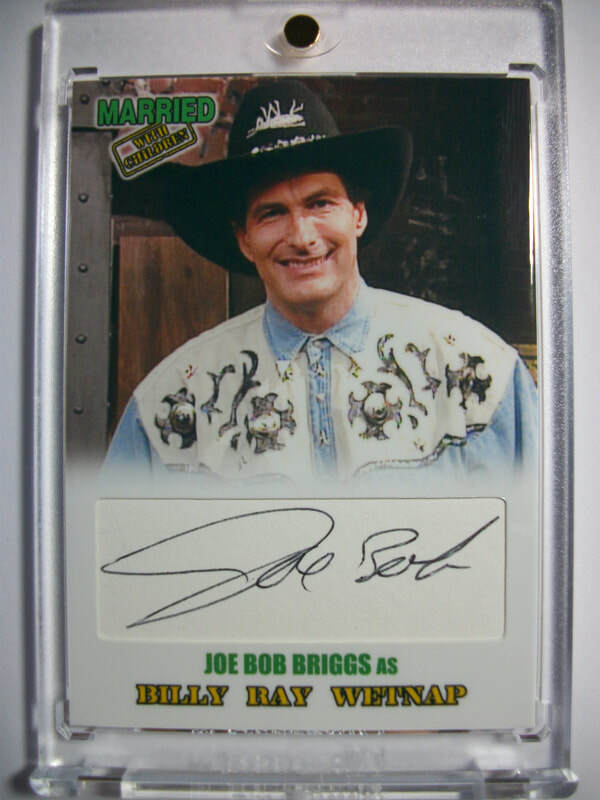 From the looks of the bubble mailer I'd say my Post person found it underneath their seat 10 months later. 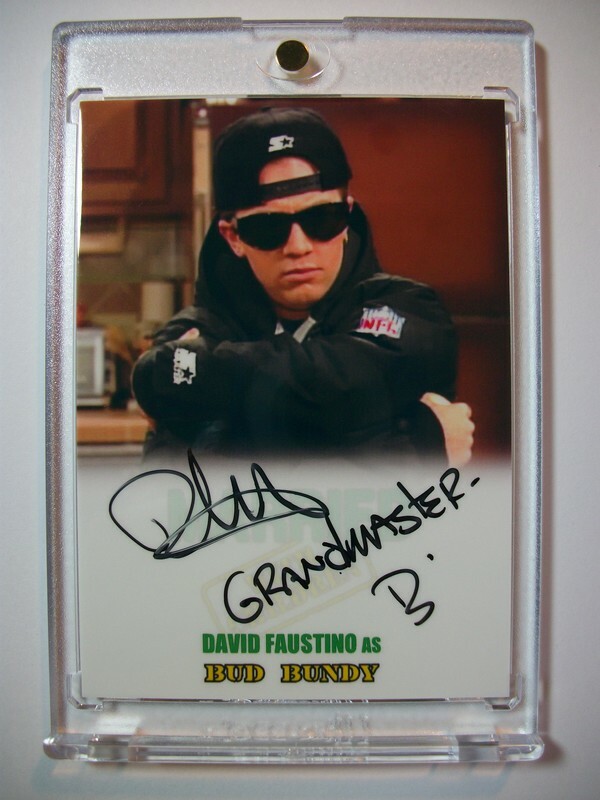 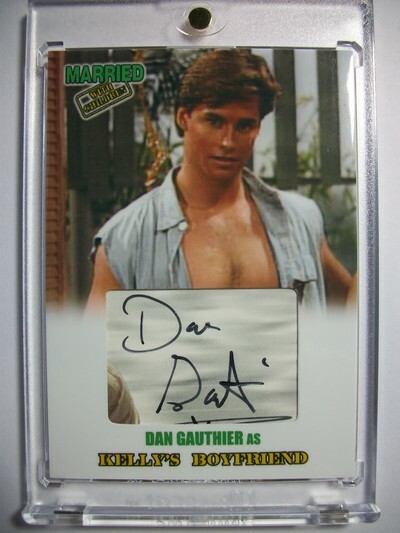 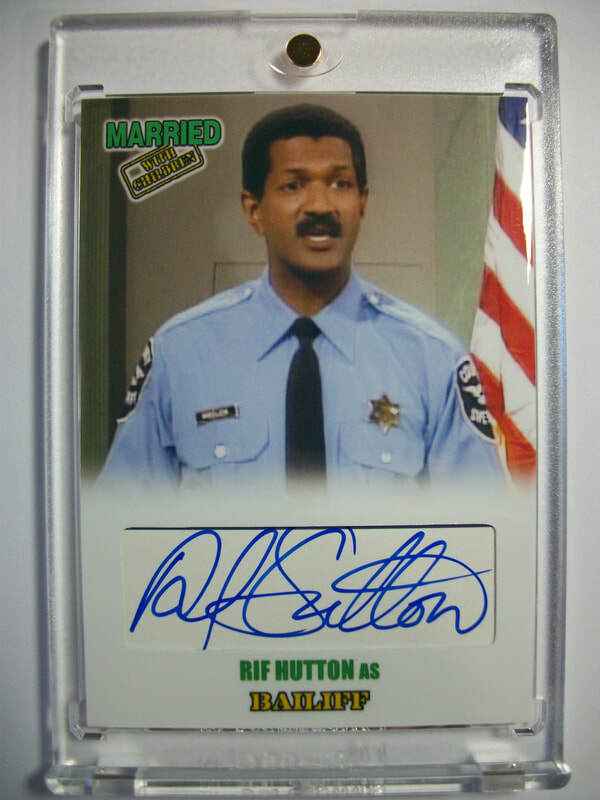 In any case a huge thanks to the classy Cop and NO'MAAM member Officer Dan for signing my custom cards. 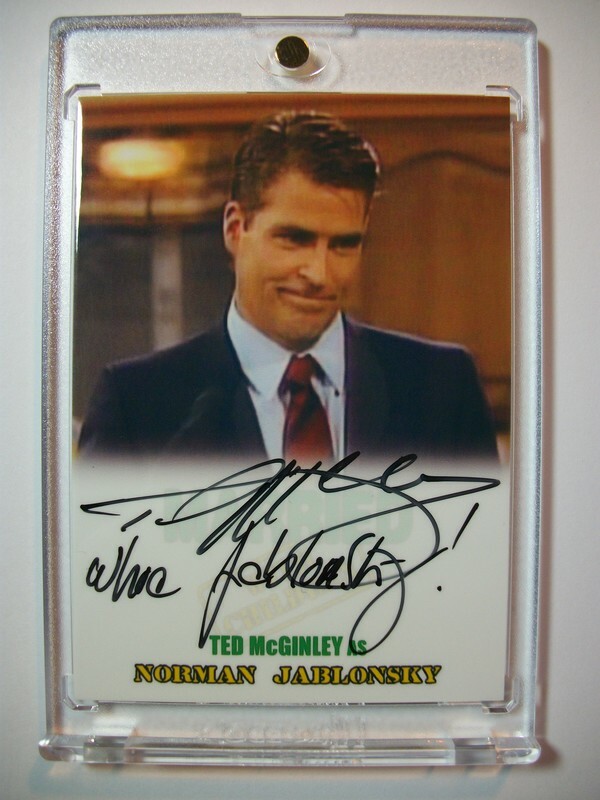 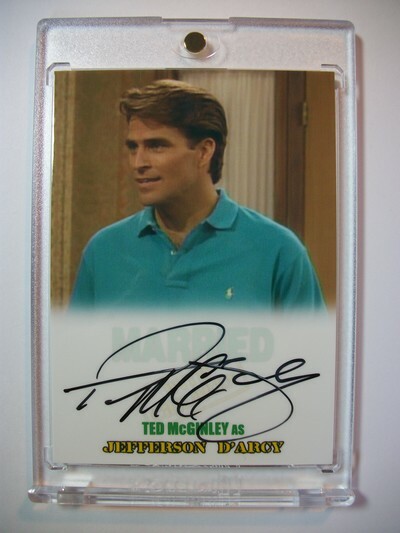 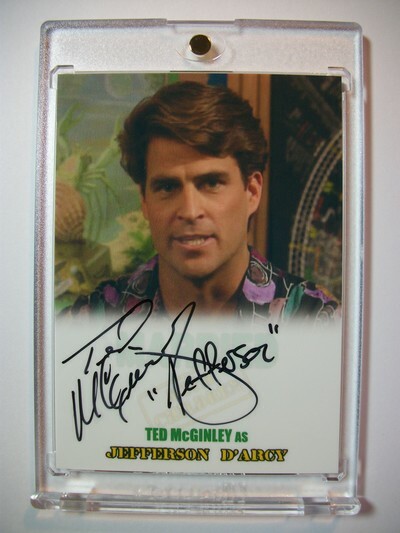 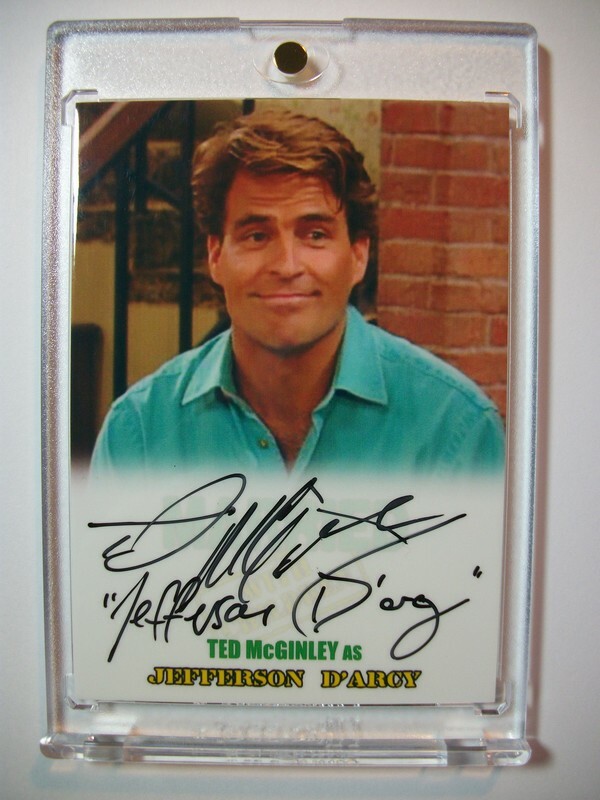 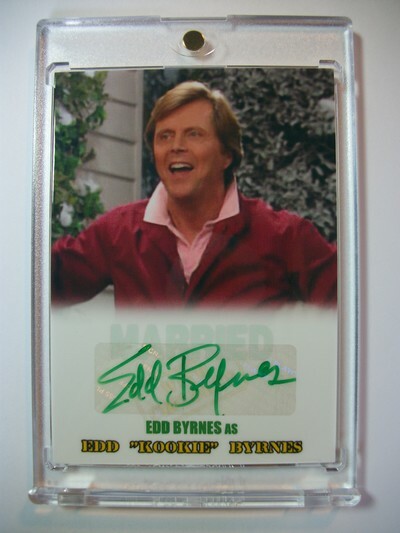 A really BIG thanks to Mr. Ted McGinley for taking the time to sign all my cards. 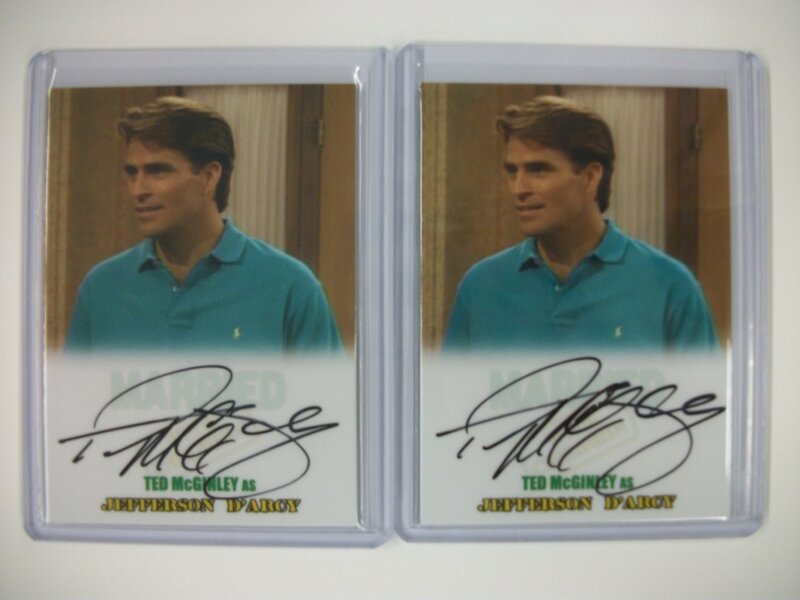 I'm not sure he realized which card he was inscripting at the time, but signed them exactly how I requested. 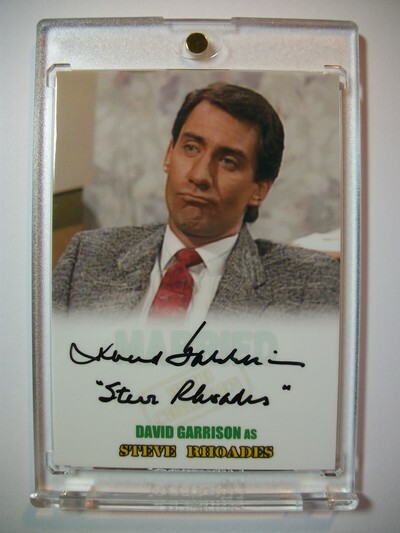 He was also supposed to keep one of each for himself. 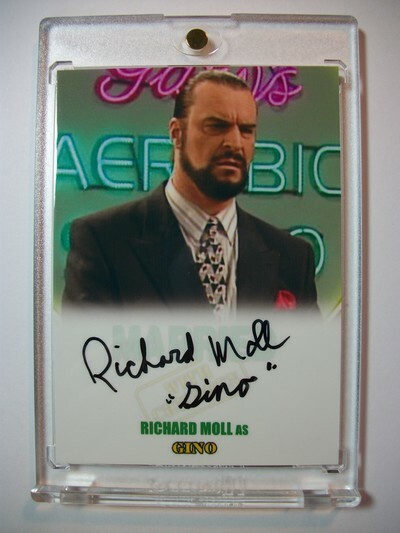 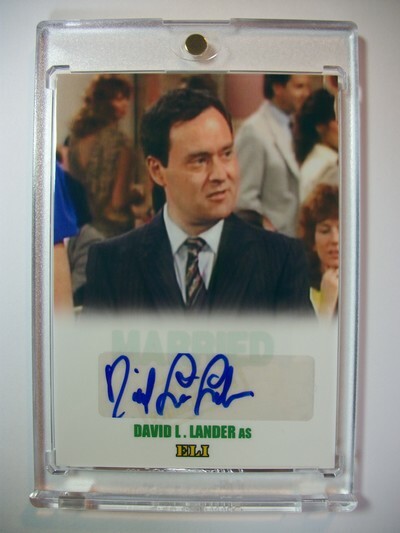 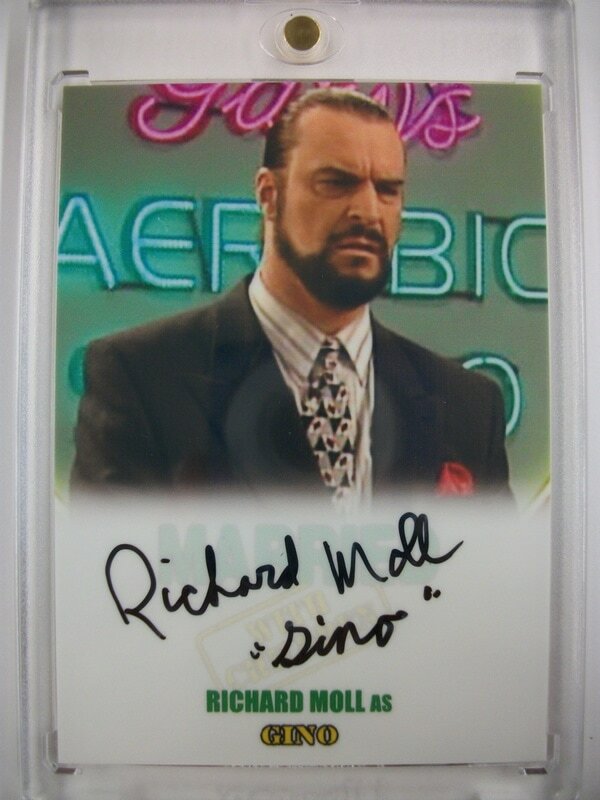 A big thanks to Mr. Richard Moll aka "Gino" for signing my card. With only a single appearance it's hard to forget the intimidating gangster. 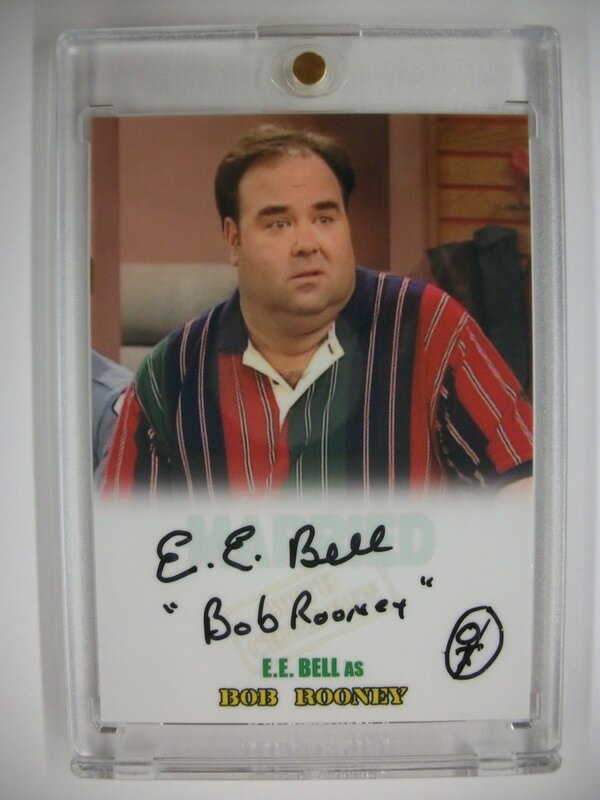 Hello "Bob Rooney" the butcher. An awesome return from E.E. 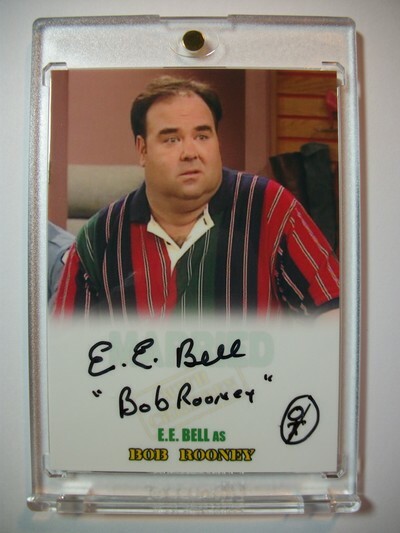 Bell. 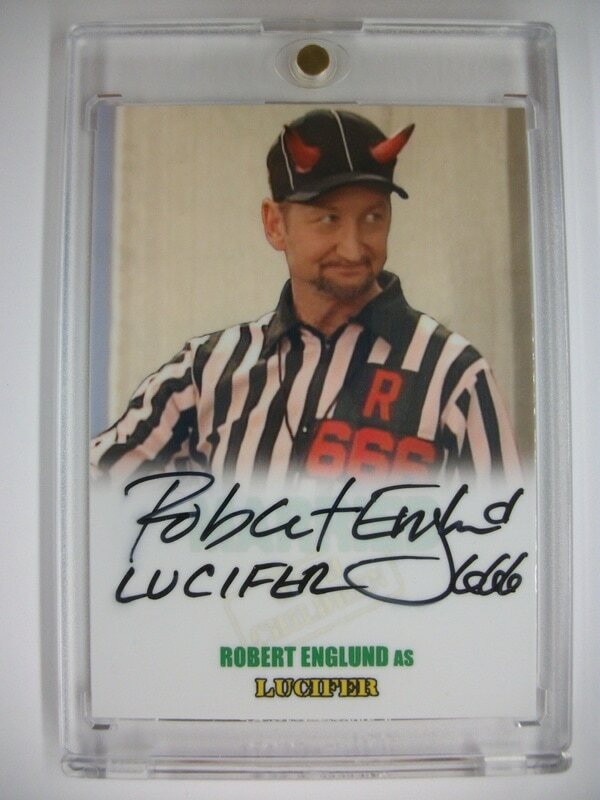 A big thanks to him for the return. 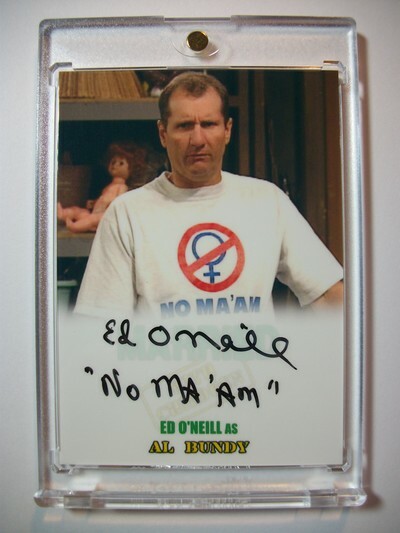 Notice the "NO'MAAM" logo he drew...fantastic stuff! 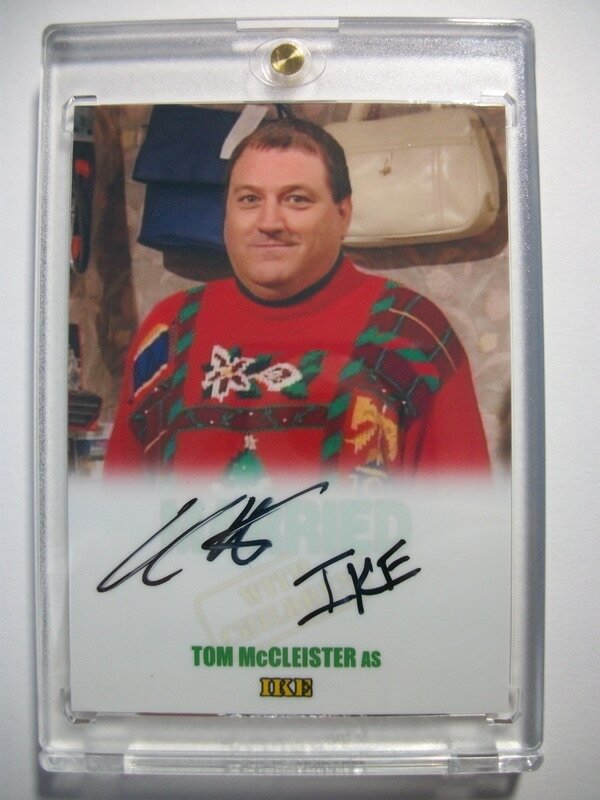 ​ Here's Mr. Tom McCleister as "Ike". 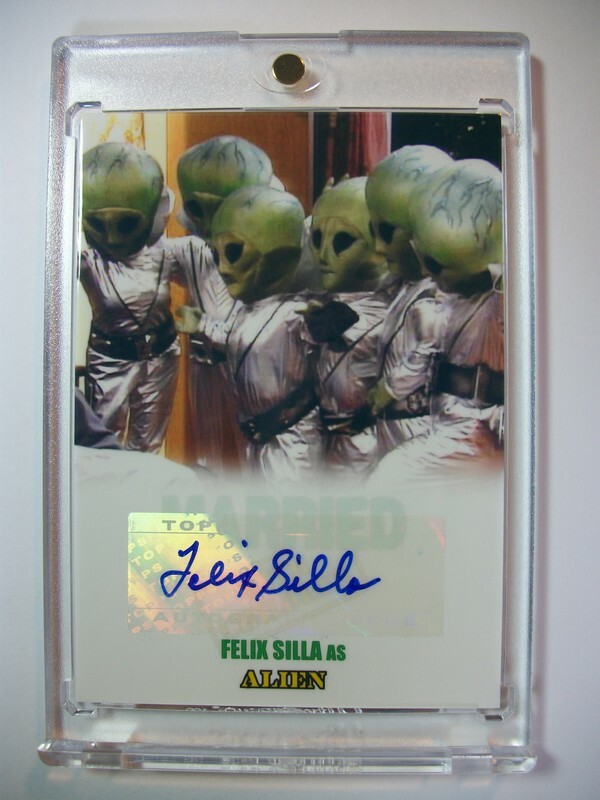 I was wondering to myself how would I know if he really signed them as there's not many exemplars of his signature and even less signed recently. 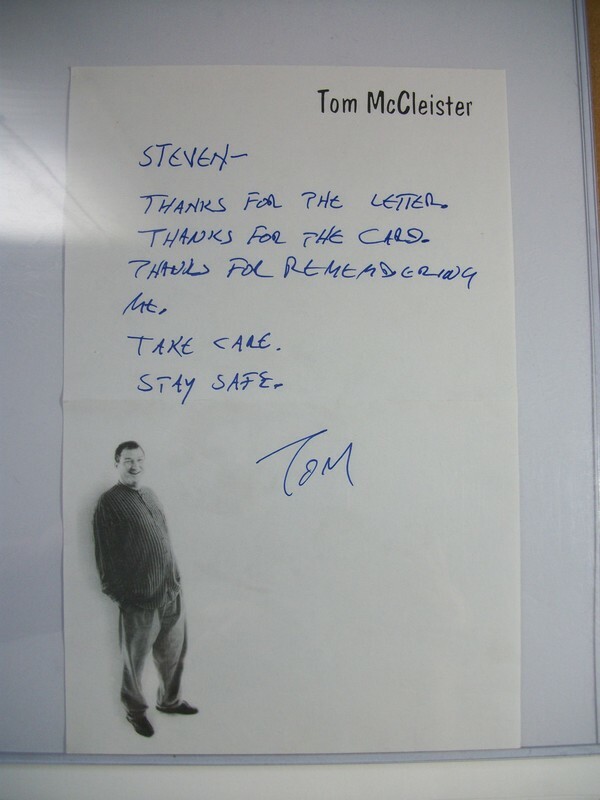 That question was satisfied with a really awesome little thank you letter he added. ​What MWC fan could forget IKE? 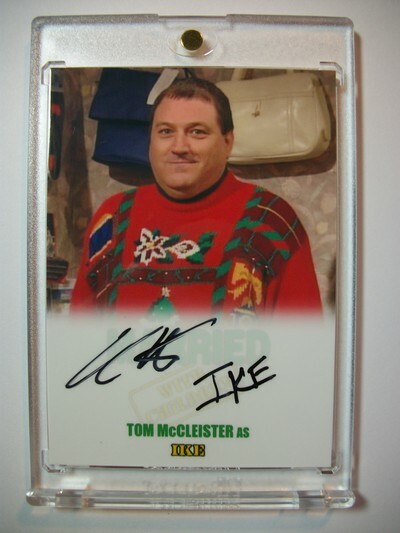 A BIG thanks to Mr. McCleister for taking the time to respond to a fan. 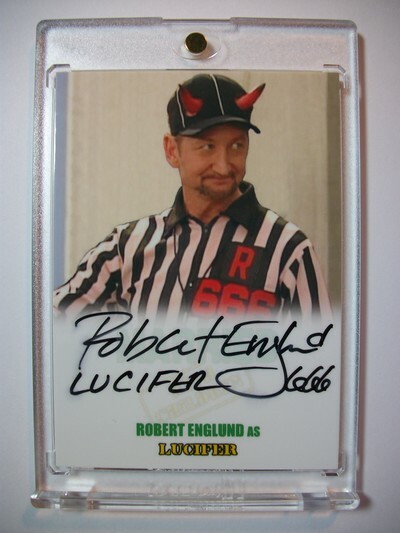 While he had only a single guest appearance as "Lucifer" Robert Englund has joined my collection. 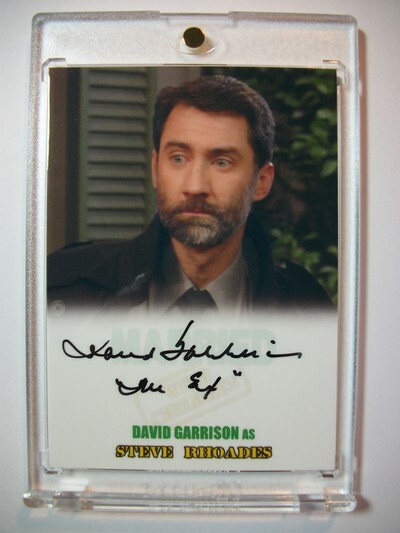 ​I decided to take a shot at sending some of my custom made cards to David Garrison to sign. 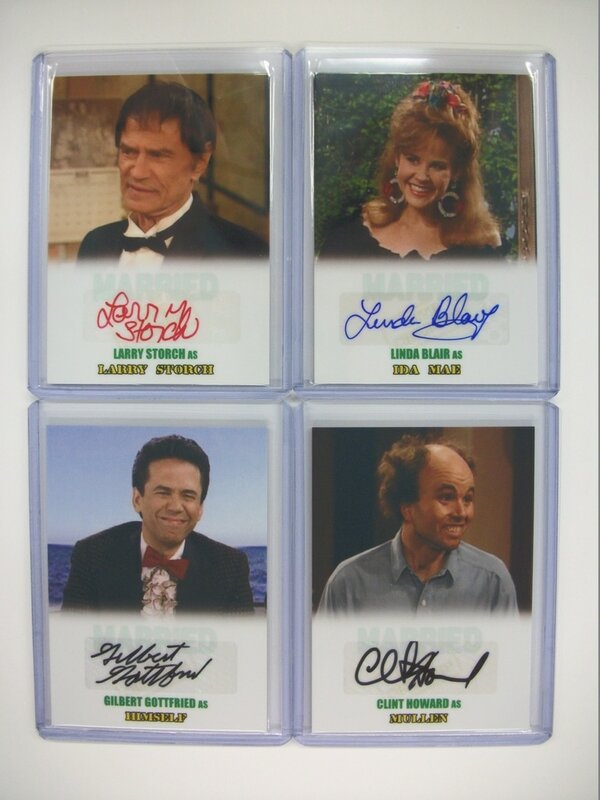 It would be AWESOME to complete this set... well... at least to me anyways. 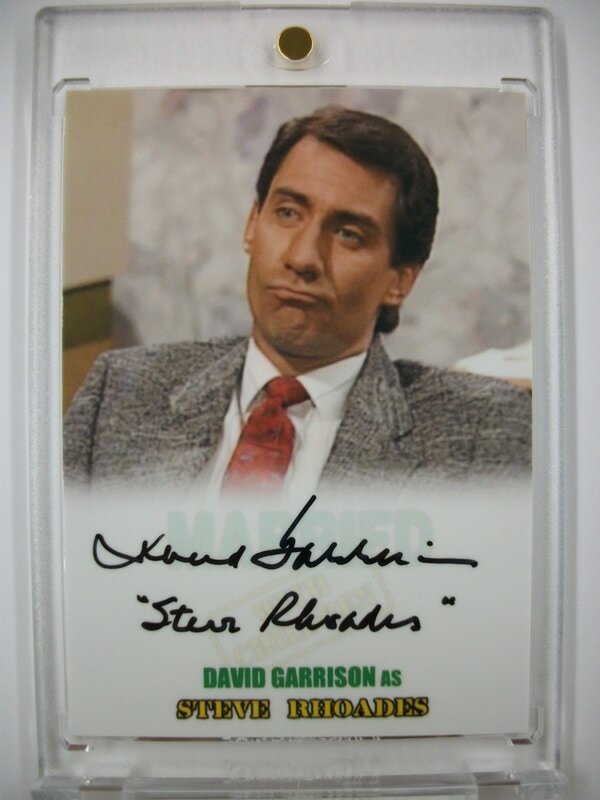 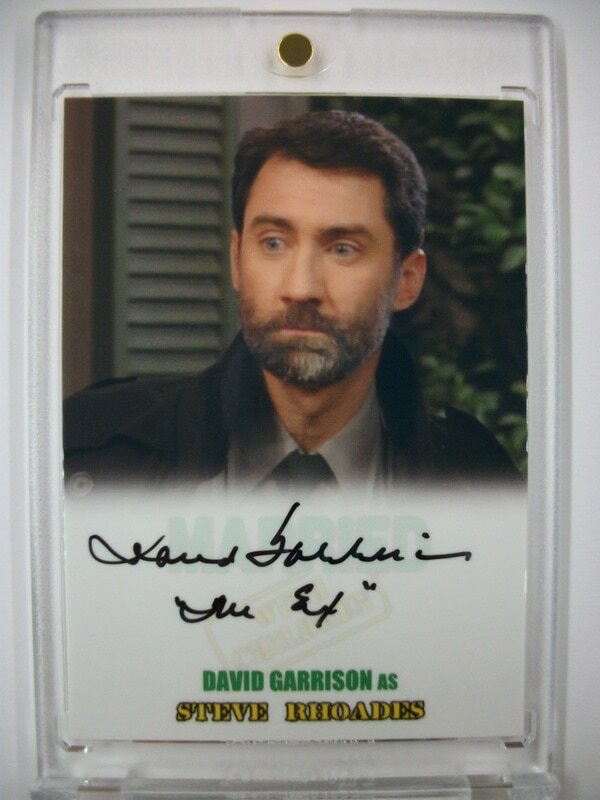 So I sent off a few MWC custom cards to David Garrison just before Christmas. 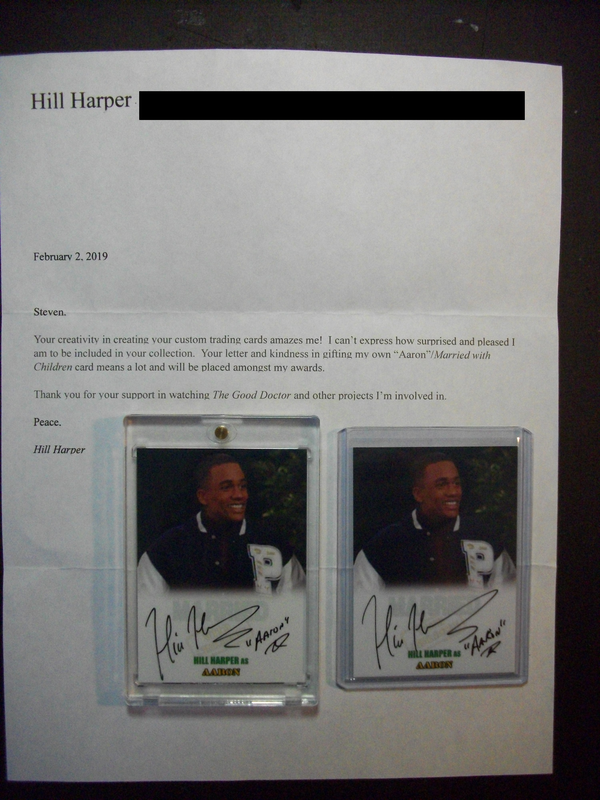 I included a nice pen and a single page hand written fan letter along with with an autograph request. 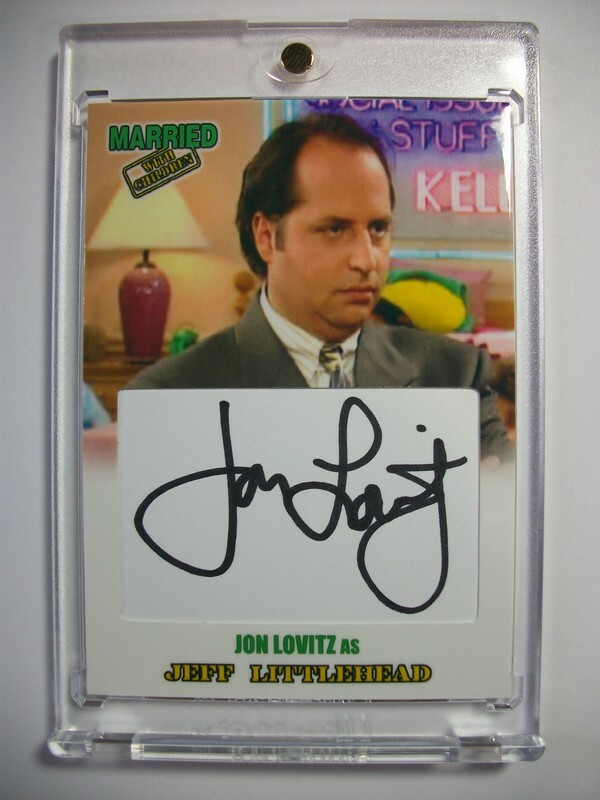 I packed it up complete with a pre-paid self addressed bubble mailer and hoped it would reach him. 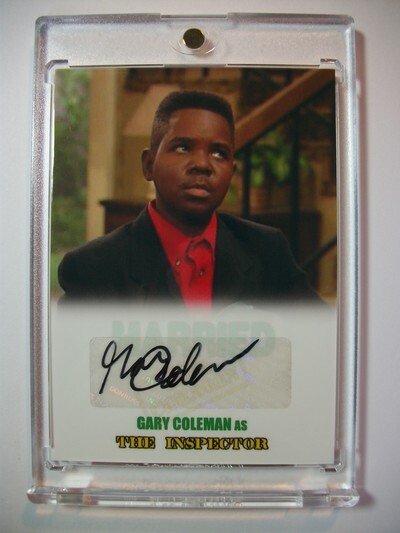 I used his talent agency mailing address from his personal website. 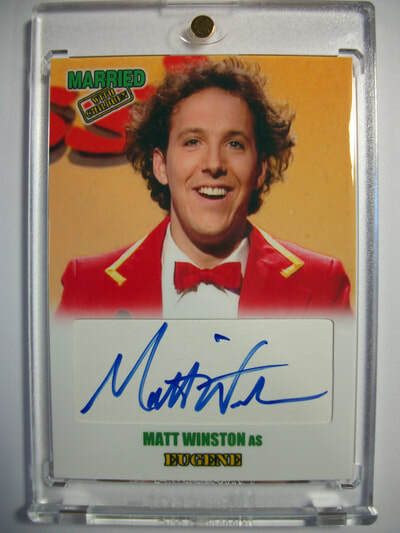 Just under 2 months later my return envelope was sitting in my mailbox! 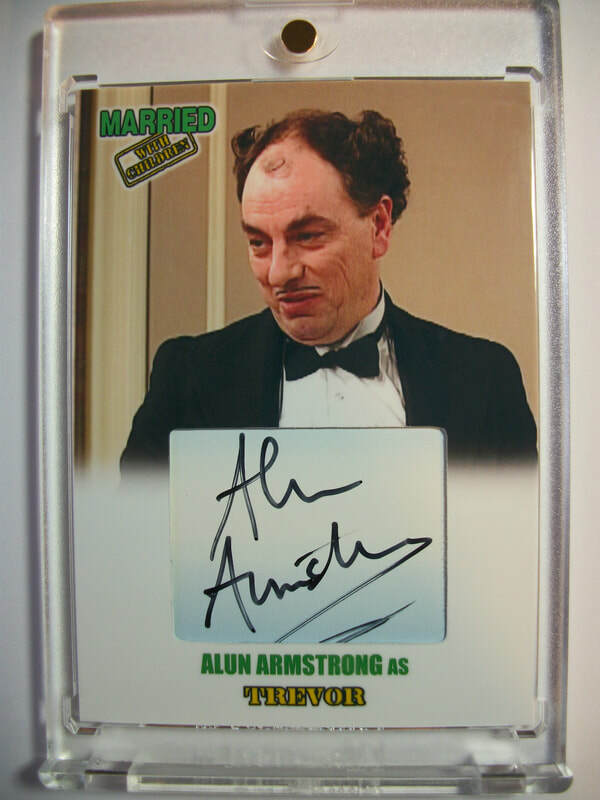 He actually signed my cards for me just as I had instructed! 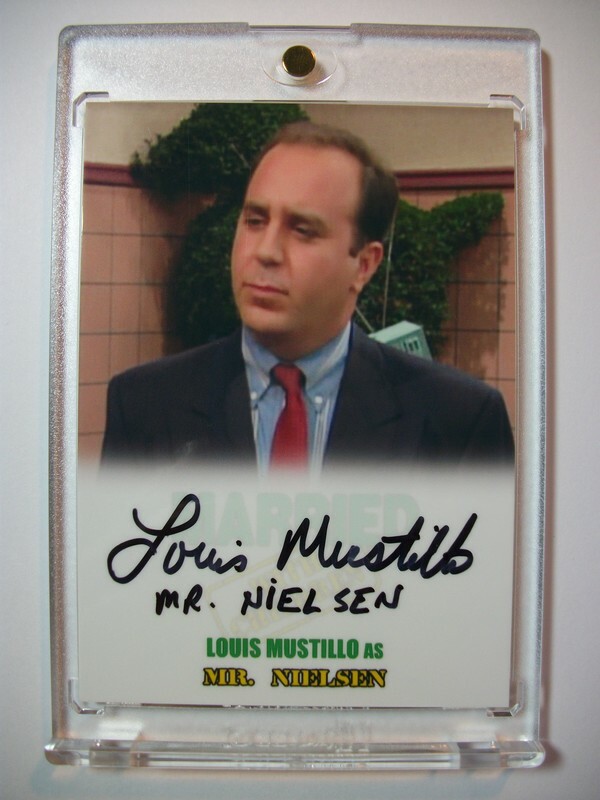 I gave a brief yet detailed message stating what and where I wanted him to write on the cards. I figured if he signed any other way than what I wanted it would have been on me if I didn't at least ask. He signed them beautifully! 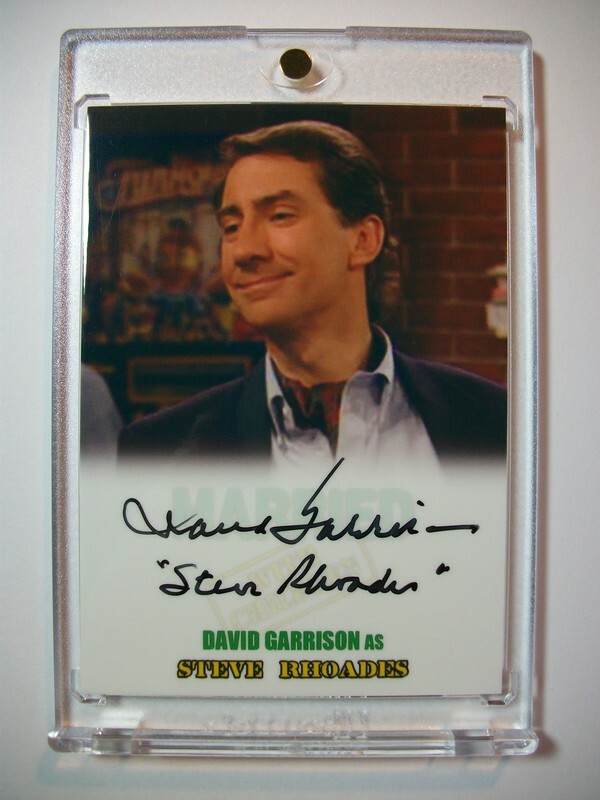 One version with his name and "Steve Rhoades", the other with his name and "The Ex". 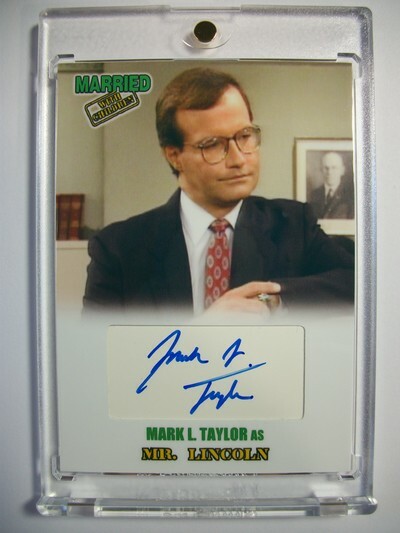 I could not have asked for a better first time TTM experience thanks to Mr. Garrison! 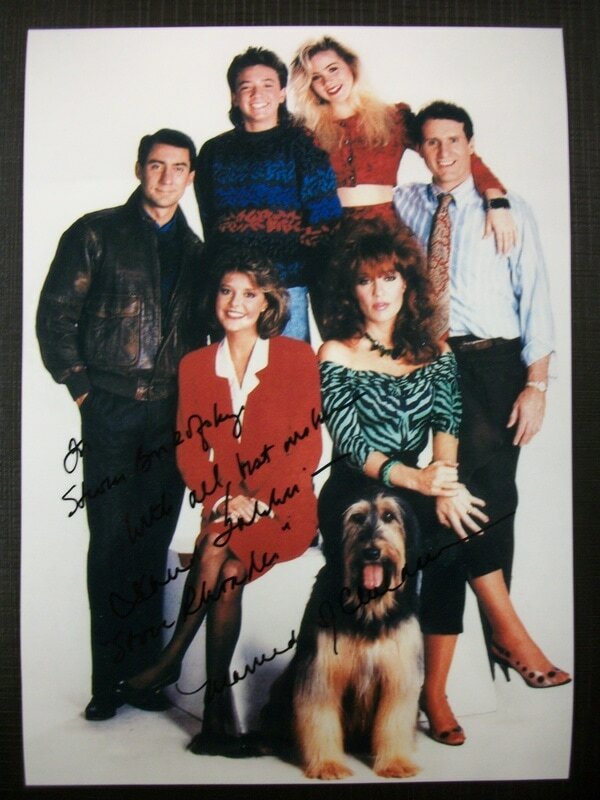 Mr. Garrison was also kind enough to include this personalized 5x7 MWC cast photo. 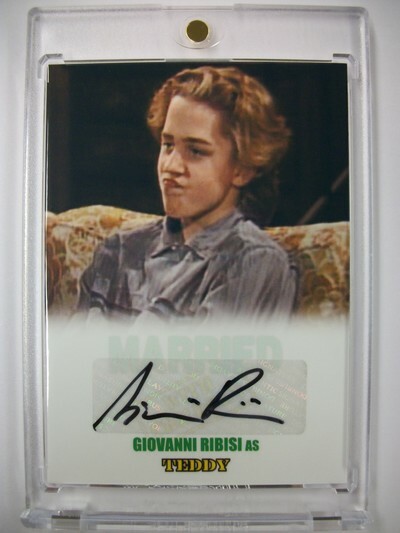 Truly a class act! 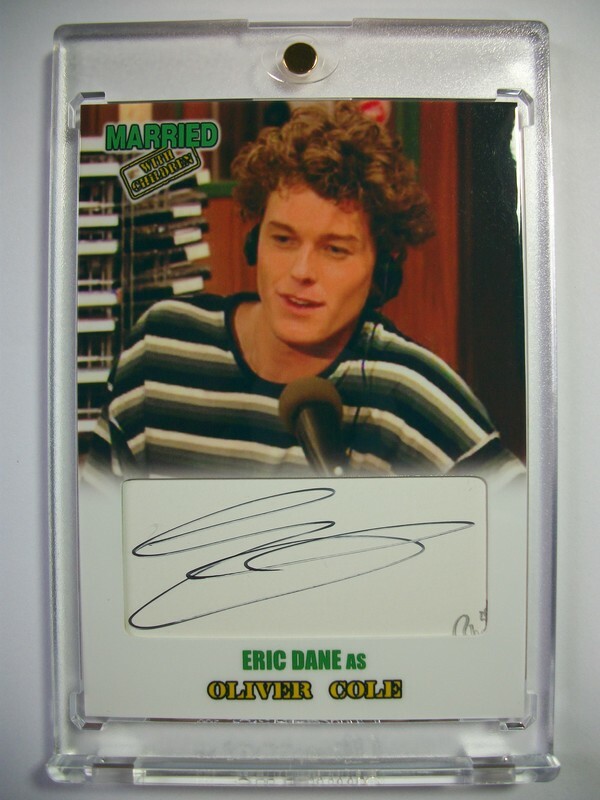 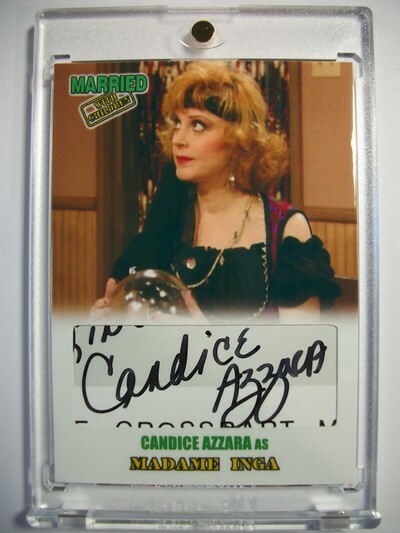 A ways back I received word from a couple of friendly collectors about a MWC cast signing that was being done through Official Pix. 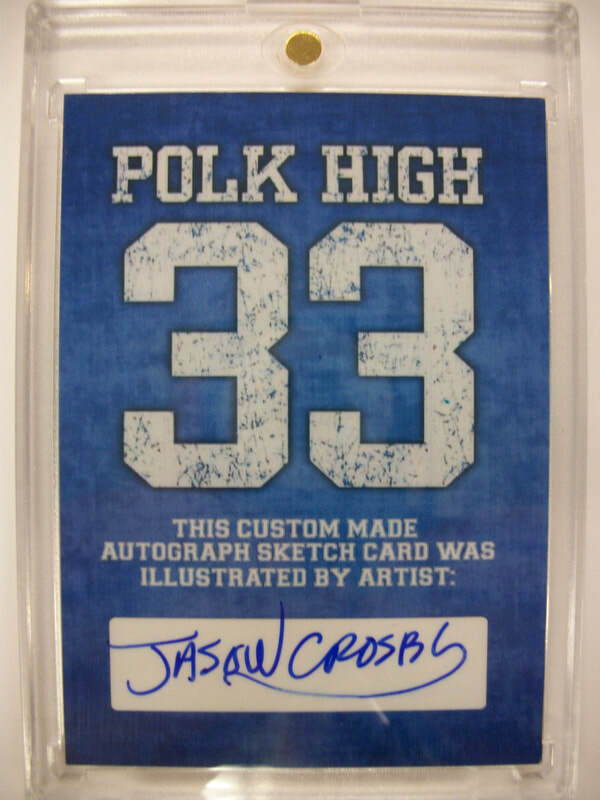 I normally make custom cards for other collectors to get signed. 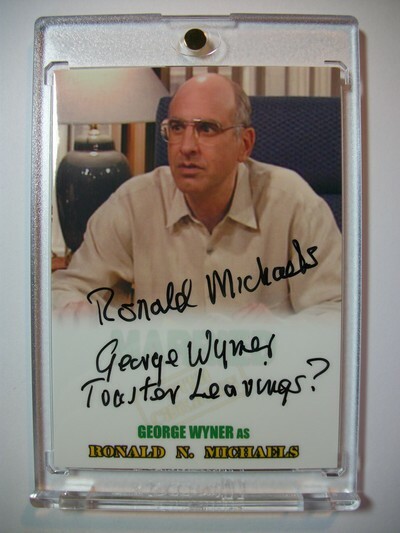 I've even sent them directly to this company for others before this. 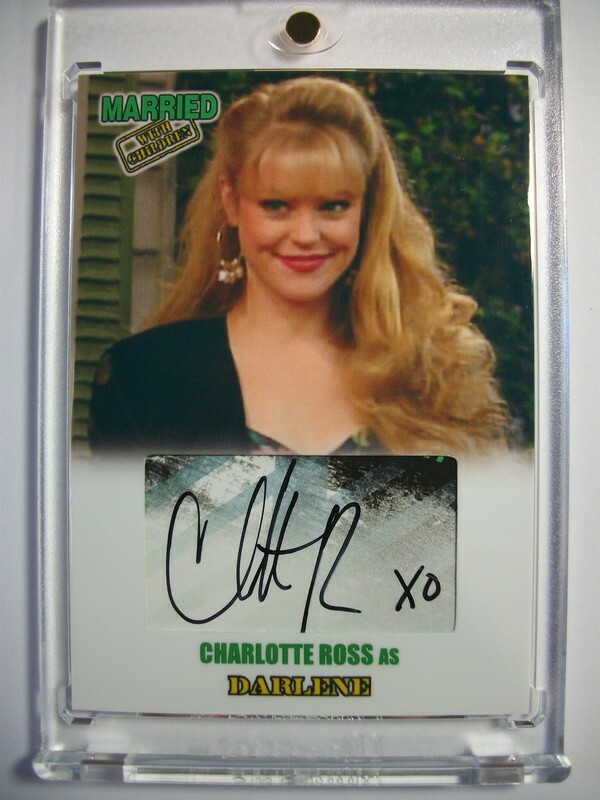 I didn't think it would ever be possible to have the cast sign something I made before this opportunity was offered. I'm really not a signed photograph guy which is really all that's available cast wise. 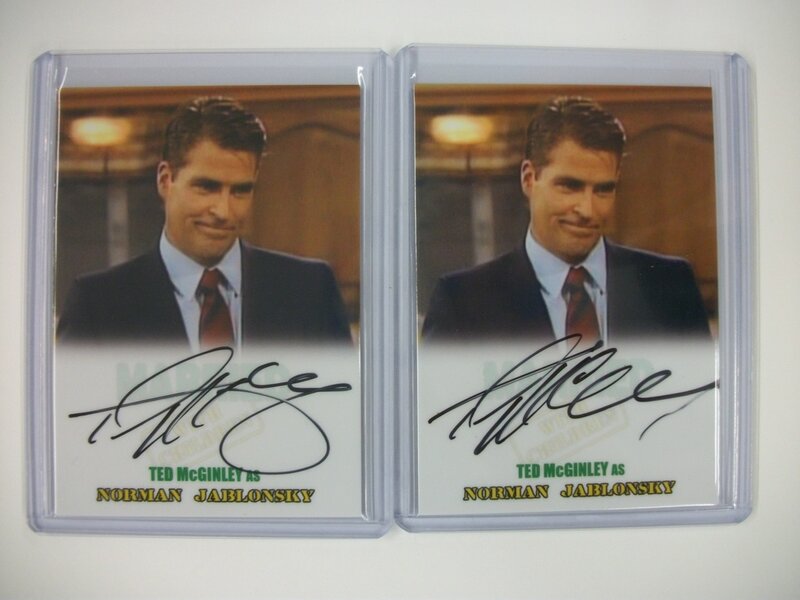 The idea of having my own signed set from one of my most favorite shows ever was too much to ignore. 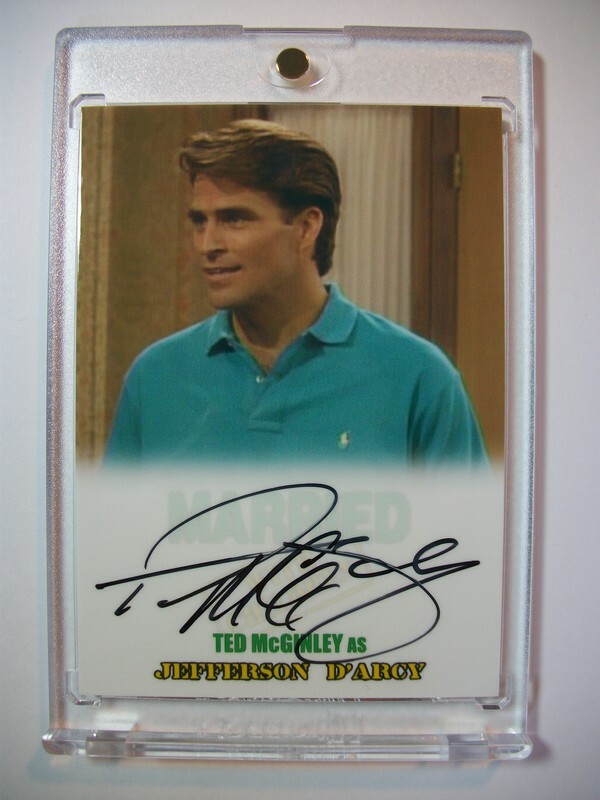 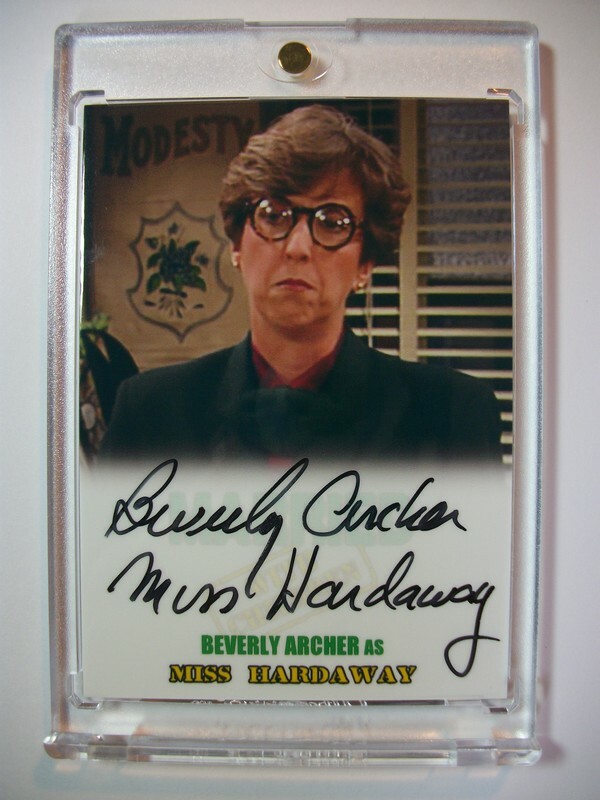 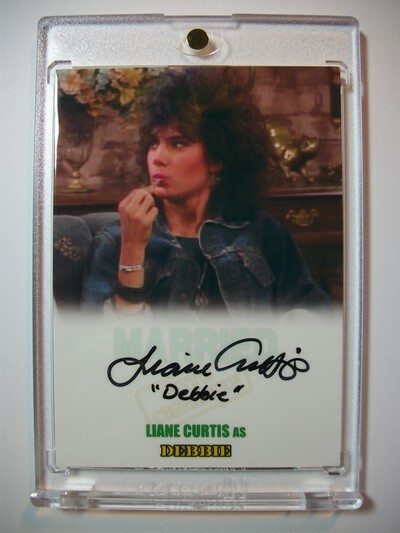 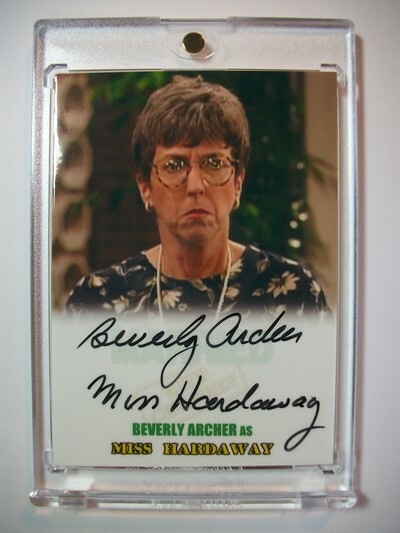 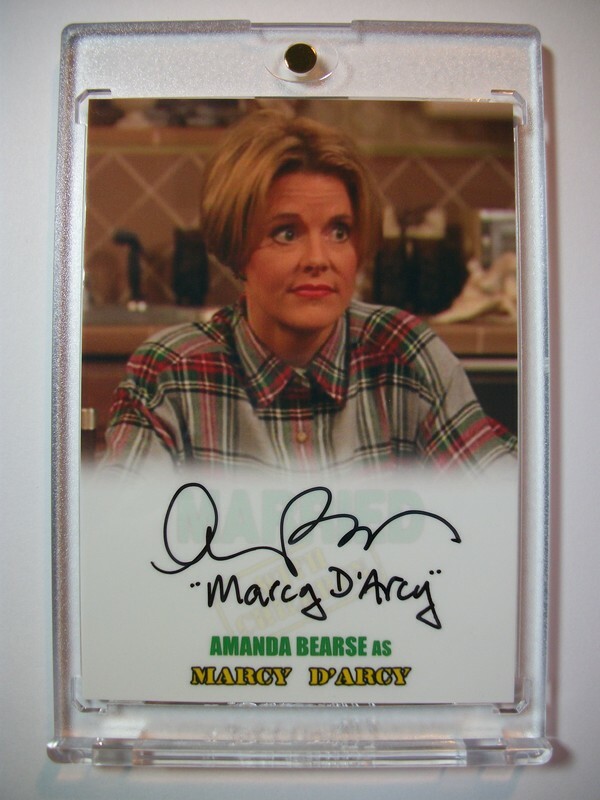 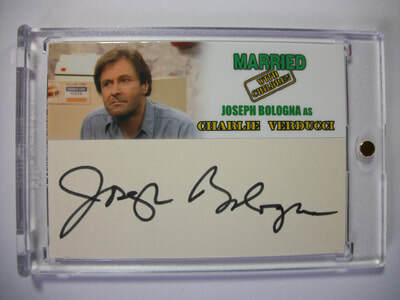 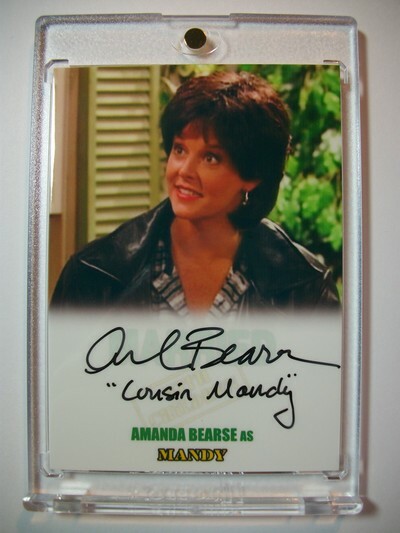 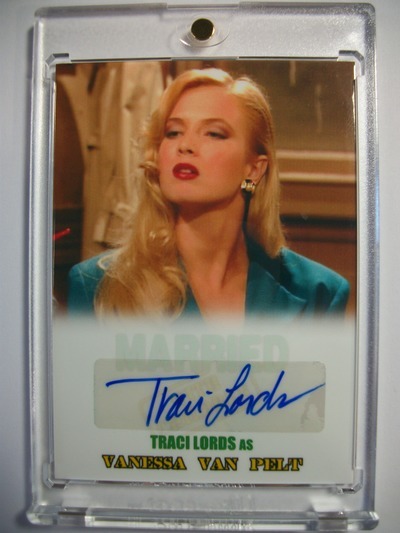 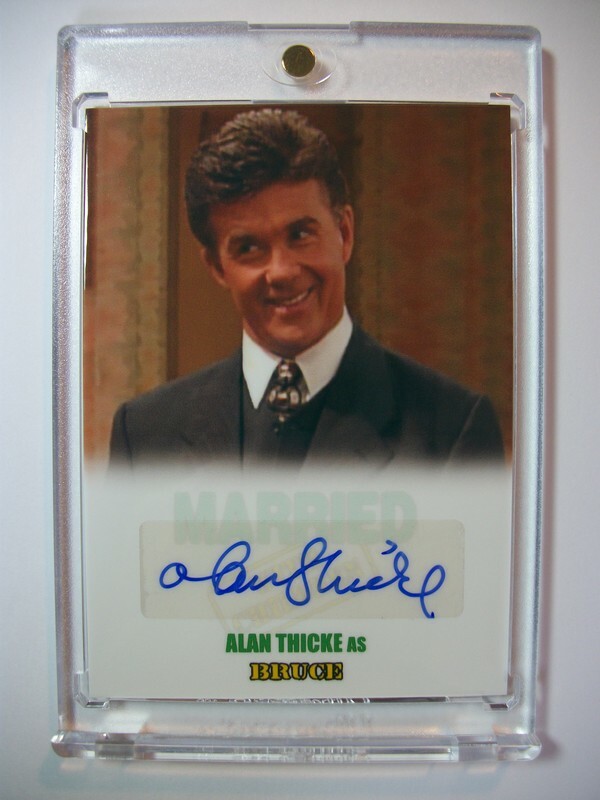 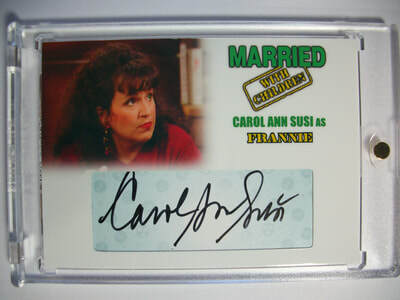 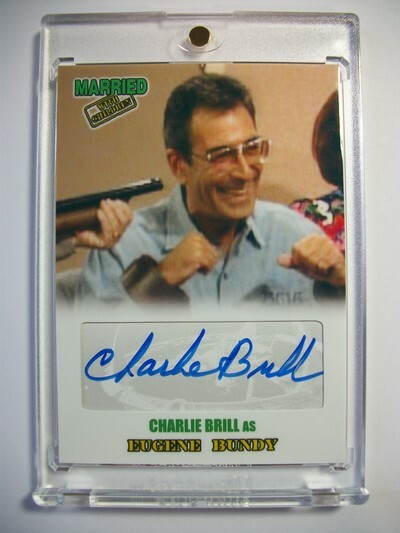 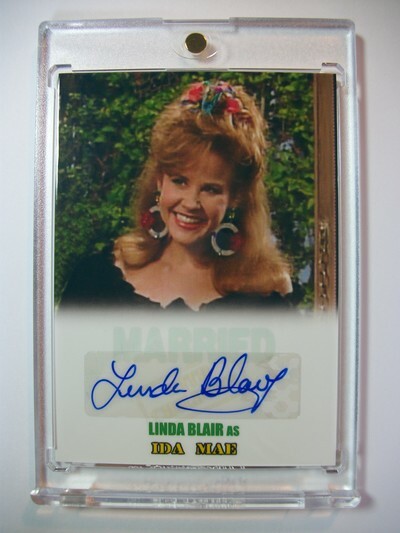 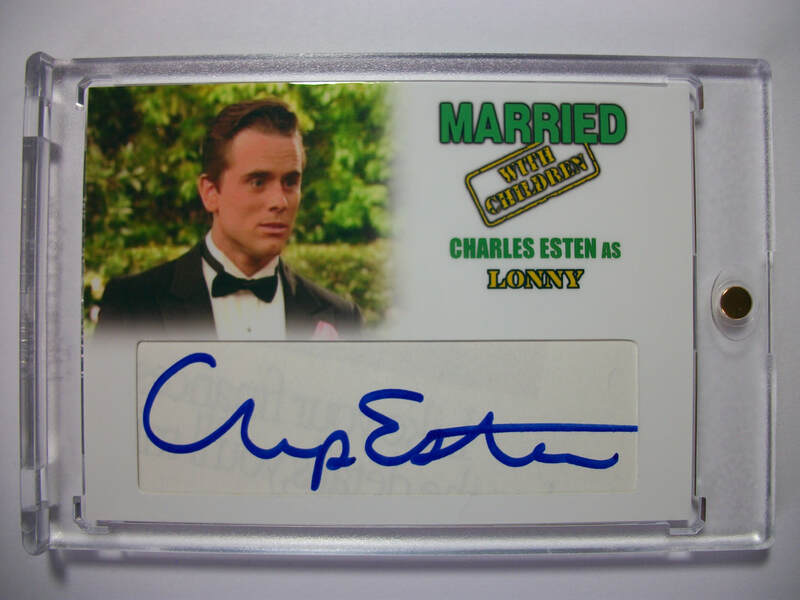 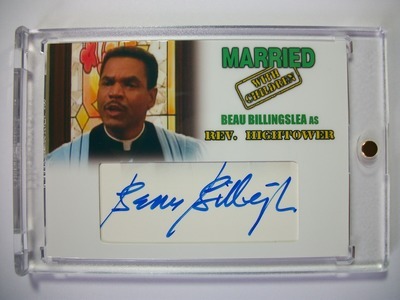 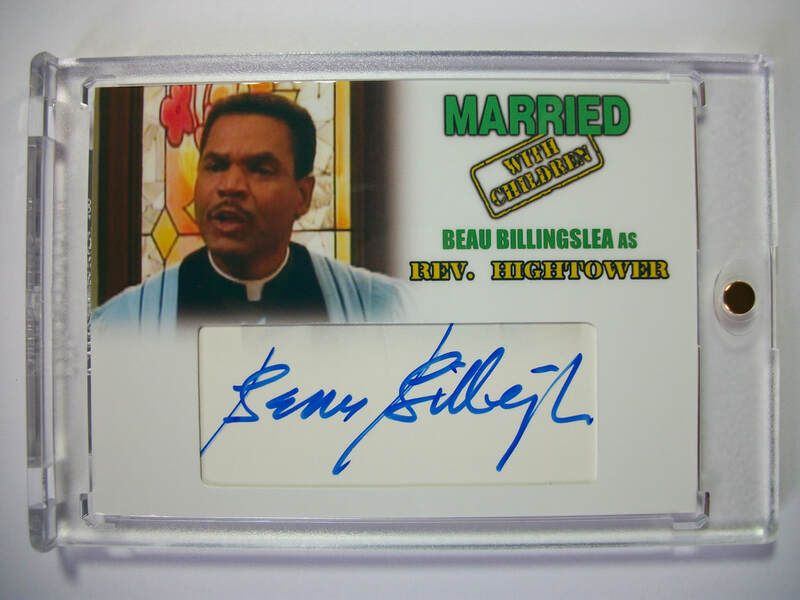 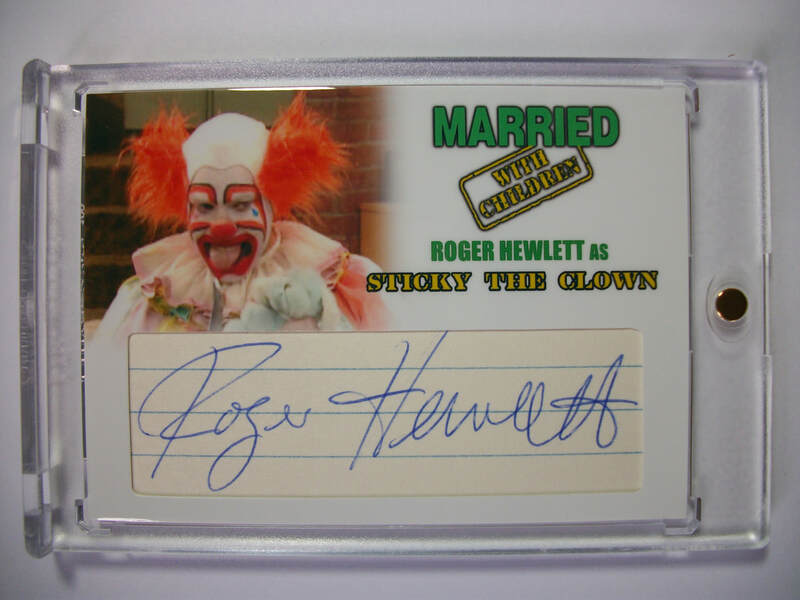 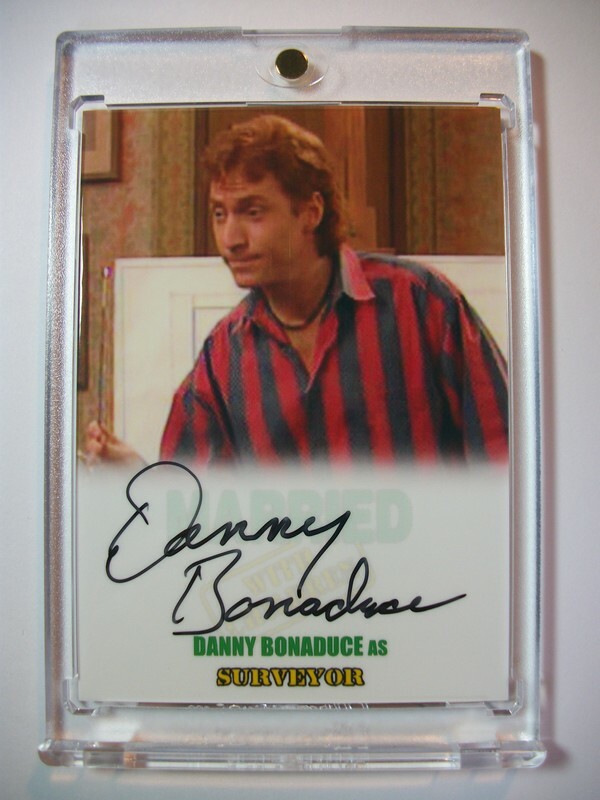 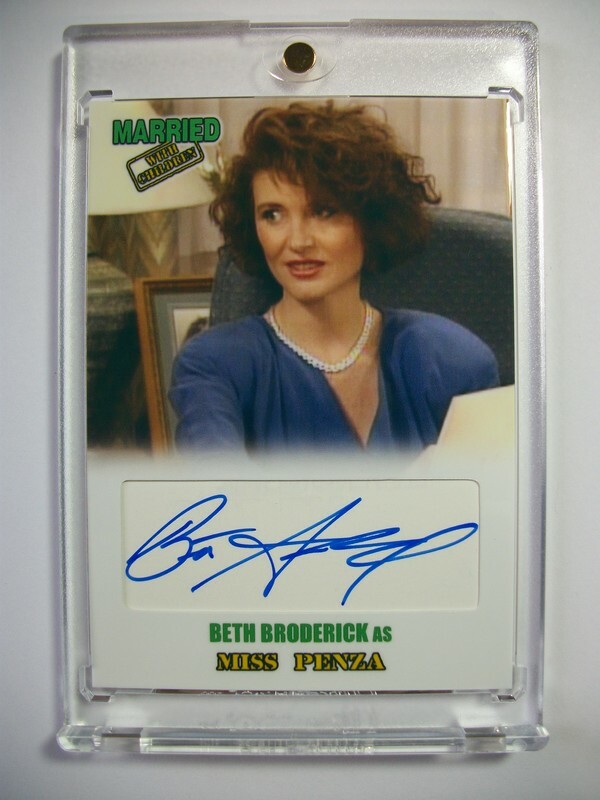 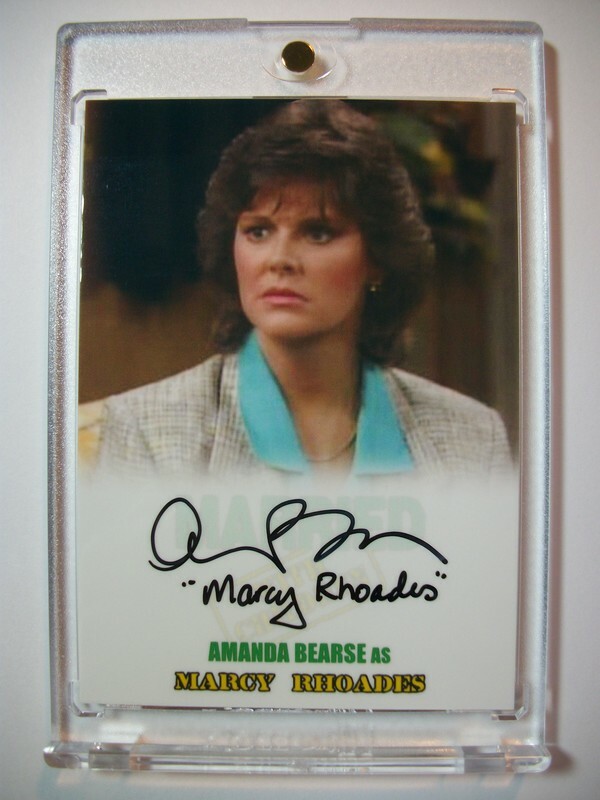 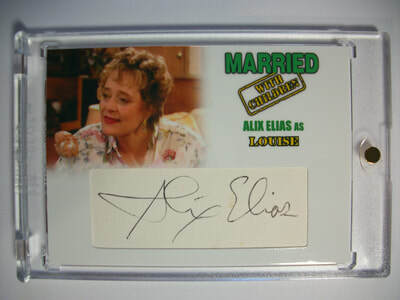 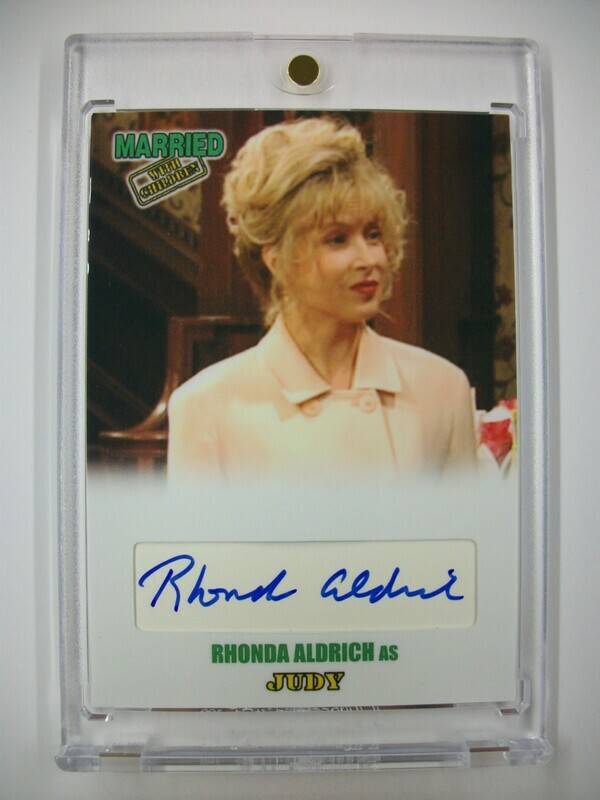 The "Married with Children" cast signing started with Ted McGinley back in April and most recently ended with Amanda Bearse in late December. 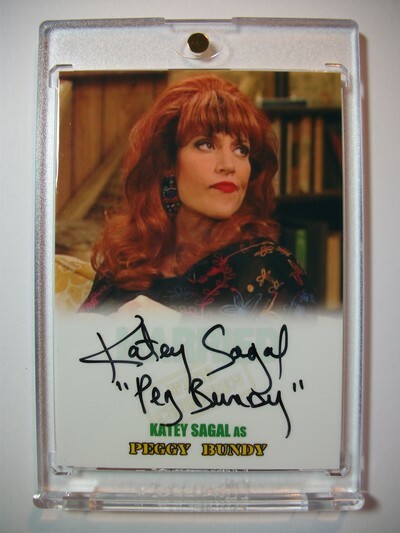 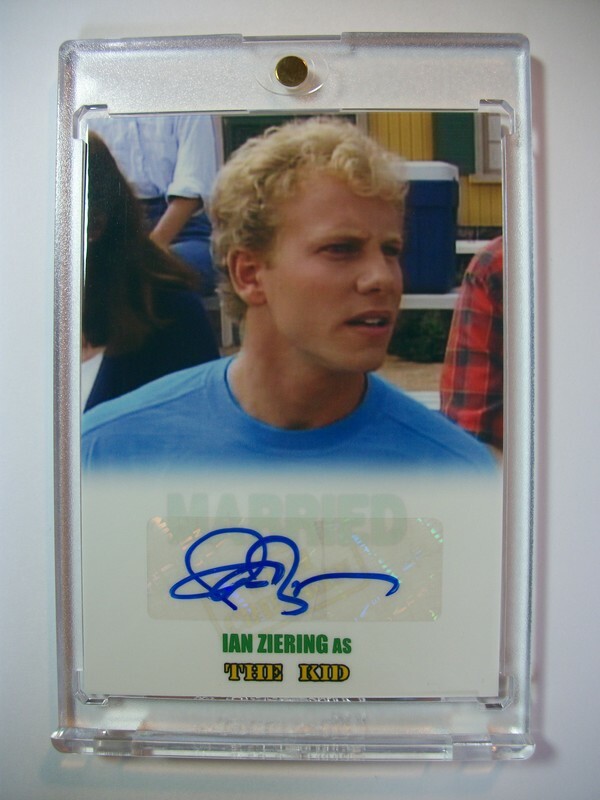 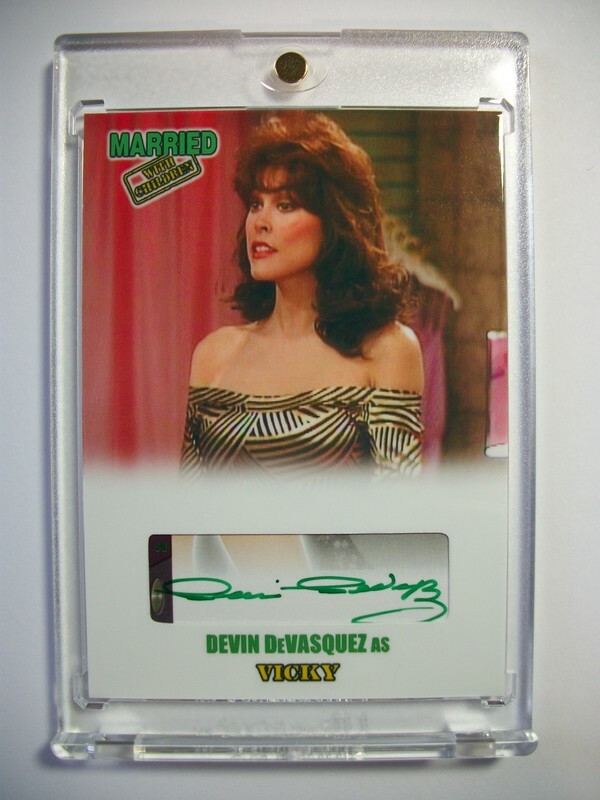 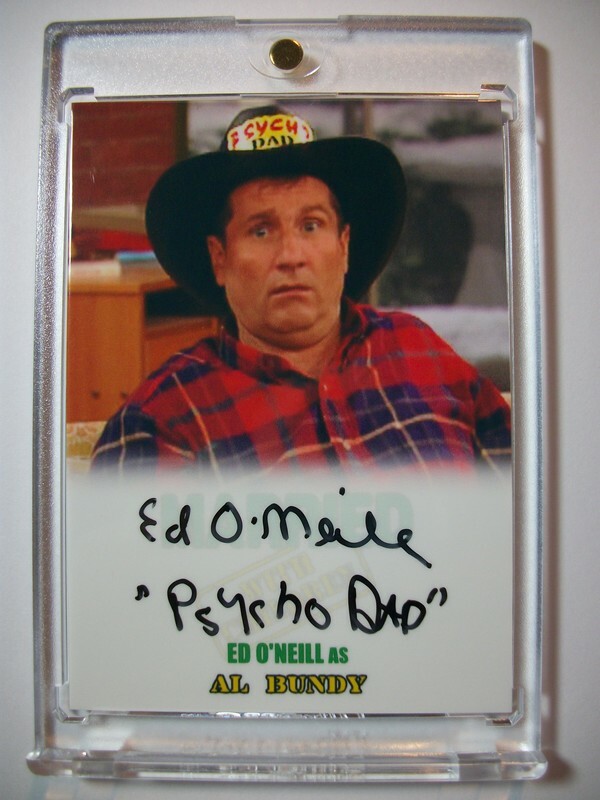 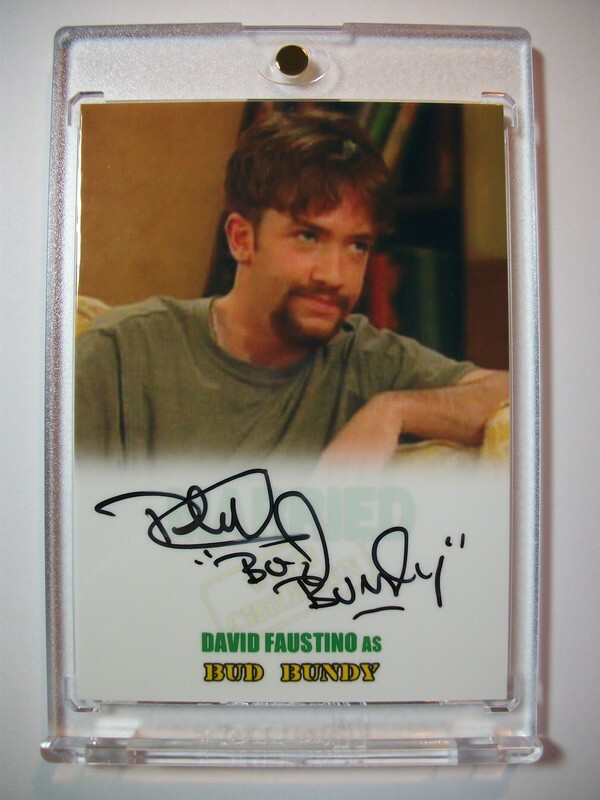 In between Ed O'Neill, Christina Applegate, David Faustino, and Katey Sagal signings also took place. 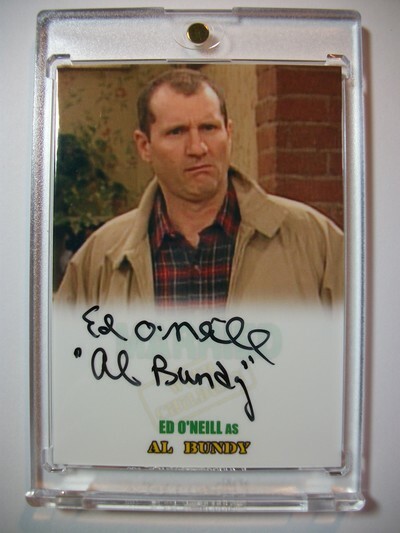 I decided to go with an older version of the Bundy Family as that's how I remember them best. 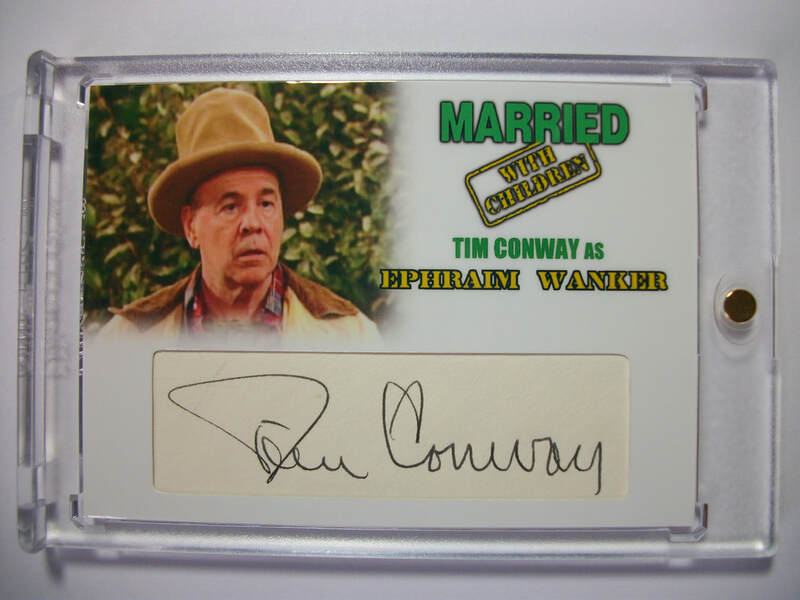 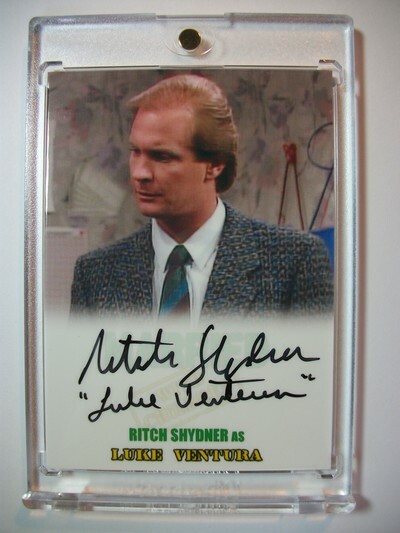 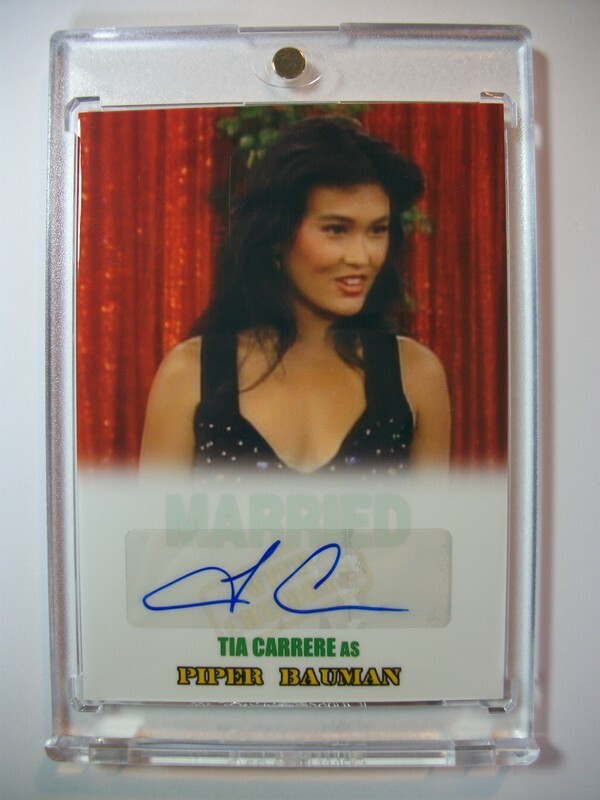 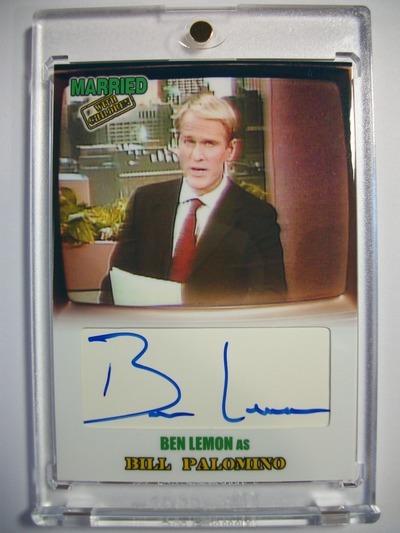 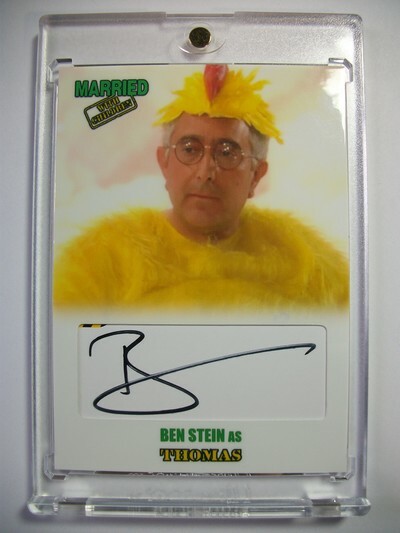 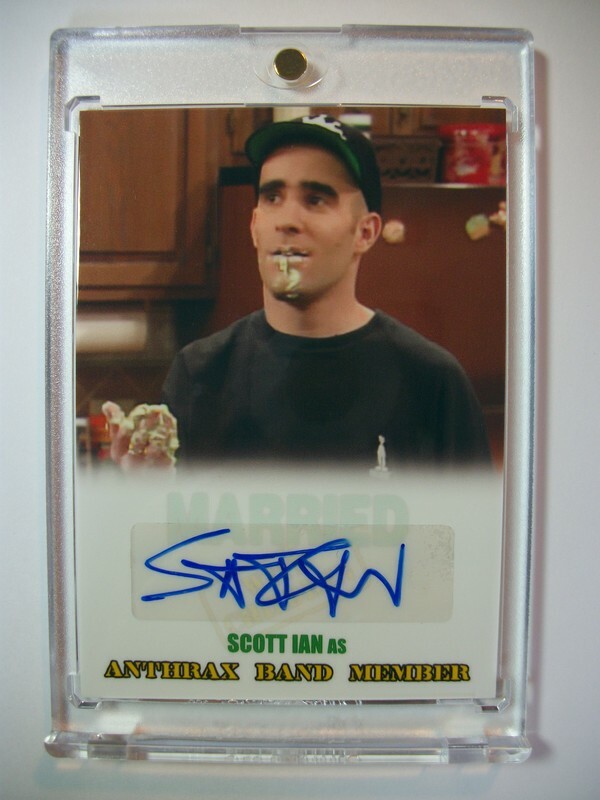 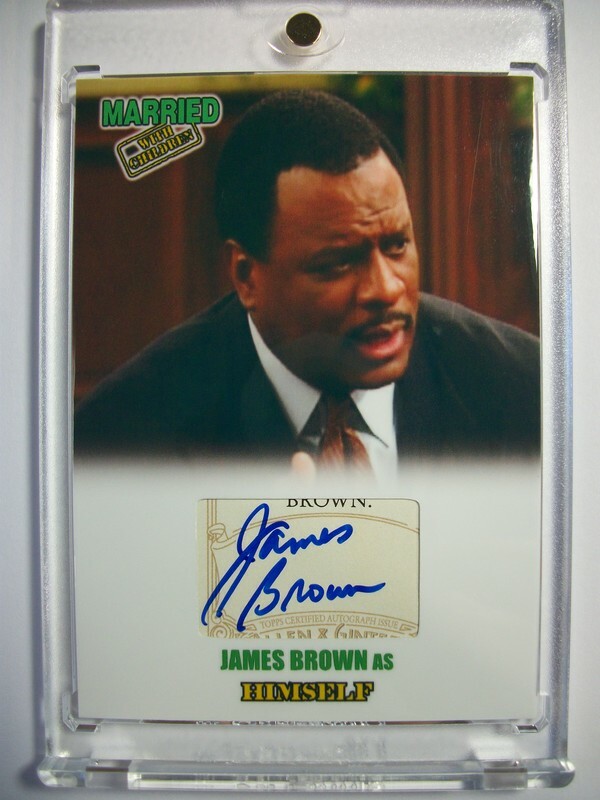 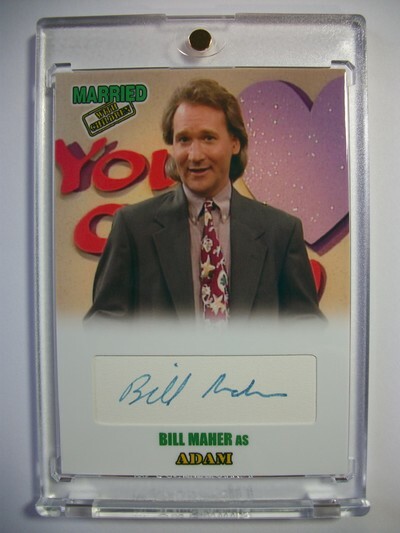 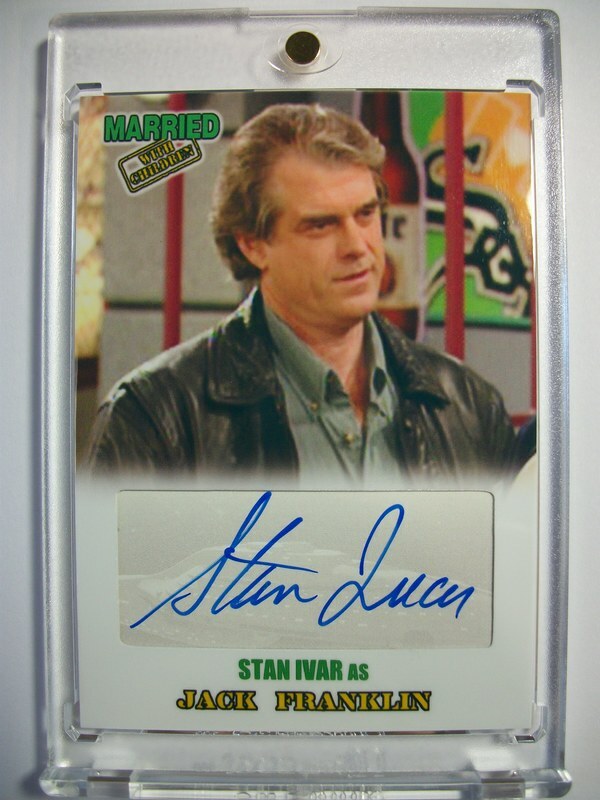 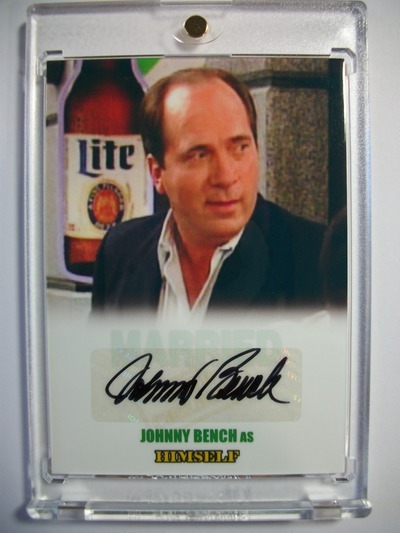 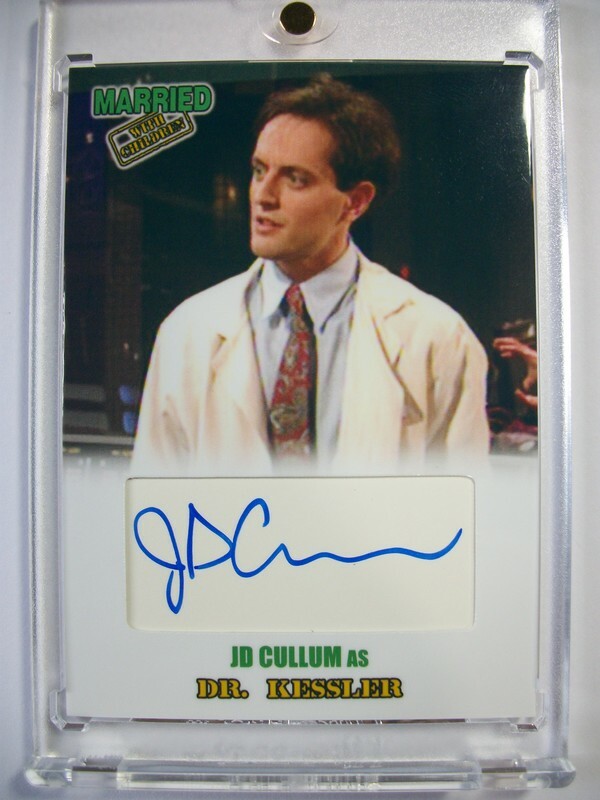 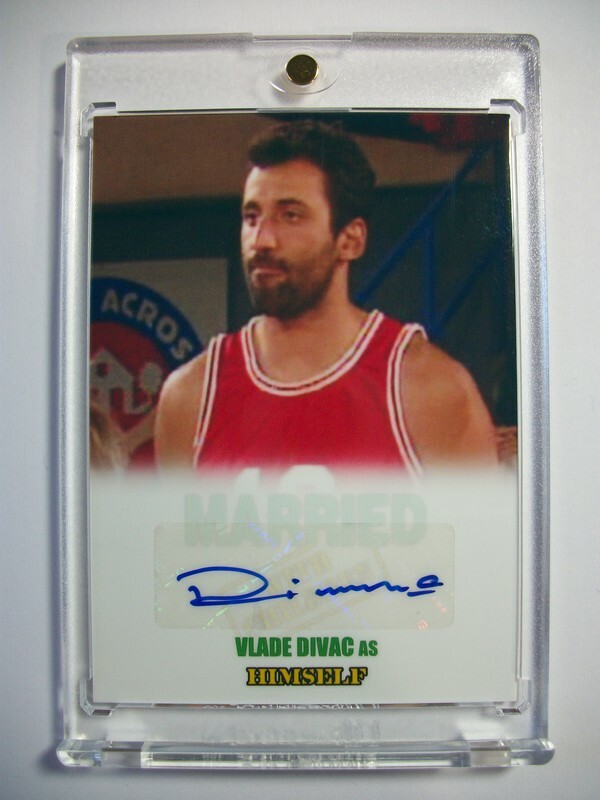 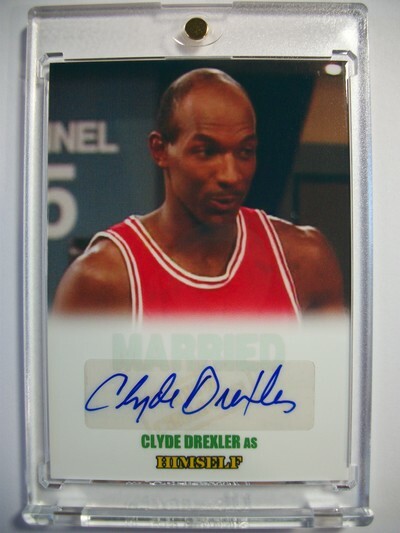 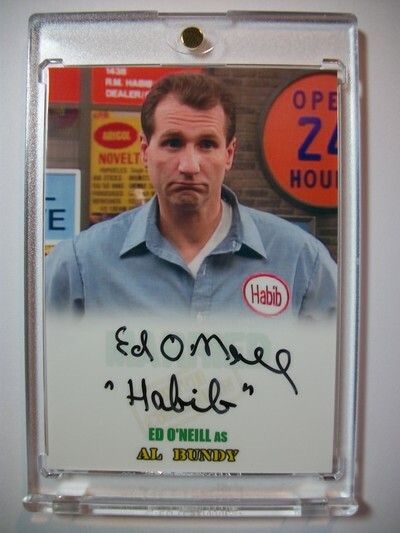 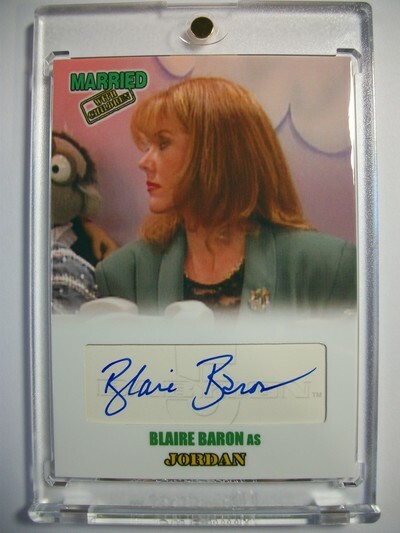 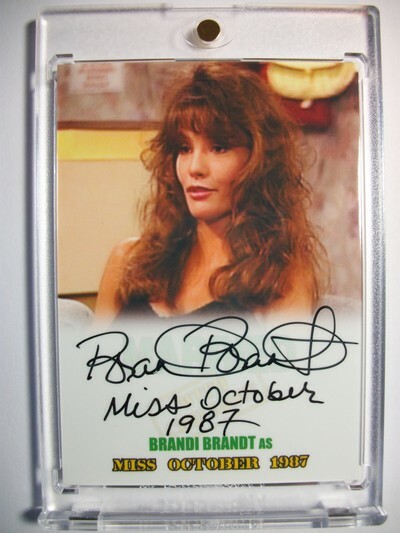 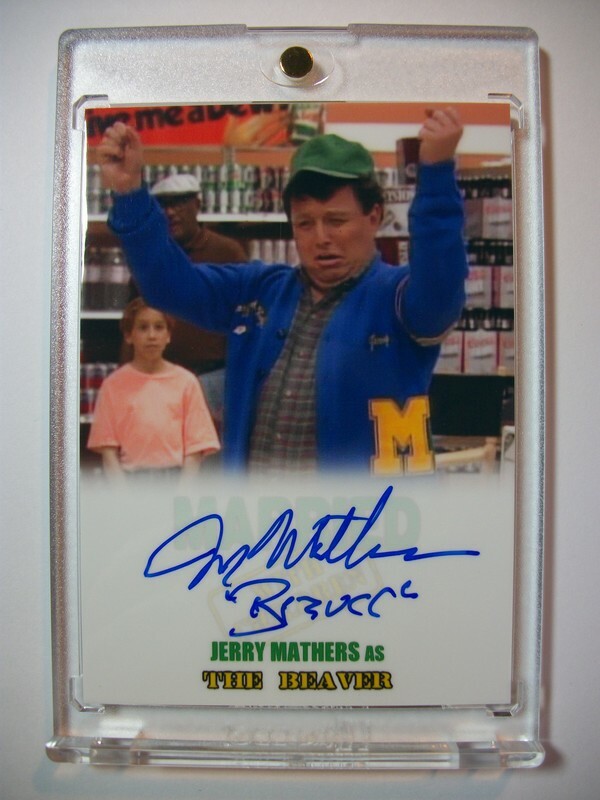 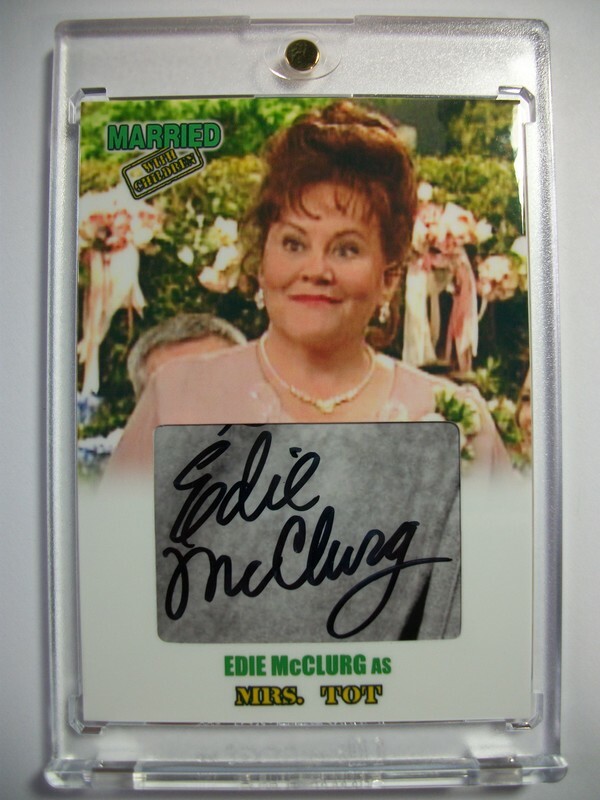 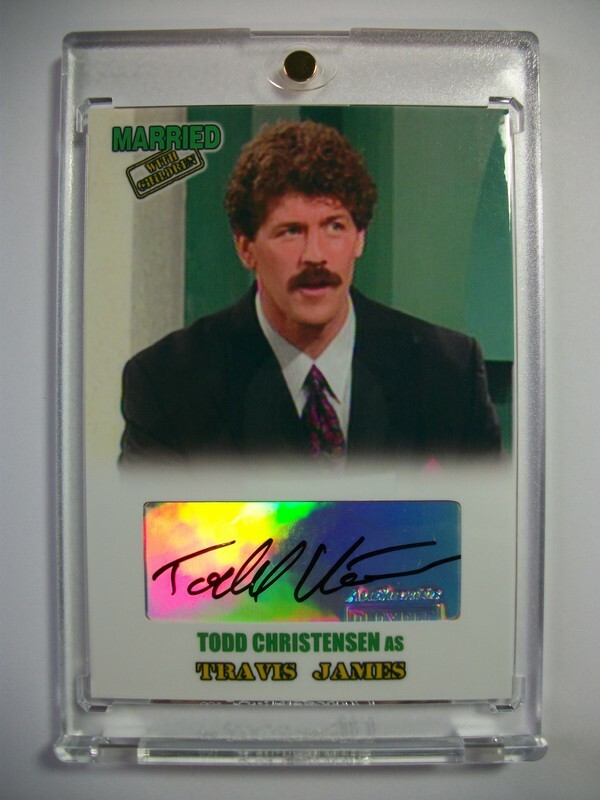 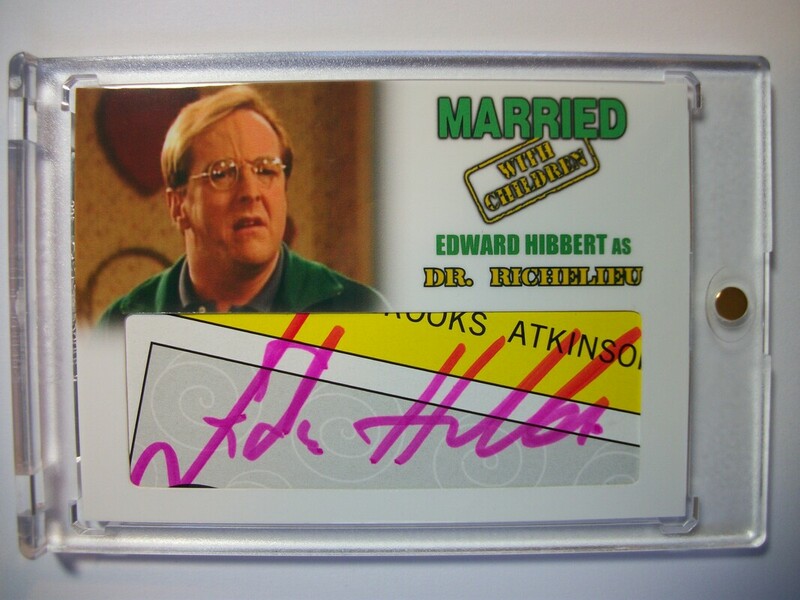 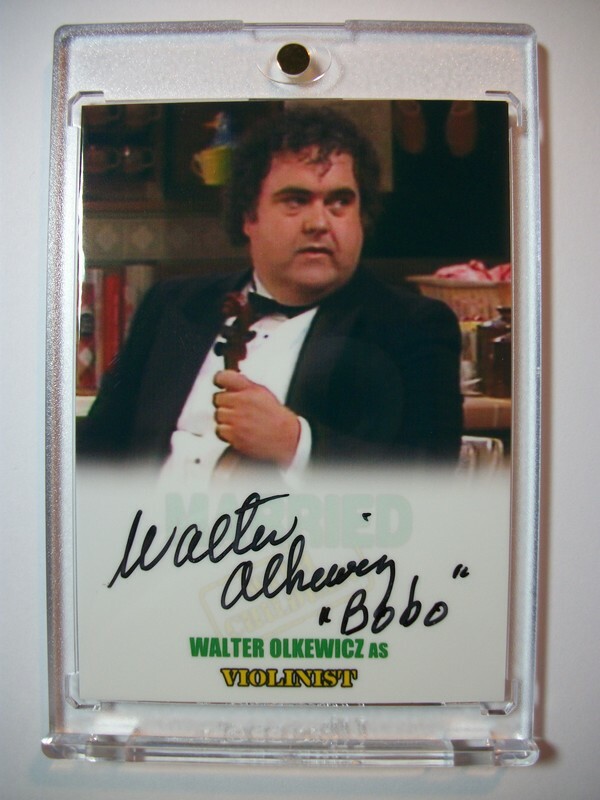 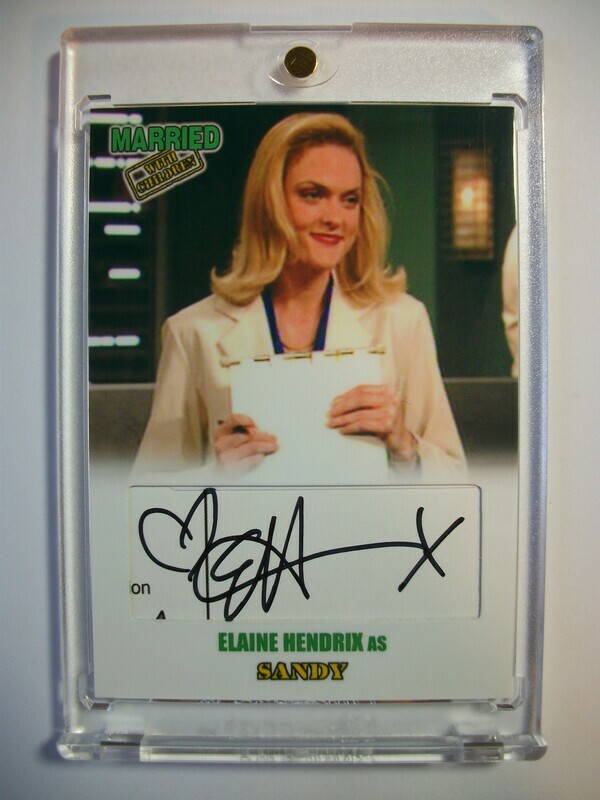 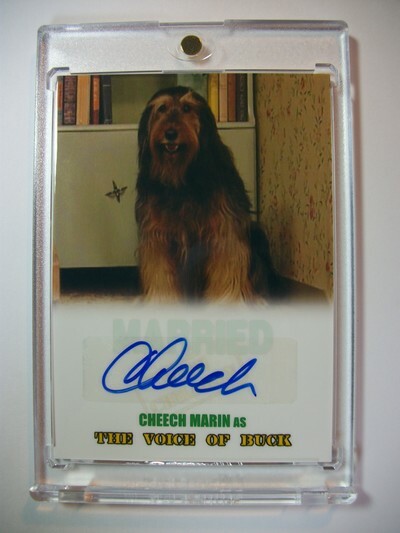 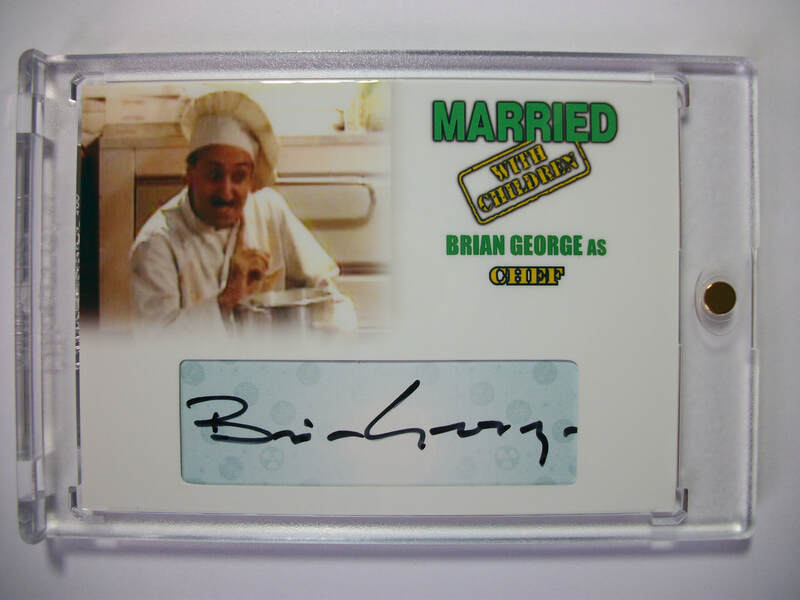 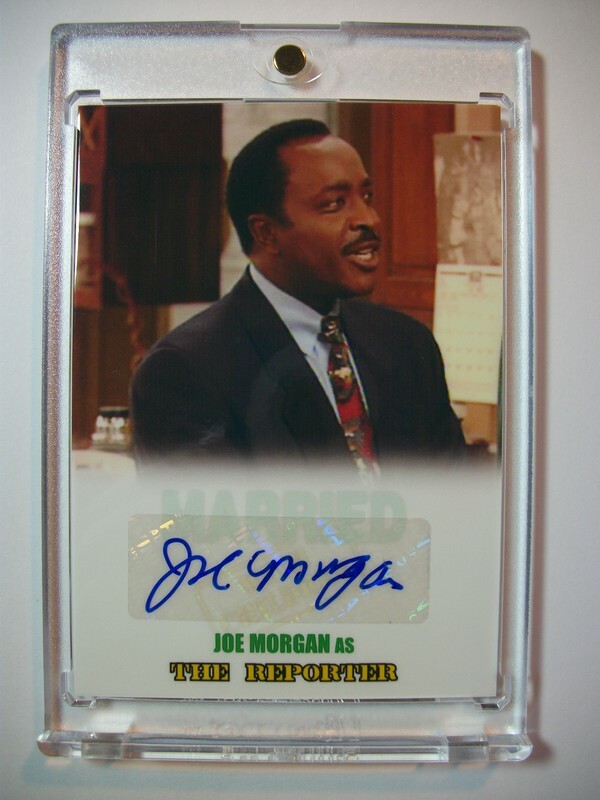 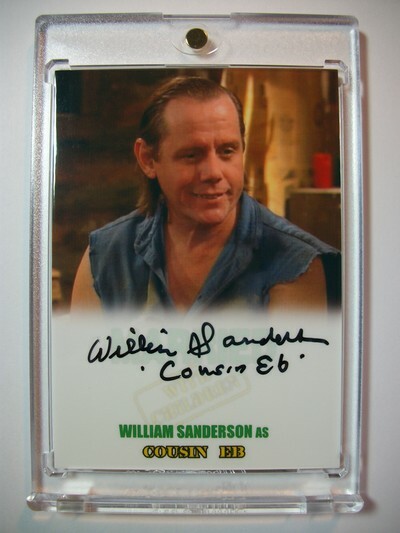 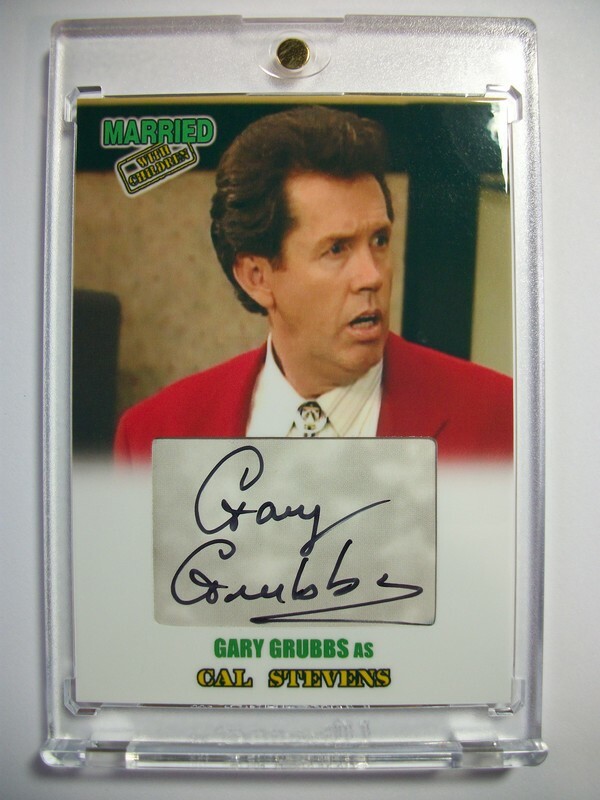 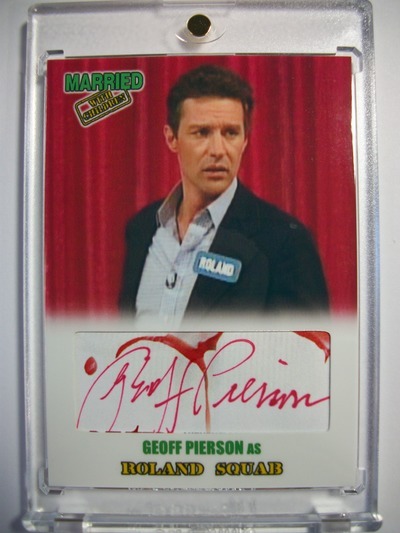 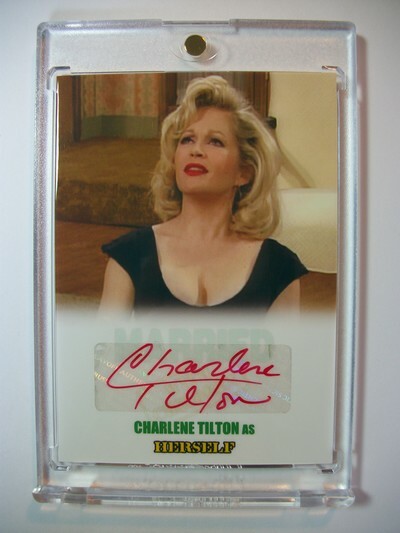 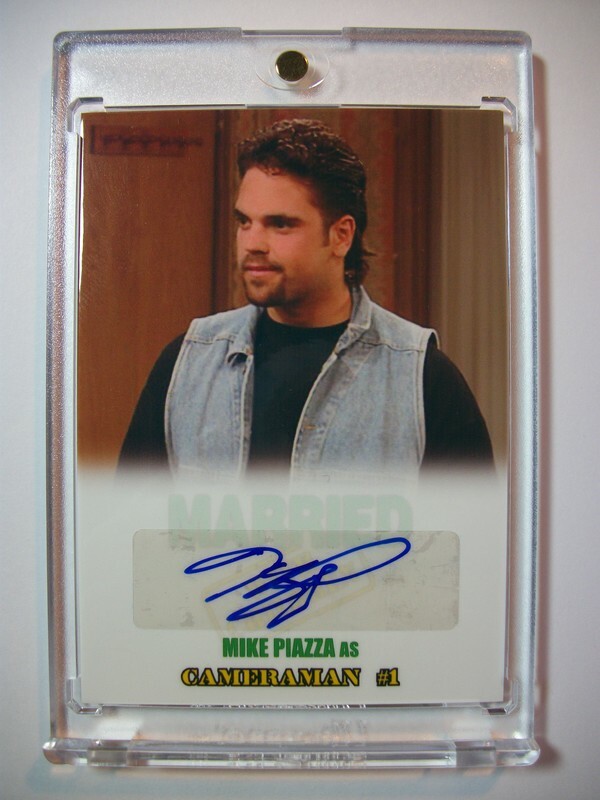 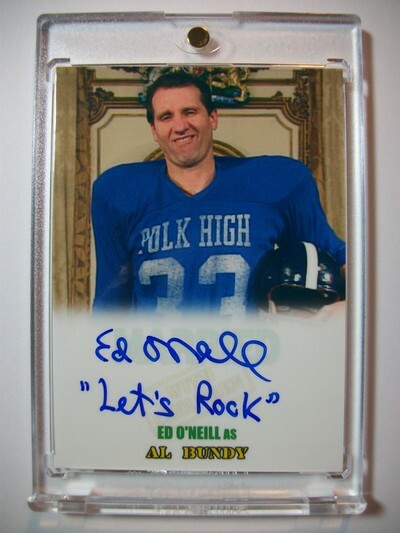 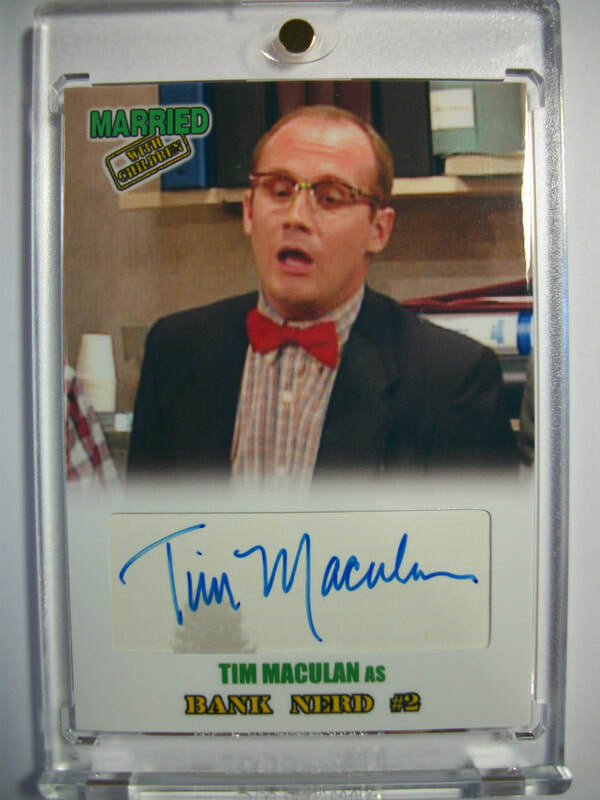 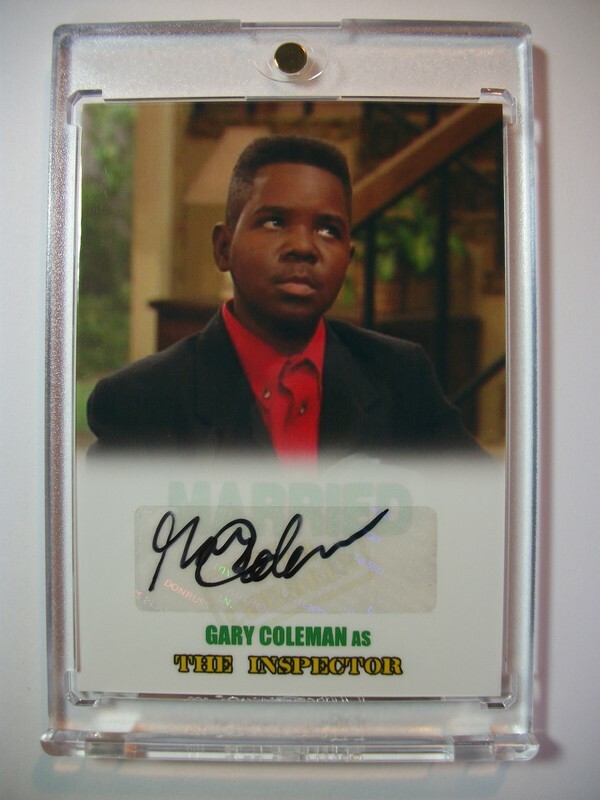 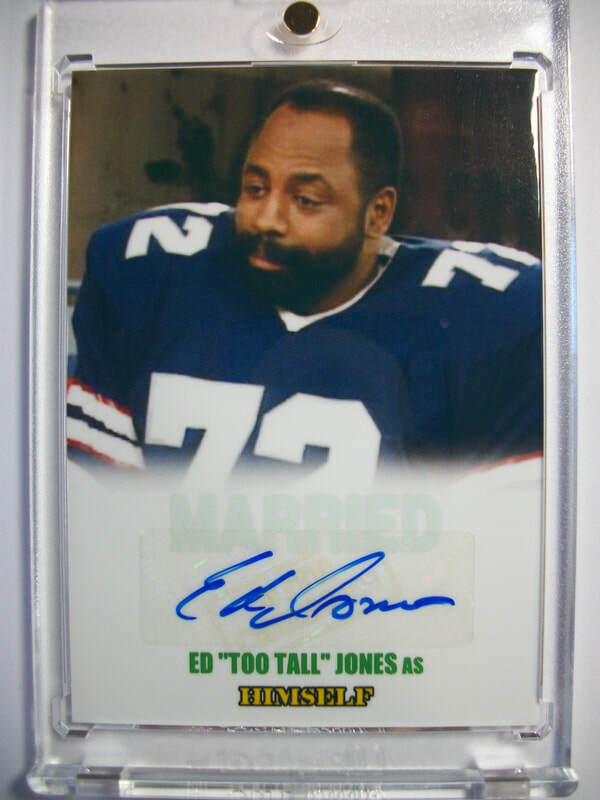 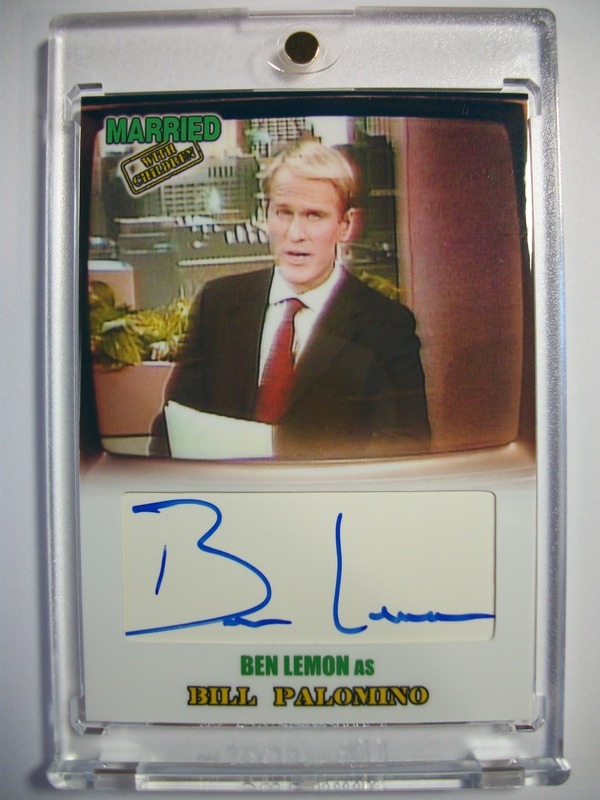 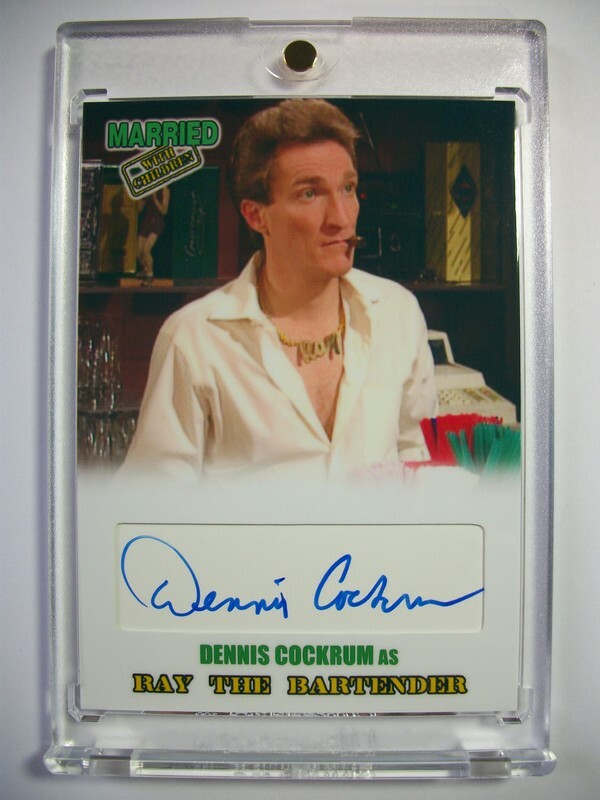 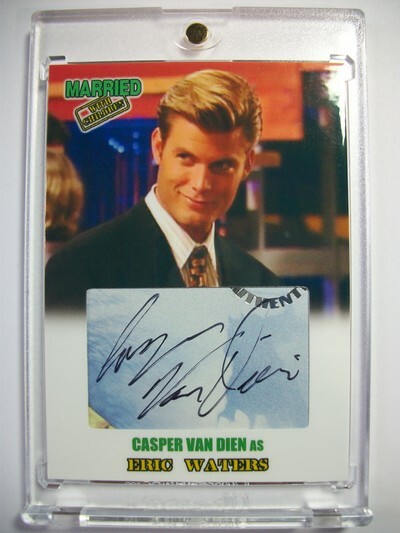 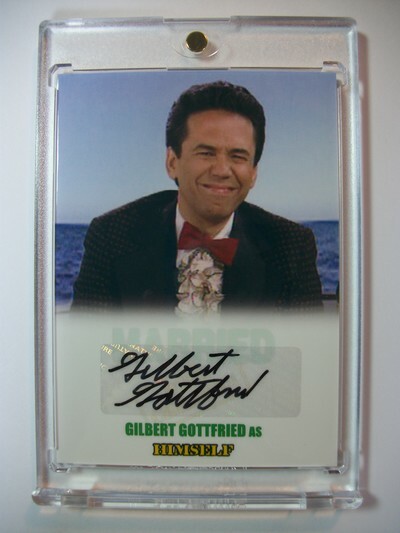 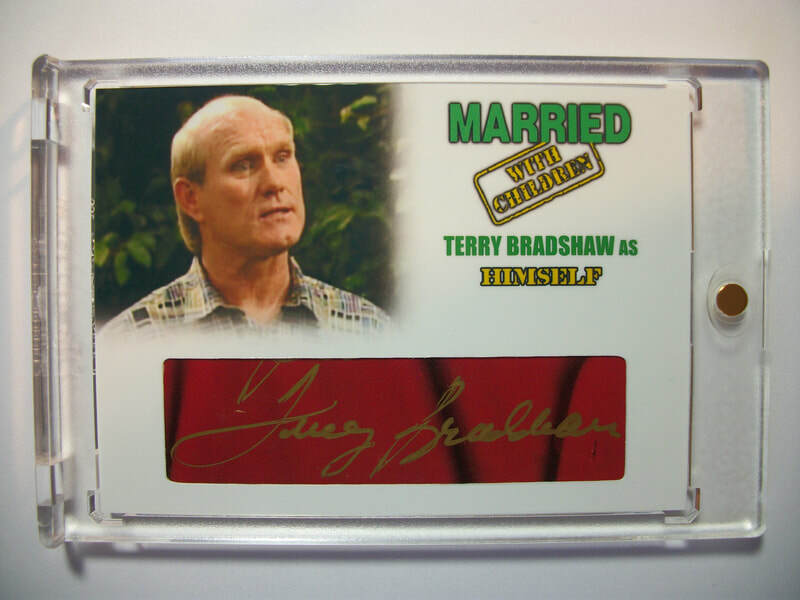 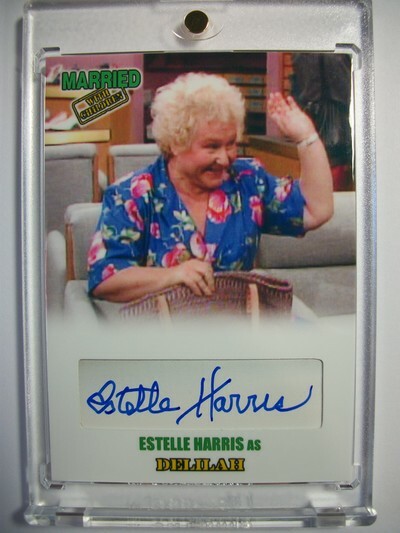 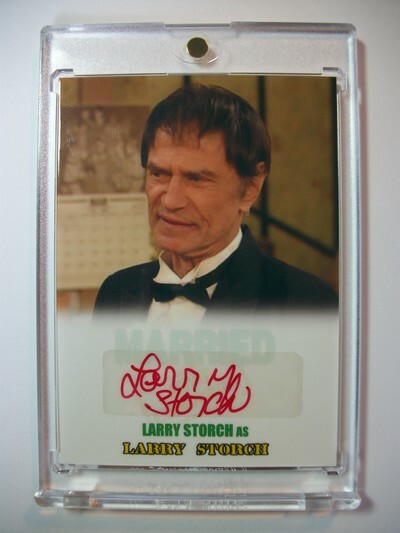 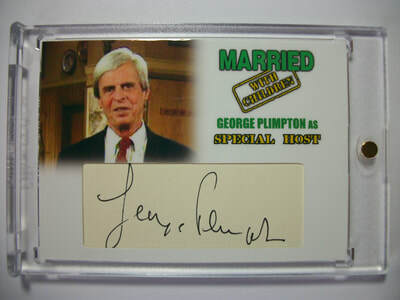 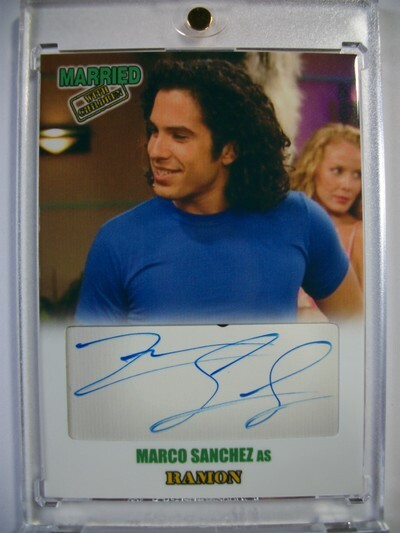 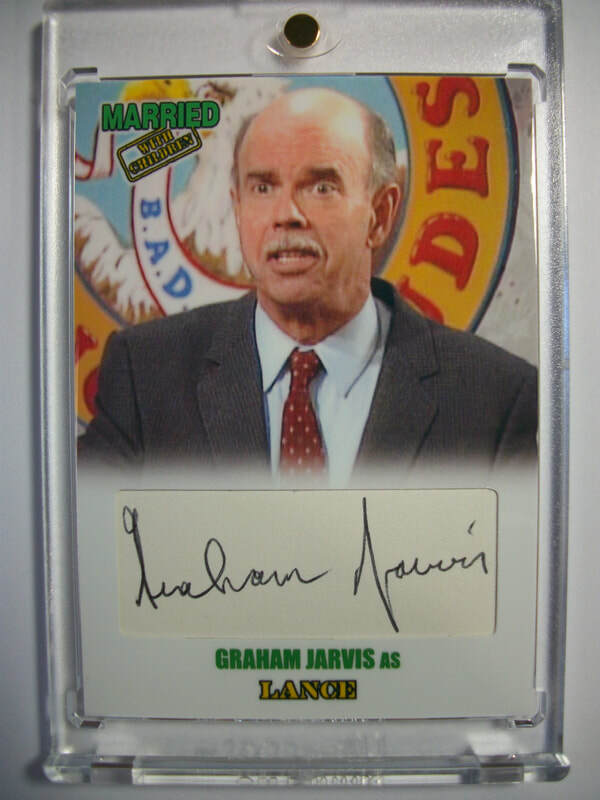 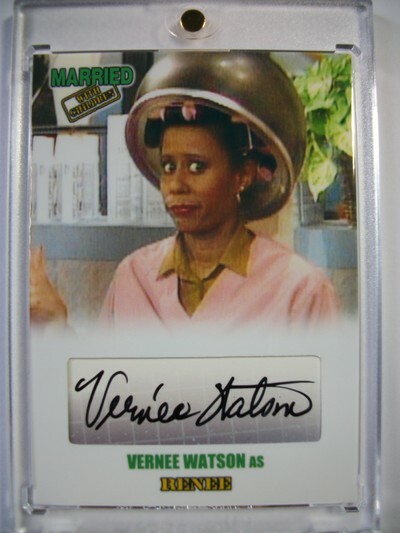 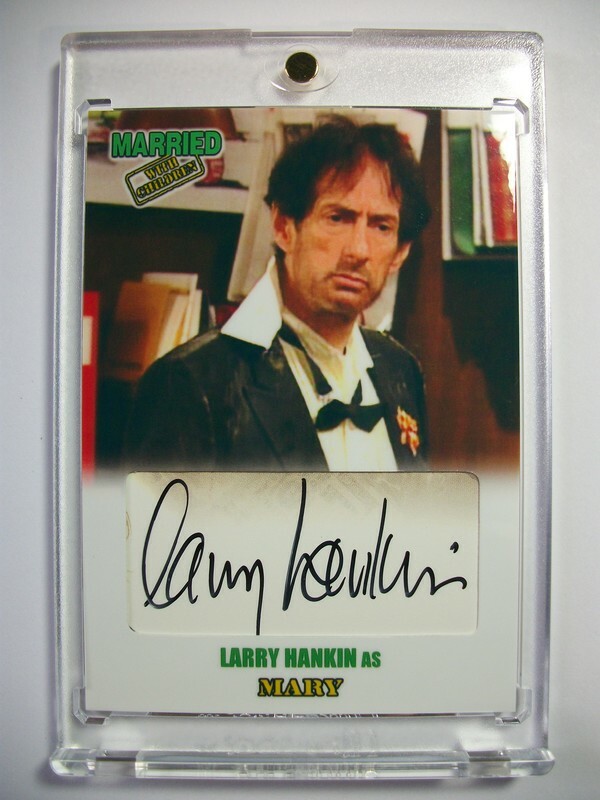 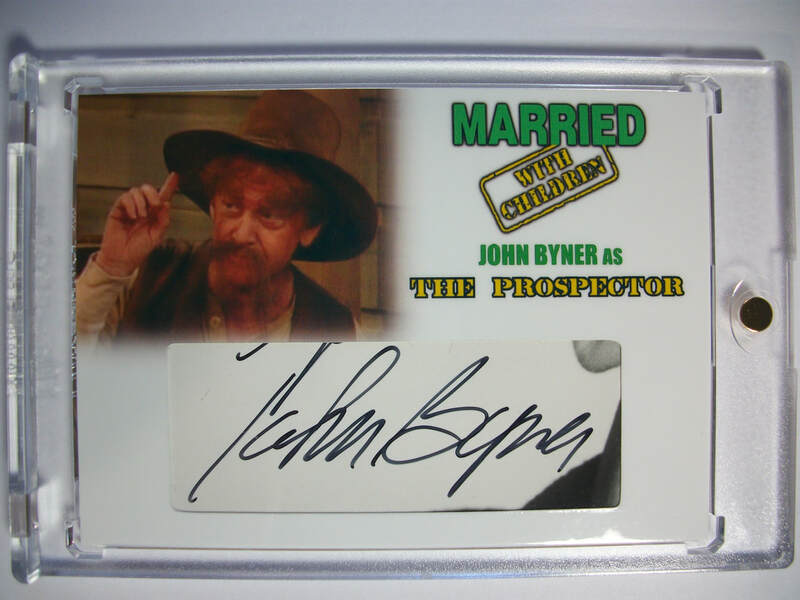 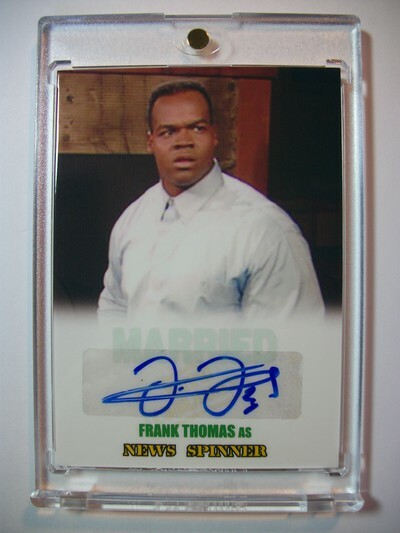 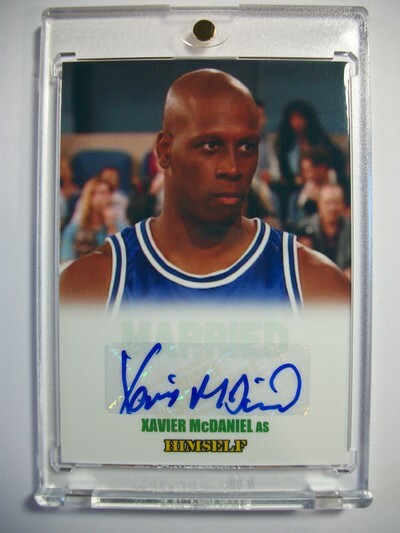 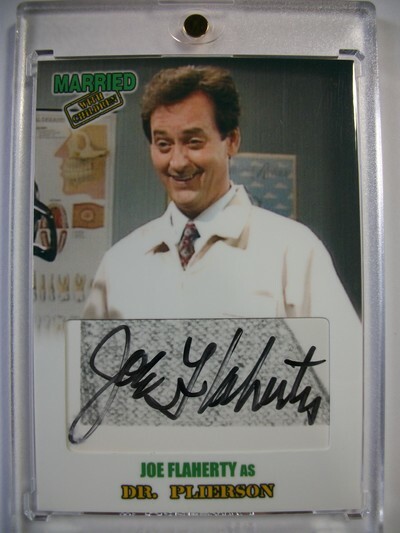 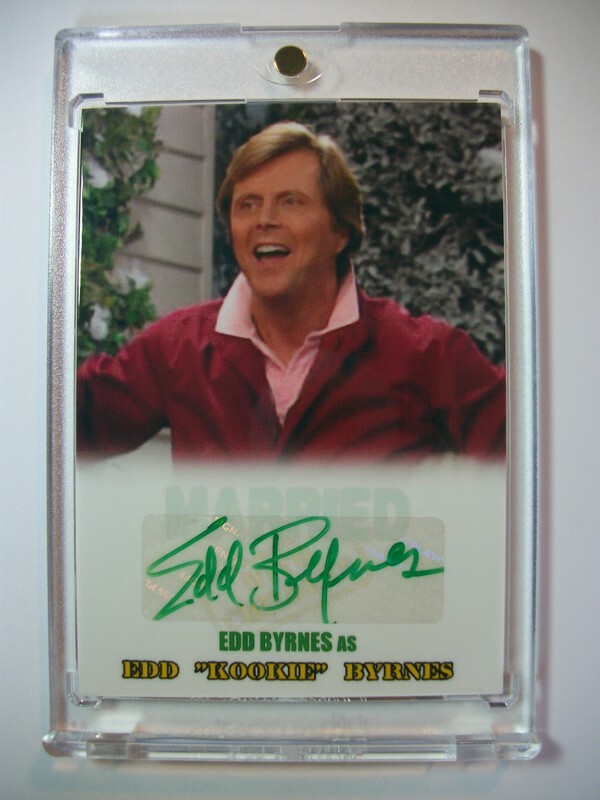 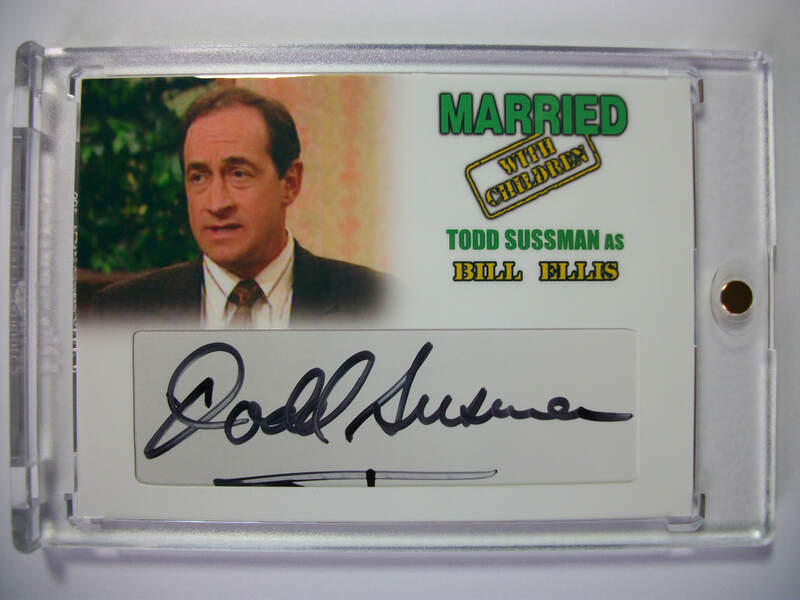 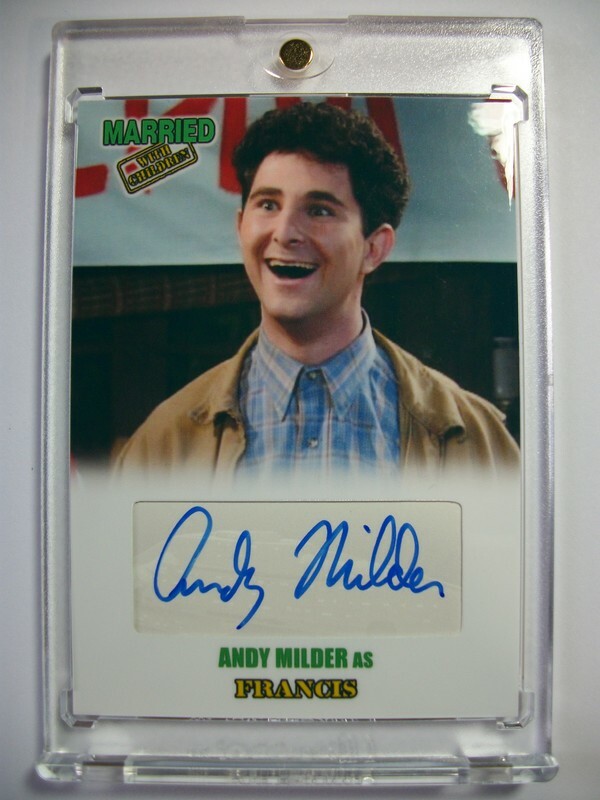 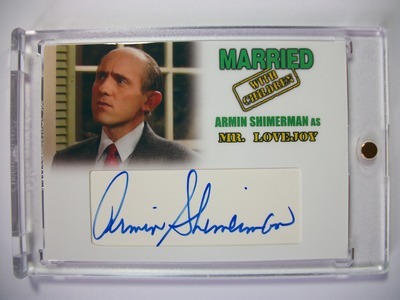 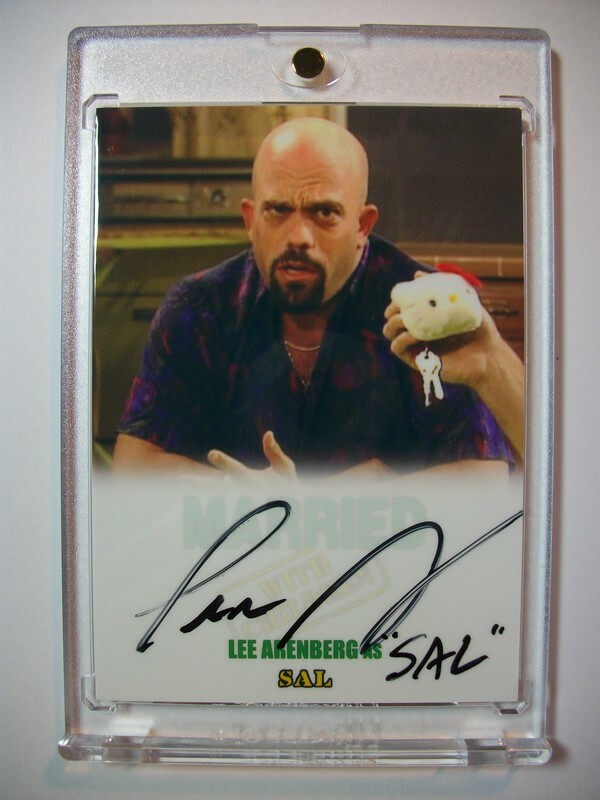 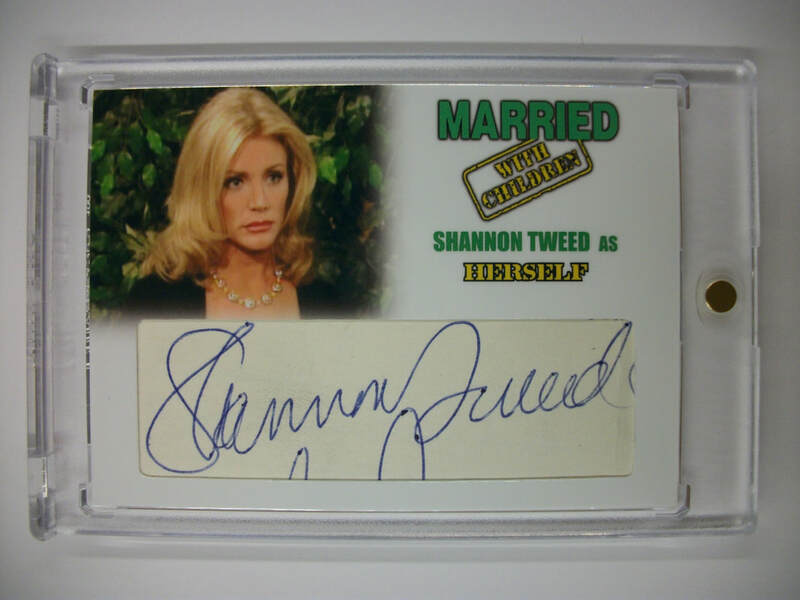 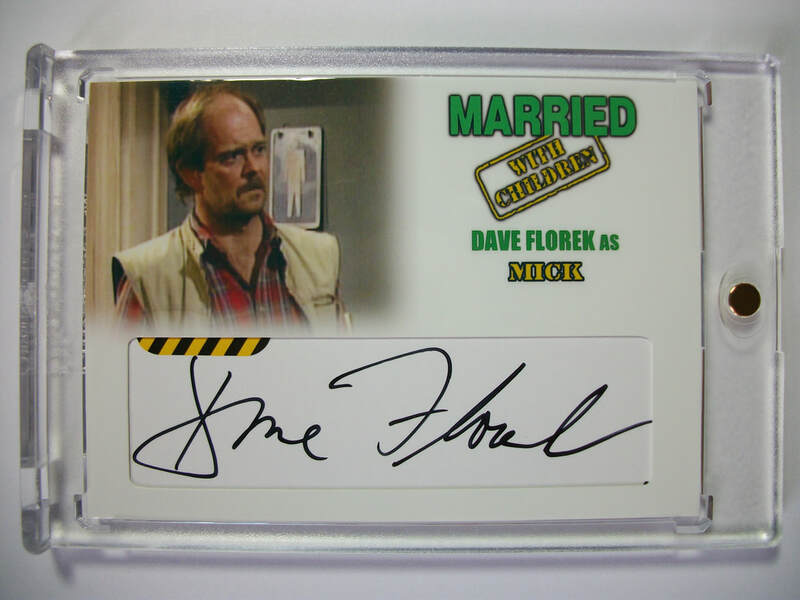 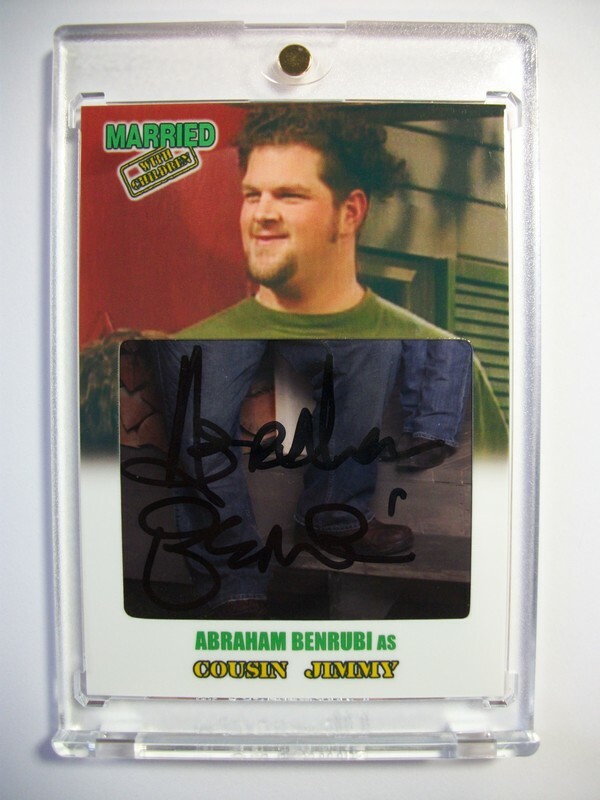 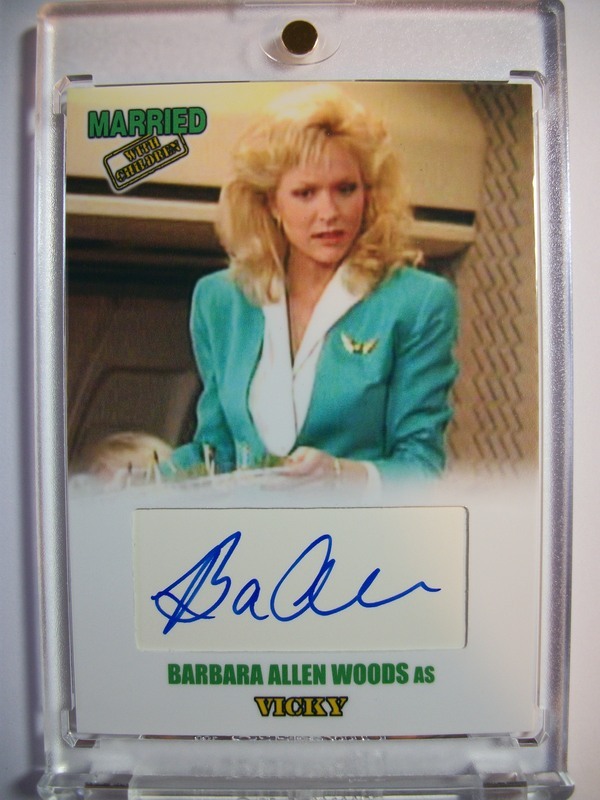 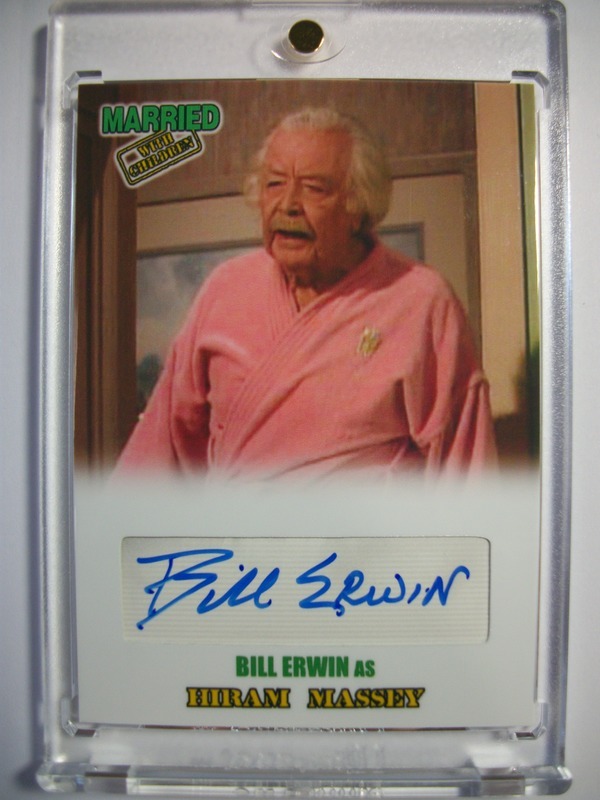 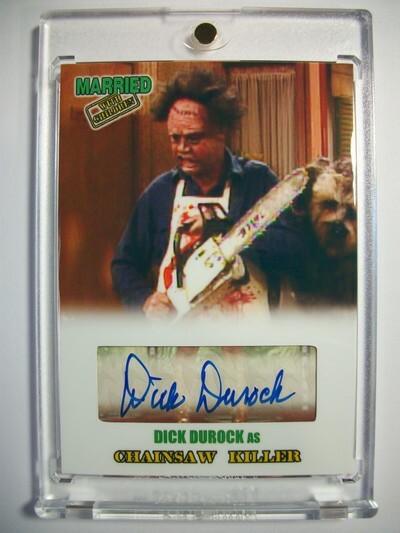 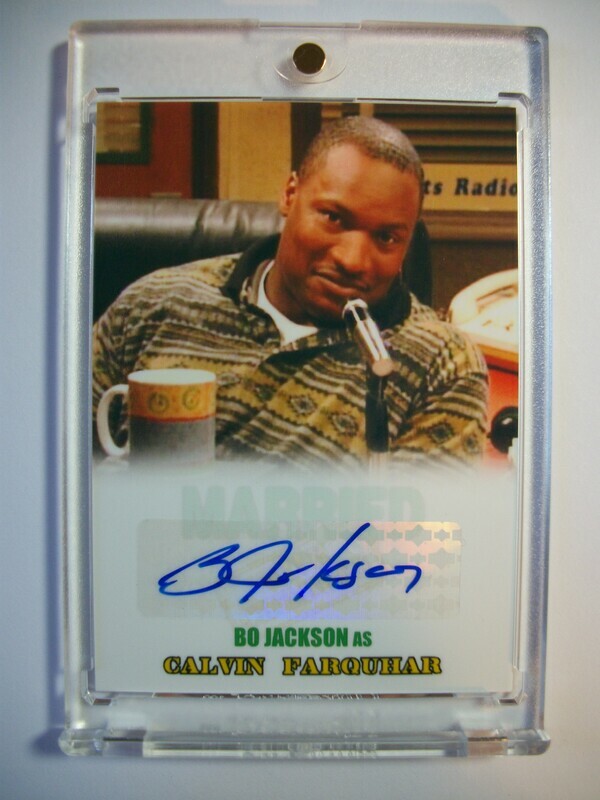 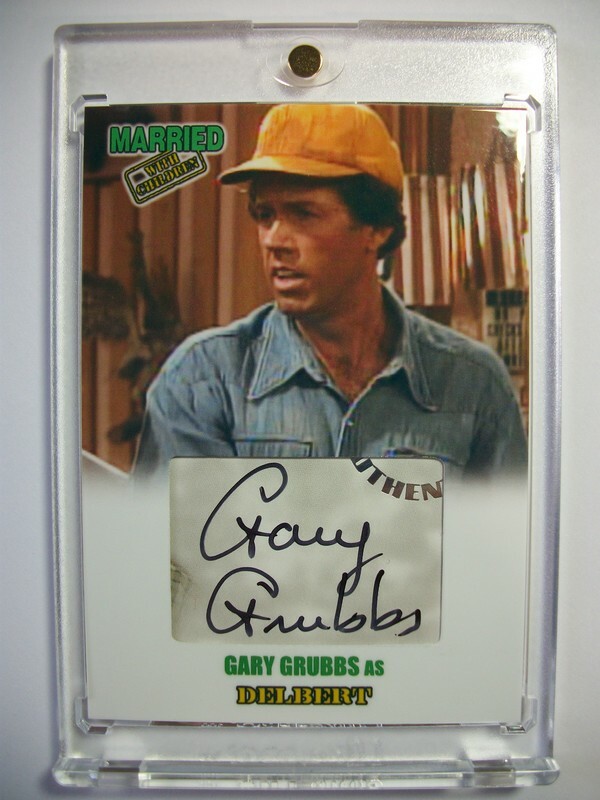 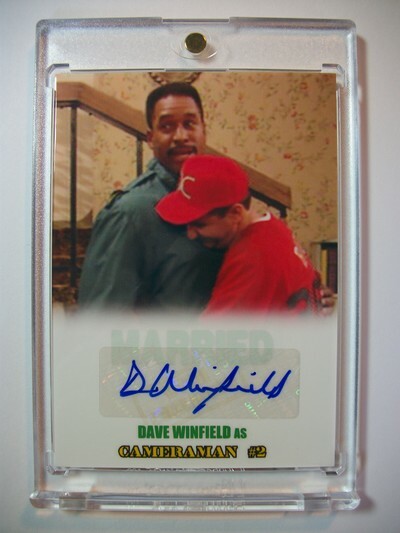 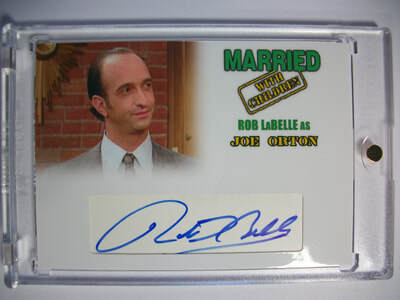 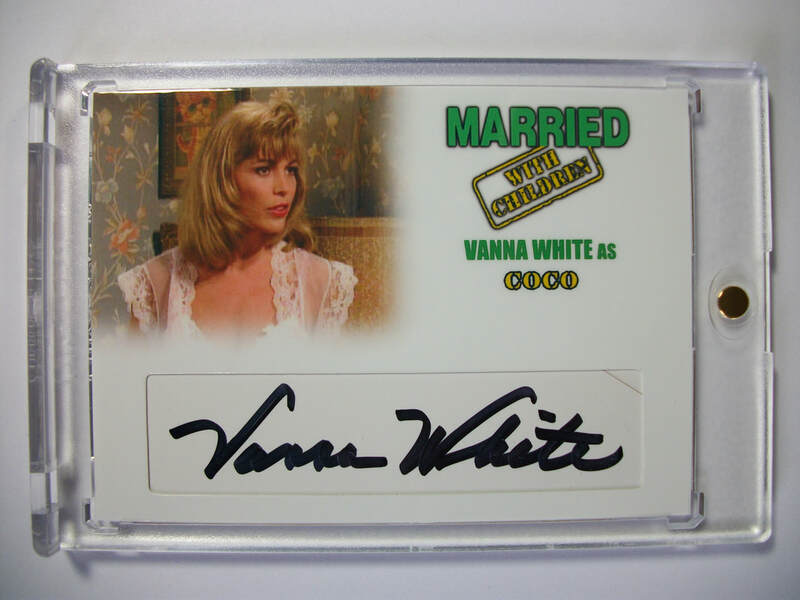 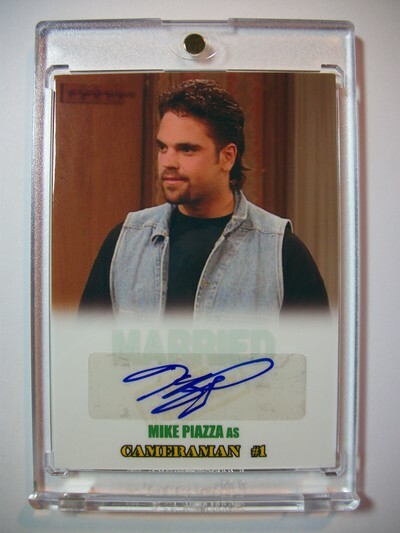 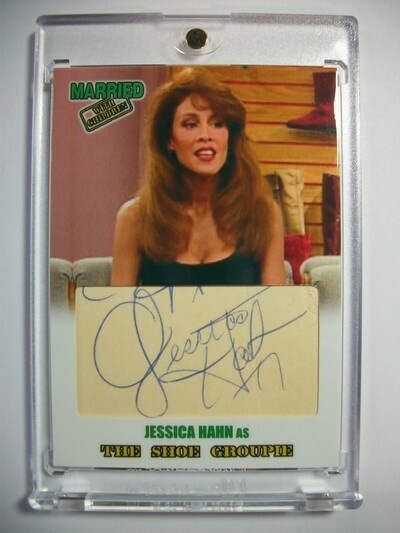 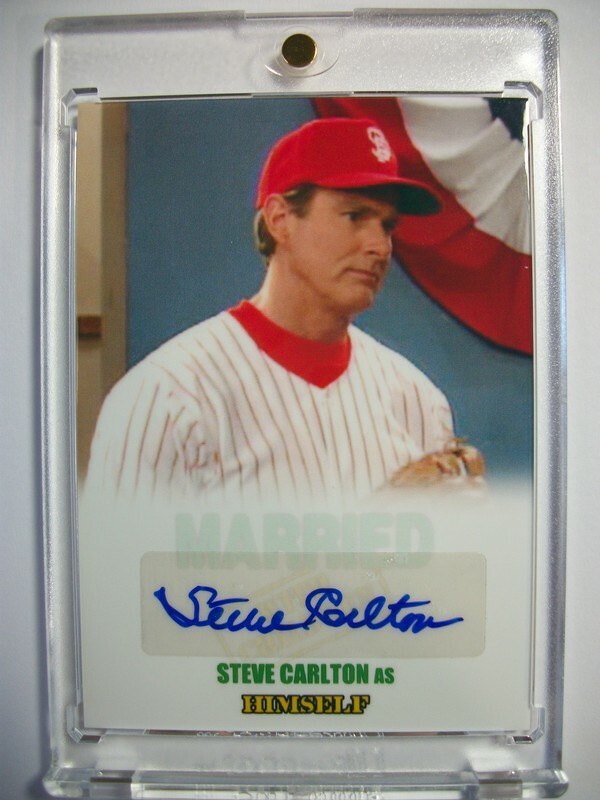 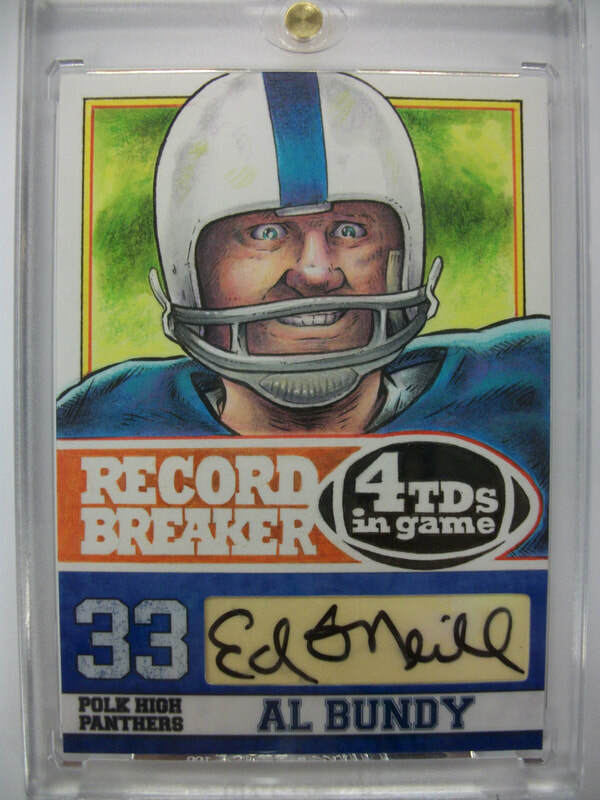 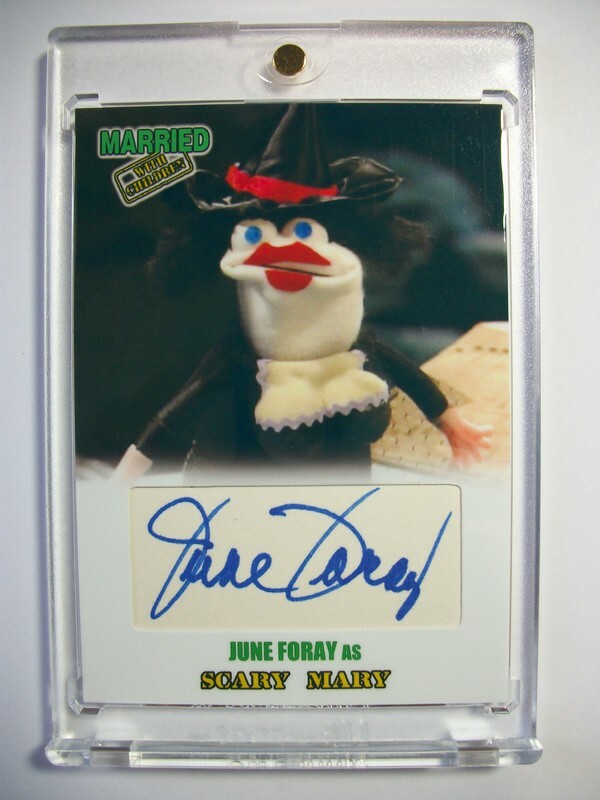 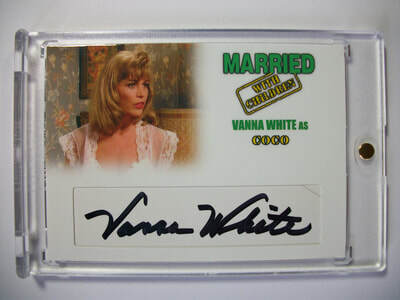 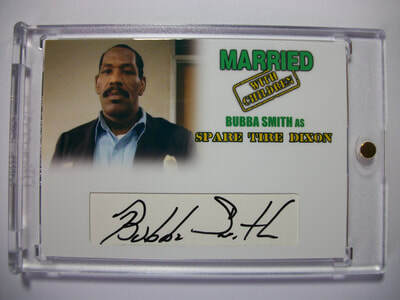 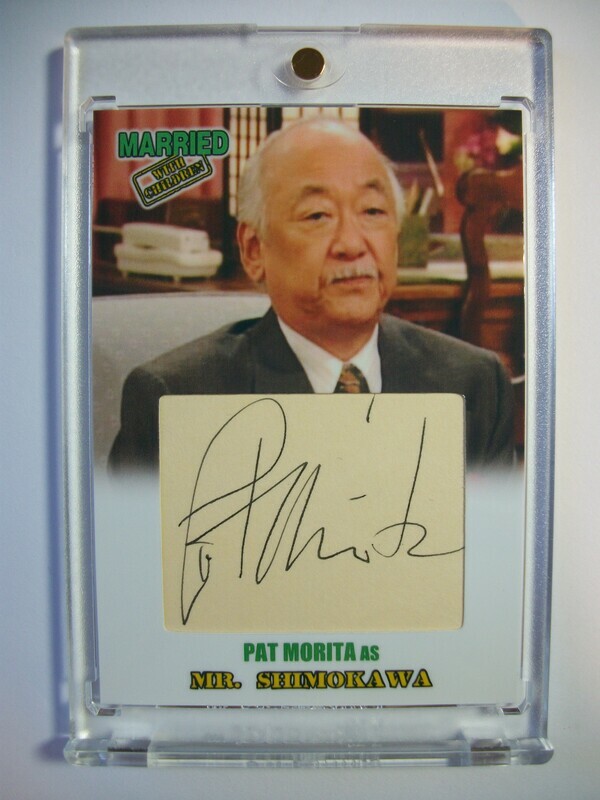 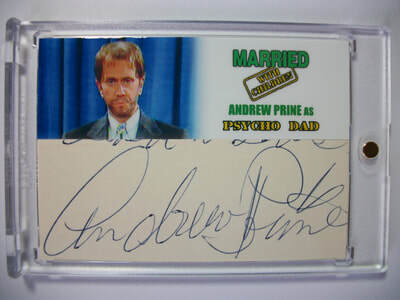 A really huge factor in making these cards special was the option of having the cards signed with their character names. 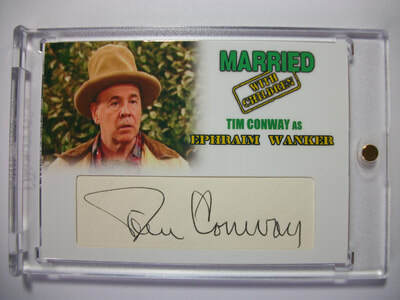 A big thanks to Chris Wyman at Official Pix for taking this on. 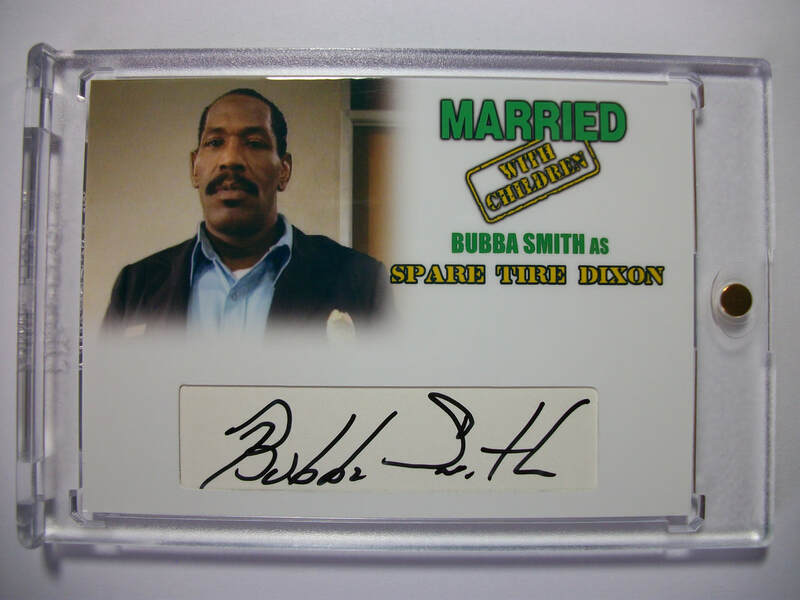 Here's some cards I made for characters that have already have a sticker autograph available. It was the only way I could add the likes of Mr. Clarke and Mr. Coleman. 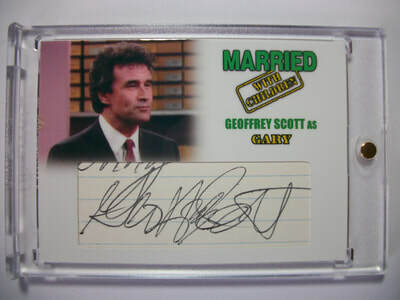 This is one of my first booklets I made for my own collection. 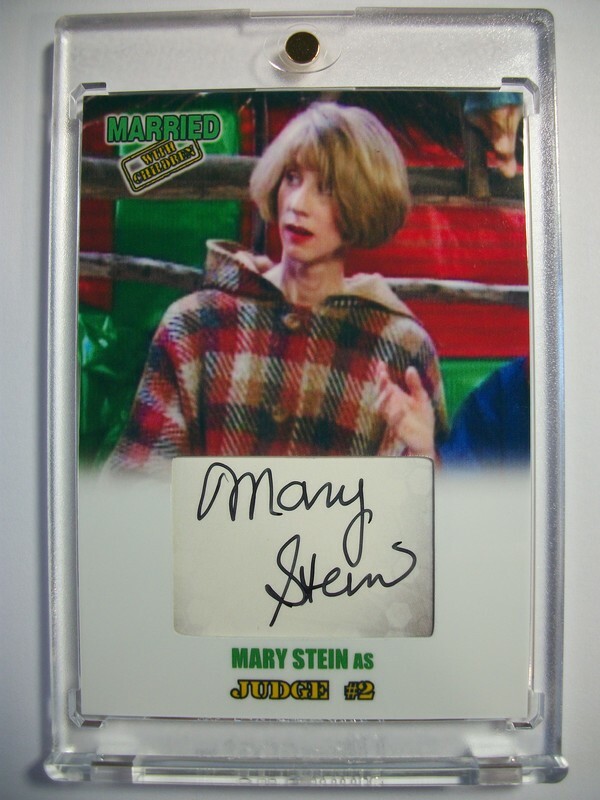 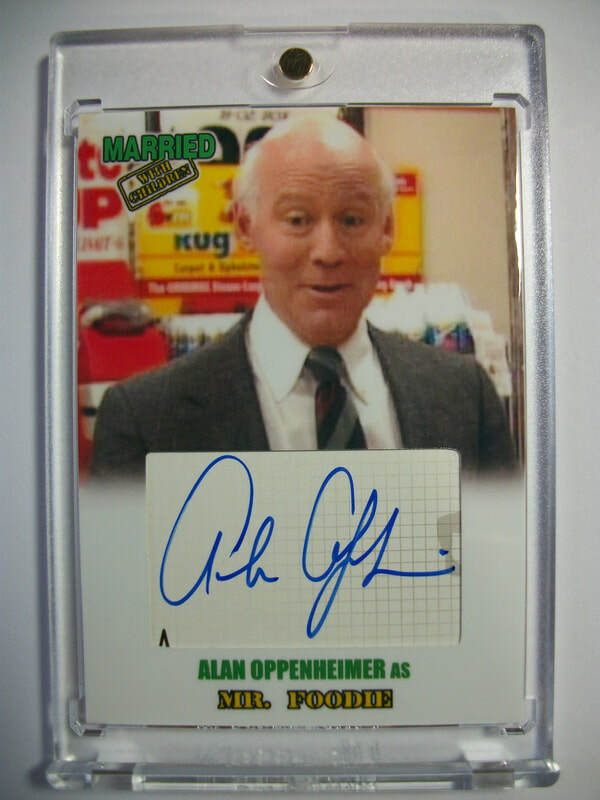 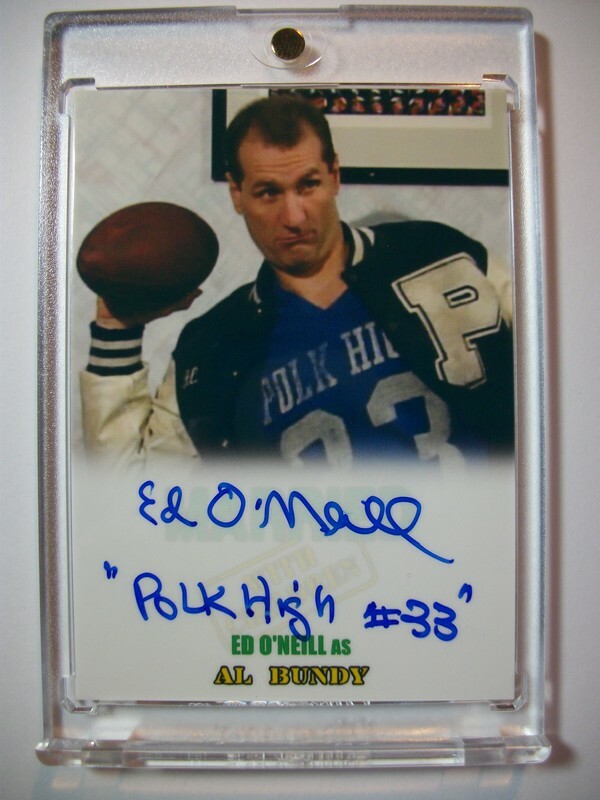 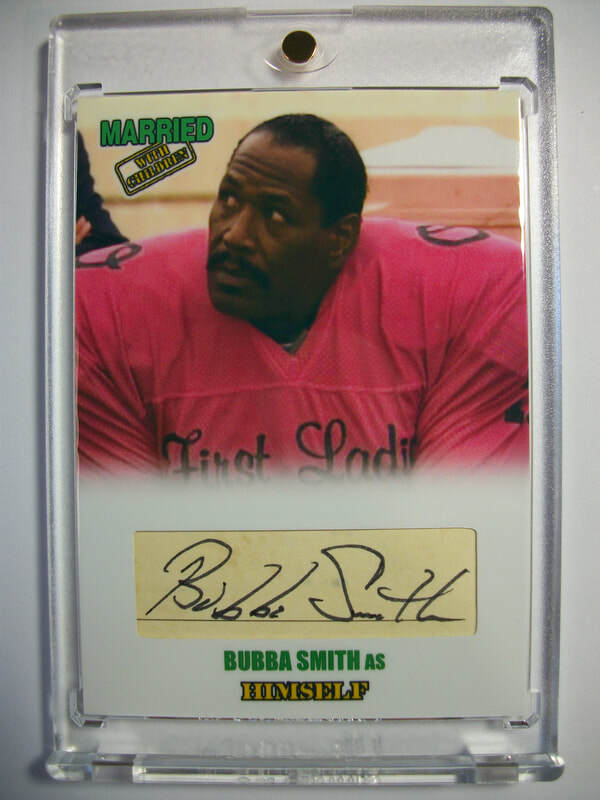 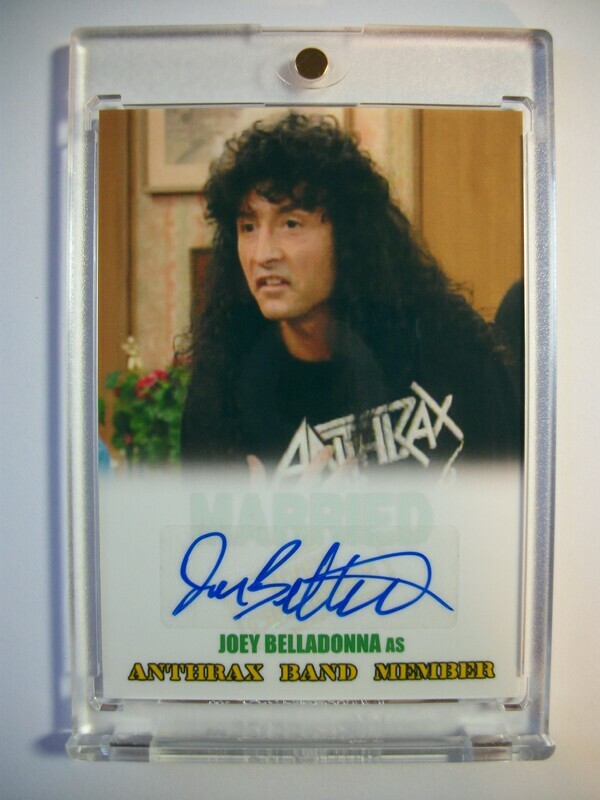 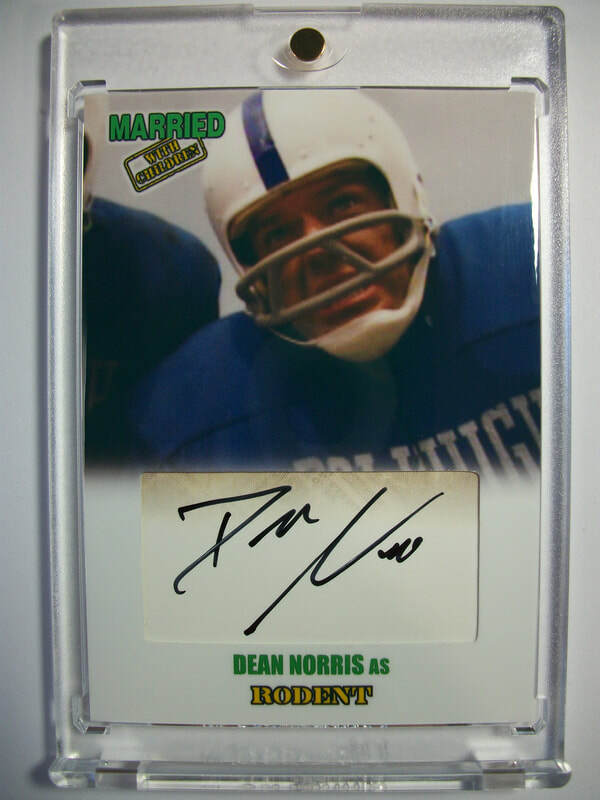 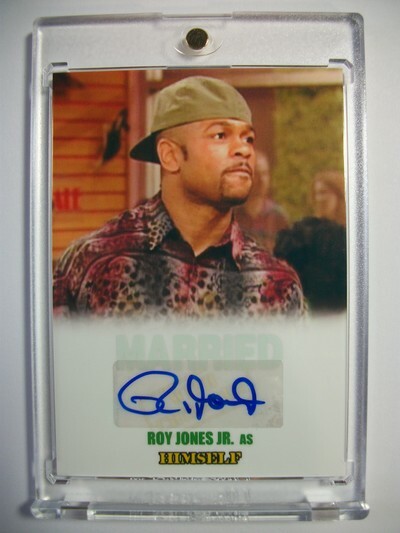 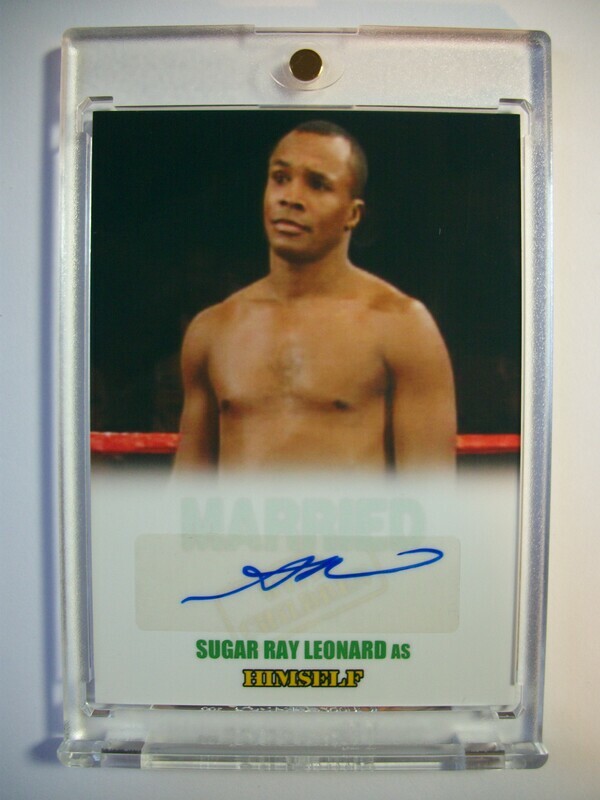 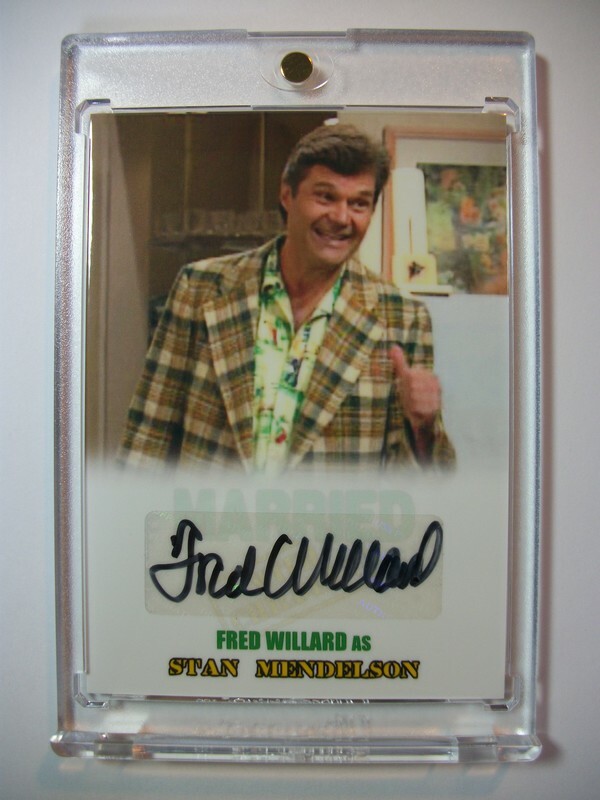 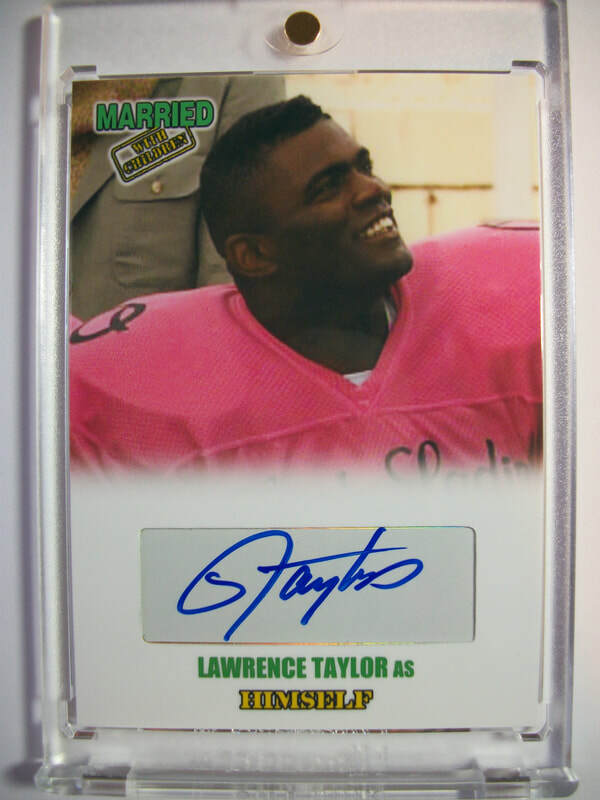 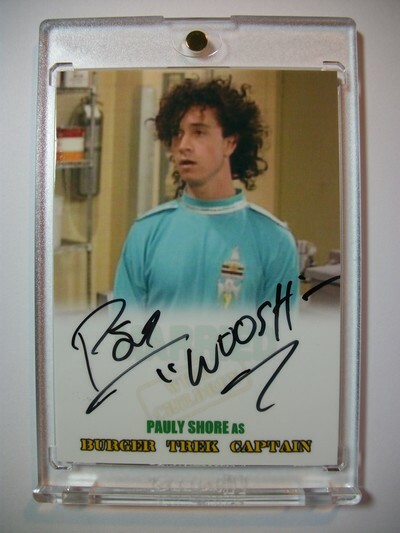 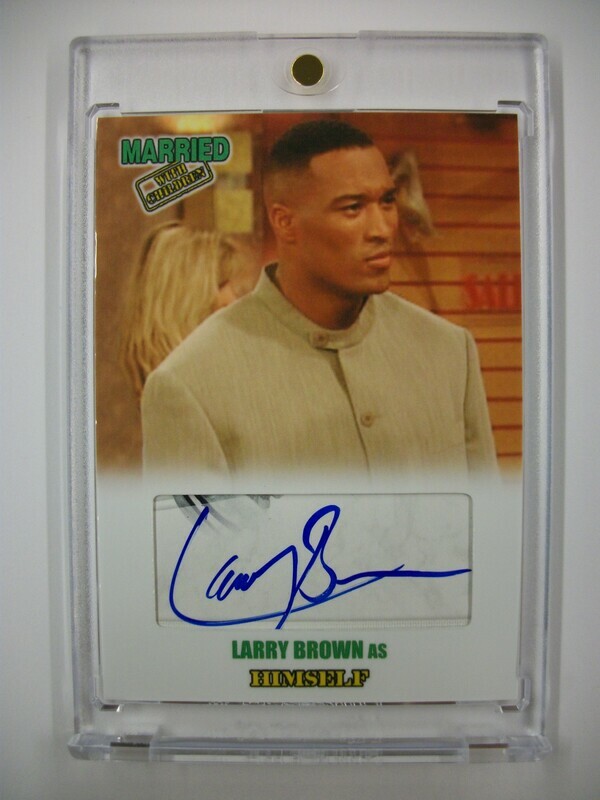 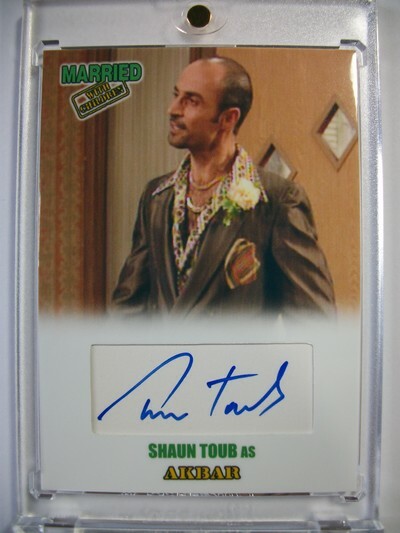 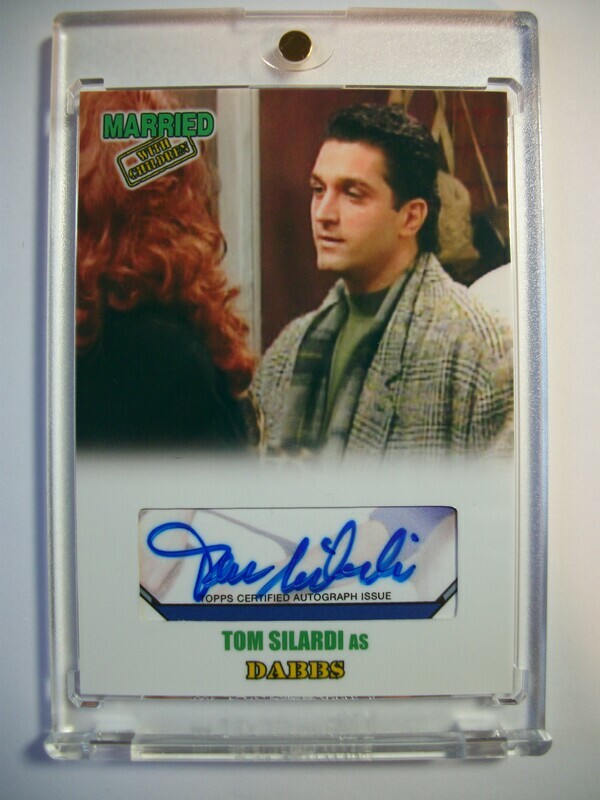 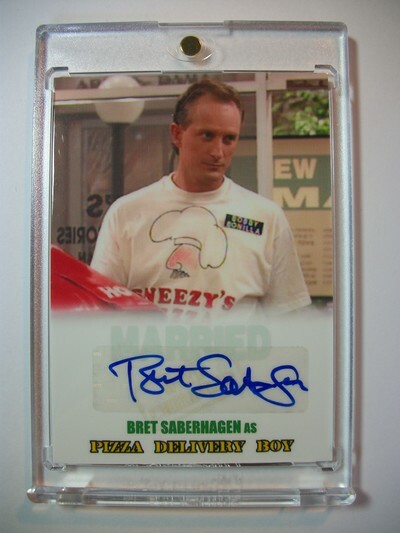 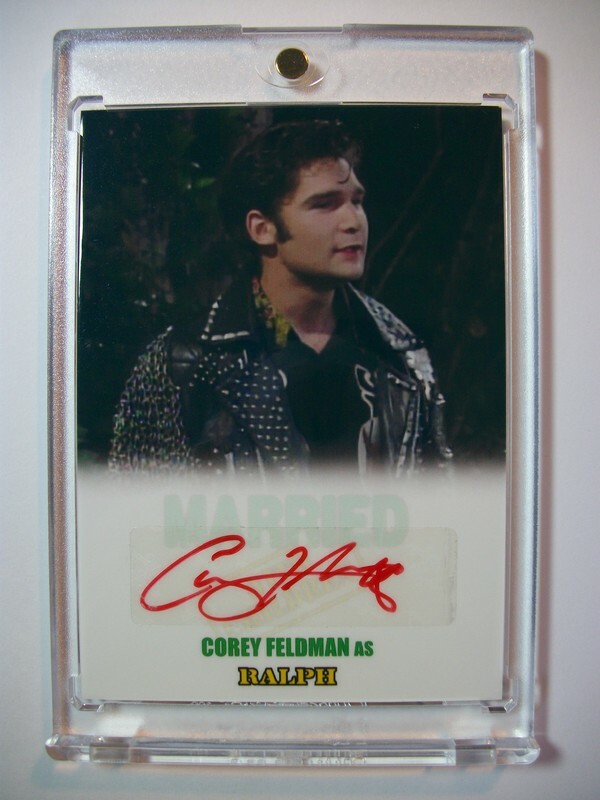 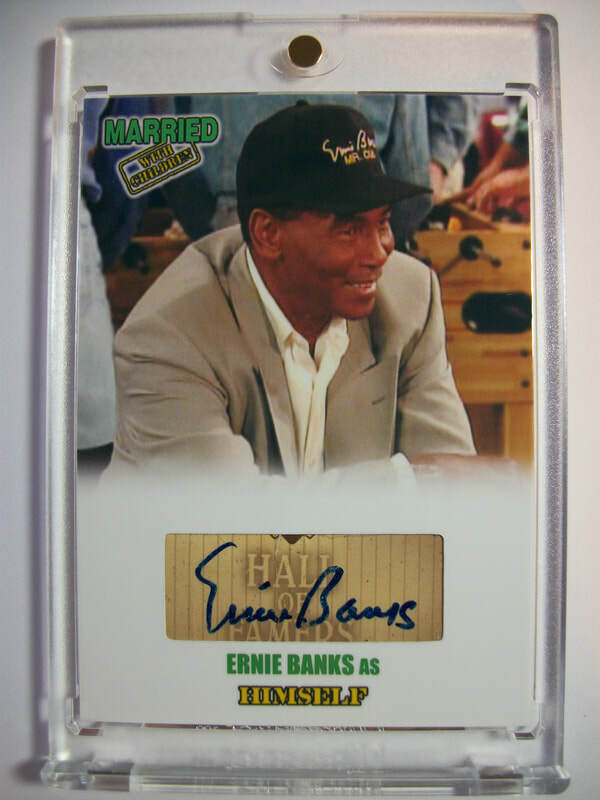 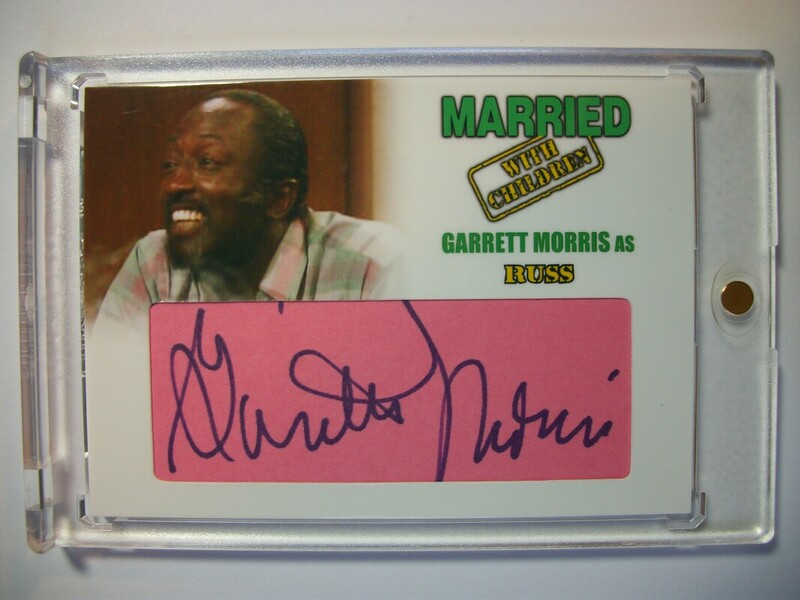 I used autographs from certified cards as well clothing worn swatches behind the photos. 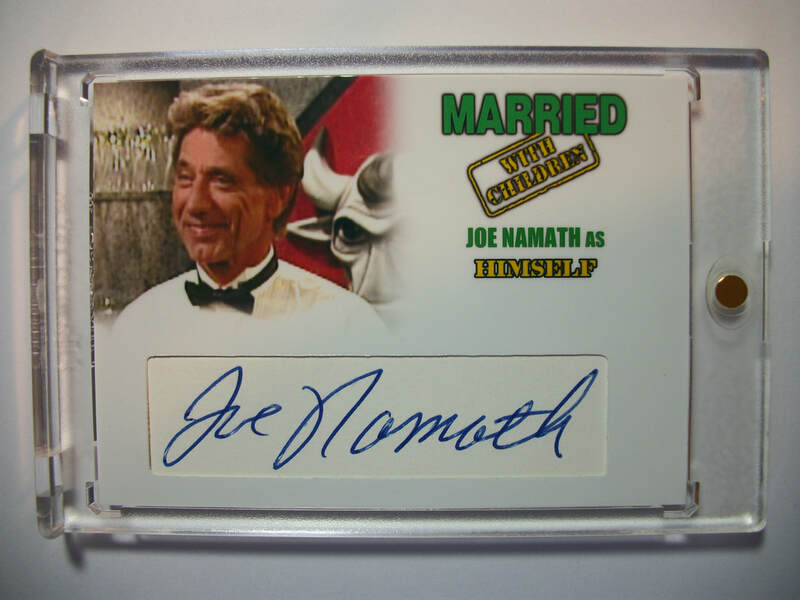 This booklet was made for a fellow who attended the 2015 Chicago National. It was on display there along with a custom pair of Polk High cleats his son created. This is an over sized card I made of the cast. 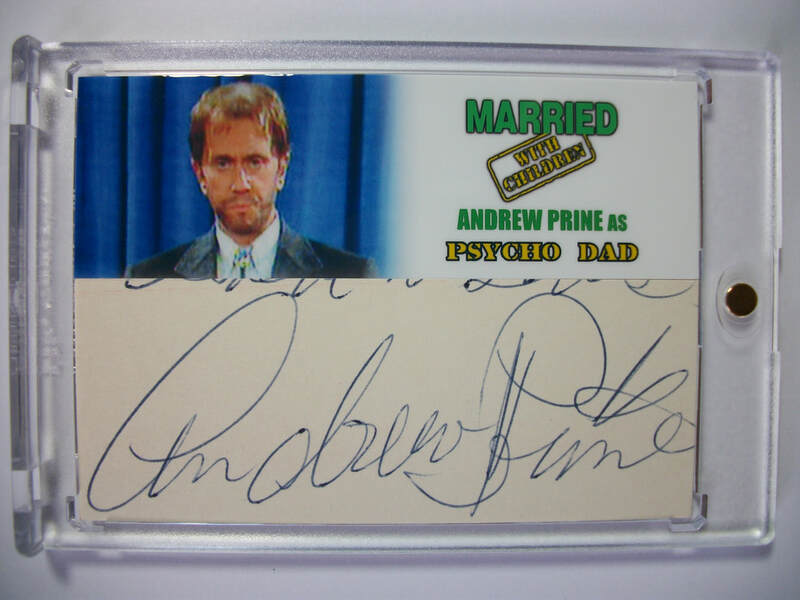 The inside art was created by artist Jennifer Allyn. I then built the card and embedded her art into the card. I also added certified autograph stickers from cards I purchased. 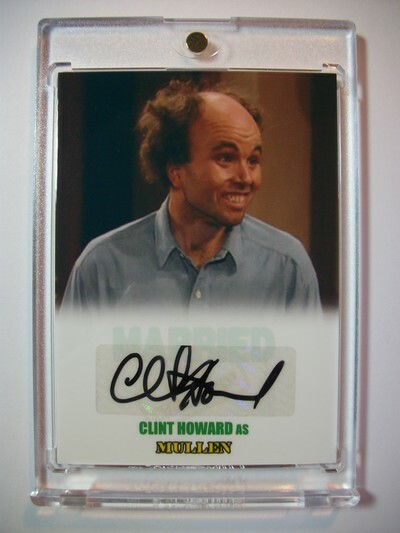 It was very labor intensive, but worth the effort I think....right? 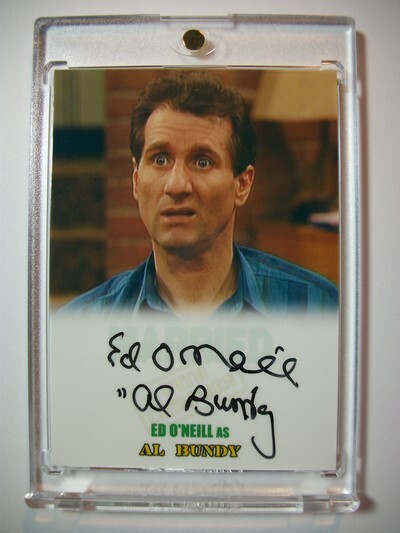 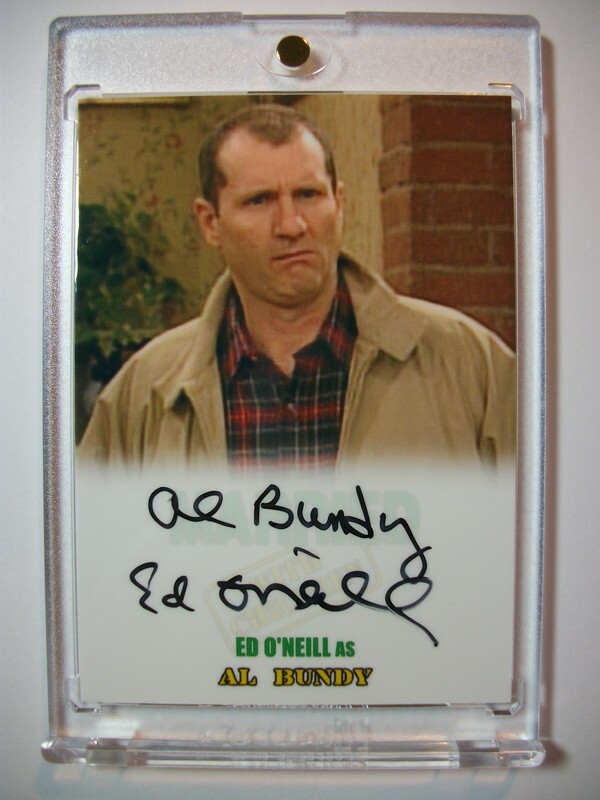 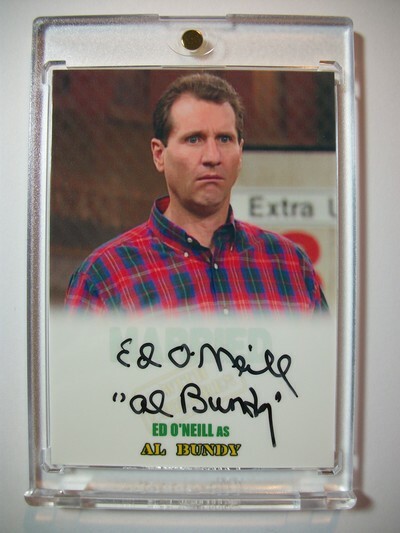 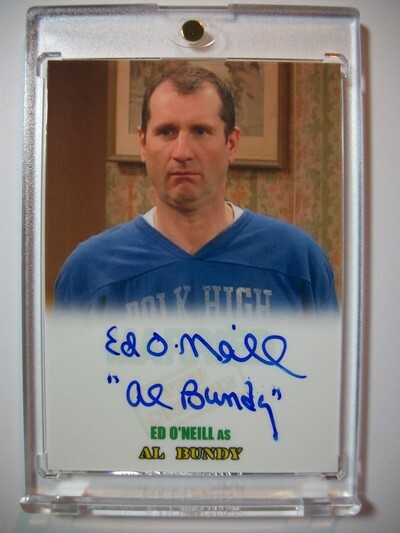 This spot reserved for Al Bundy Sketchagraph custom by Jason Crosby. 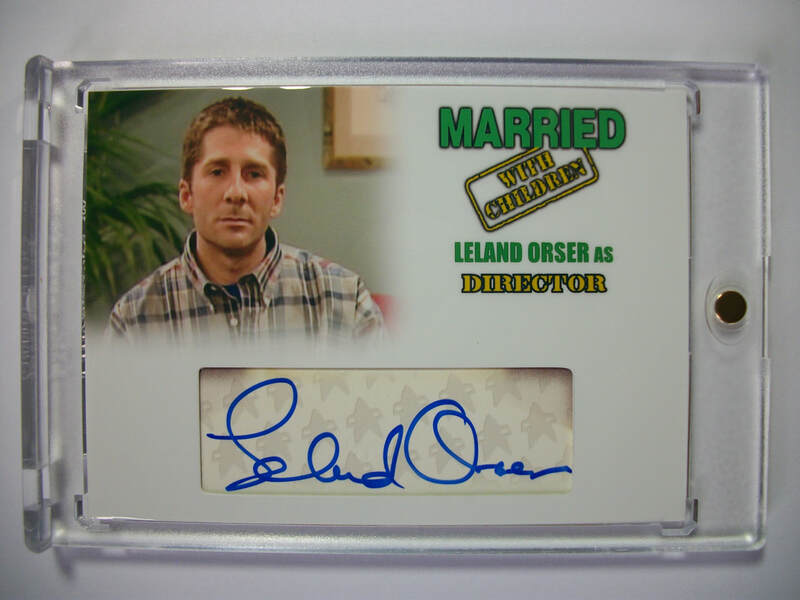 This spot is reserved for my Married With Children custom sketch booklets by Juan Rosales.